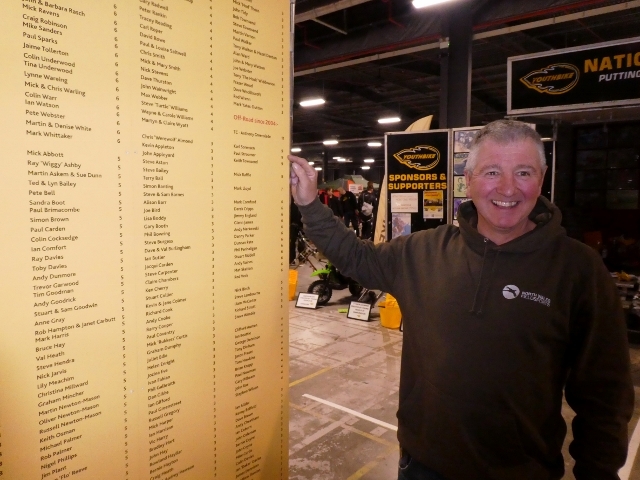 April 2019 – It was great to exhibit at the Manchester bike show – thanks to the organisers for making access so easy. We hope to see some new customers as a result. Paul has been 9 times ! 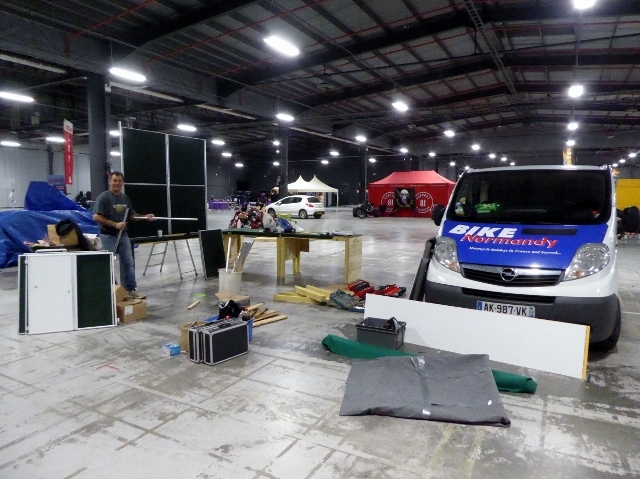 We’ll be exhibiting for the first time at the Manchester Bike Show 23 & 24 March 2019 at Event City, do come along & see us if you’re there. We’ve just had a cancellation on the Chateaux & Sancerre Wine Festival Tour (it was marked as FULL) so if you are interested please contact us a.s.a.p. 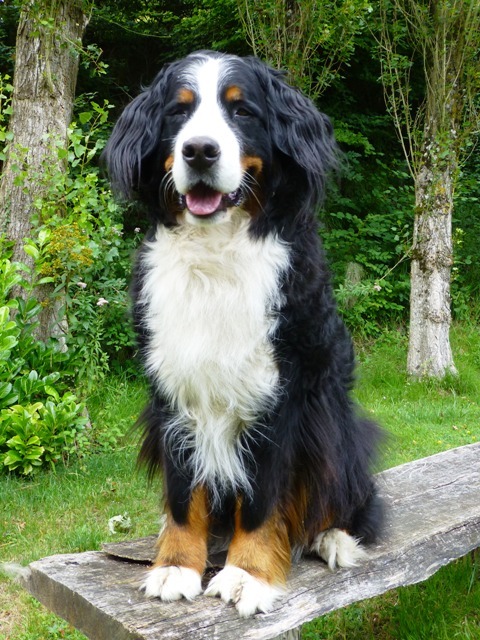 For those who remember Otto as a puppy, he is now 10.5 months old and has grown into a really handsome dog. He’s still a massive thief (John’s sandwich disappeared yesterday!) but lovely with it! He was really well behaved helping with the research. 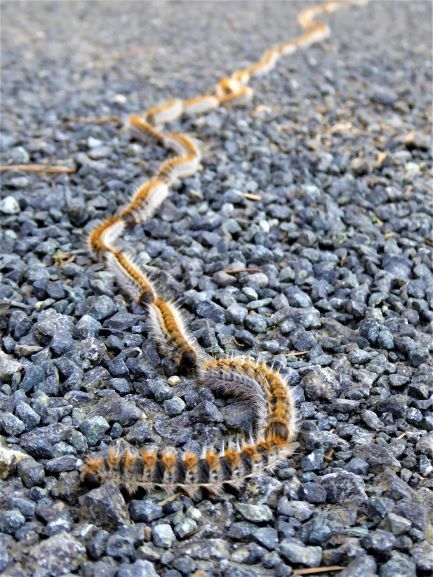 Watch out for these caterpillars !! Don’t worry you won’t ride this !! 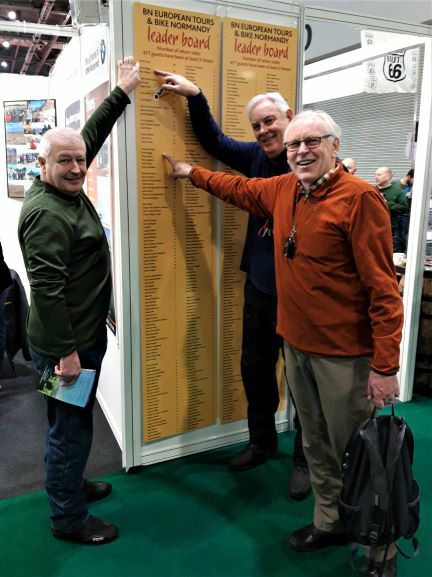 February 2019 – John exhibited at the ExCeL show in London and it was great to see many of our regular customers visiting our stand. 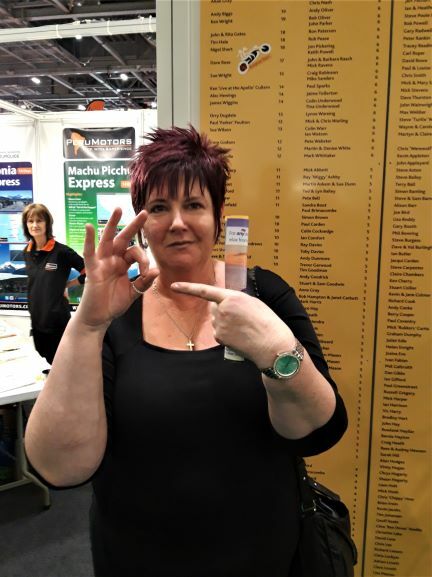 Come on Donna – time for a tour! January 2019 – Happy New Year ! 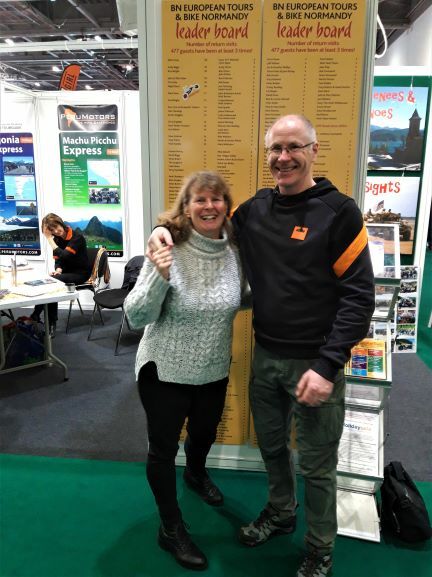 For those interested in our new Spain/Portugal Tour we shall be undertaking all the research in March so please bear with us until then for a definitive itinerary…We (or rather John) will be exhibiting at the London ExCeL show 15 – 17 February, do come & see us if you’re there. 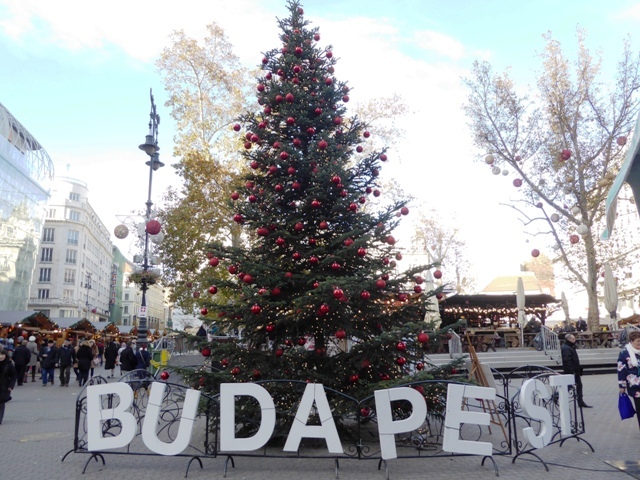 December 2018 – We wish you a Merry Christmas & a Happy New Year !! 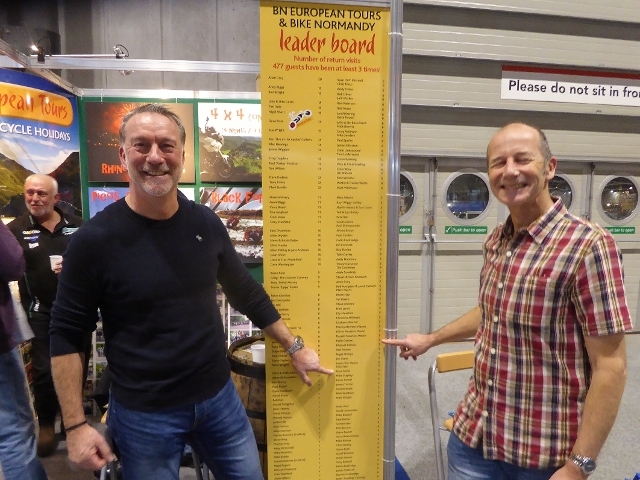 November 2018 – We’ve finished exhibiting at the NEC and have taken the big step in relocating to Somerset! 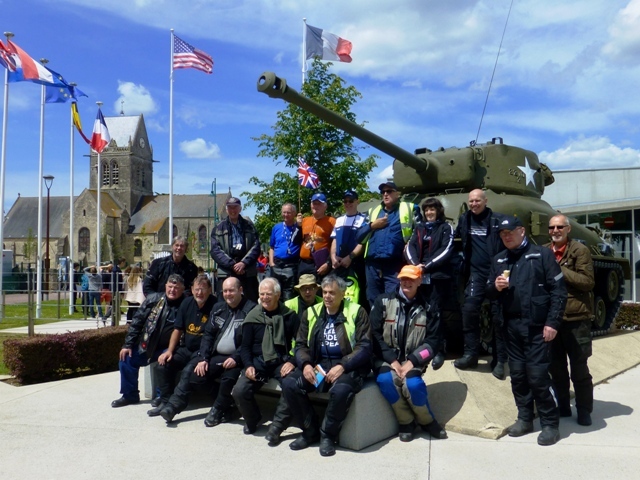 The Bike Normandy Short Breaks and Off-Road activities only have ceased but we shall continue to run the longer BN European Tours as usual. 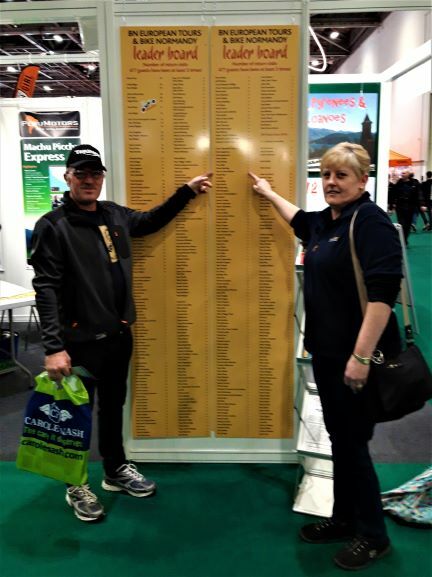 It was great to see so many customers at the NEC and we look forward to seeing many of you again next year together with new people we met at the show. 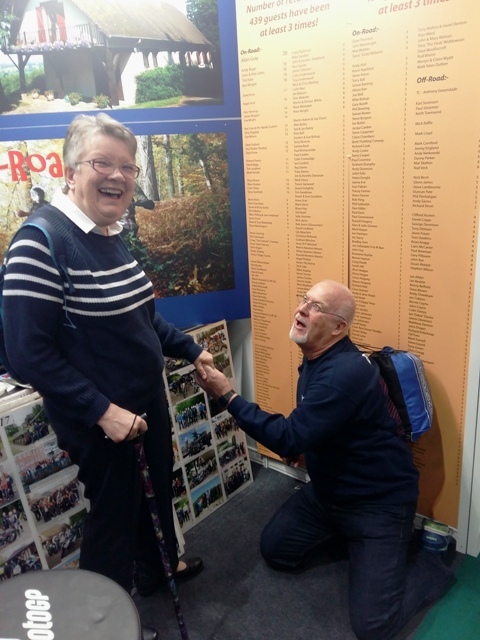 Thanks to Dave & Garry for helping man our stand again and we should also add a big “thank-you” to Jane Andrews for acting as our UK representative for the past 5 years – as we have moved back to the UK Jane was unceremoniously “fired” when on the Picos tour earlier this year!! We have a new logo now showing on the website plus new design t-shirts & stickers – these will be available next year!! It’s trouble! Tom & Ken arrive! Russ & Keith are on 5 – see you next year guys ! Ken has been 19 times !!! 20 next year ! 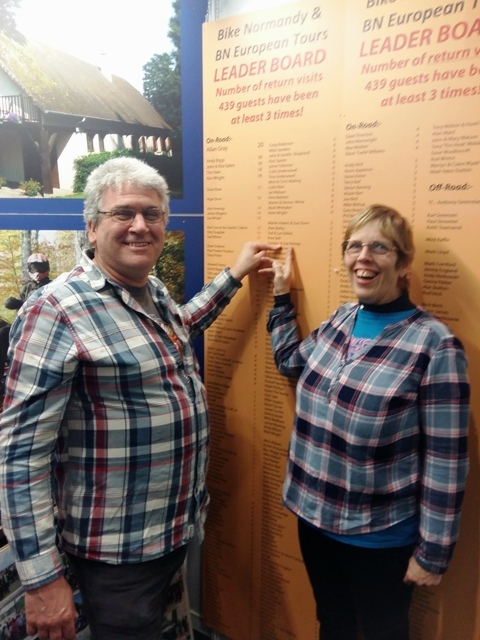 Andy & Ros are on 4 – up to 5 next year! October 2018 – The WW2 Extended Sights Tour and the Autumn Glory Tour were both great successes – the reviews are now live. Bookings are rolling in for 2019 – do get in touch if you’re interested in a tour as places are limited. 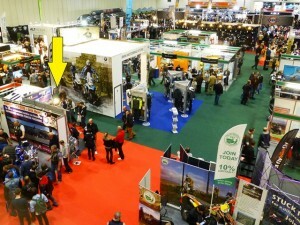 The Bike Normandy off-road season has started and then we’ll be at the NEC. September 2018 – Back from the Italian Lakes & Swiss Alps Tour – a fabulous trip – the review is now live. 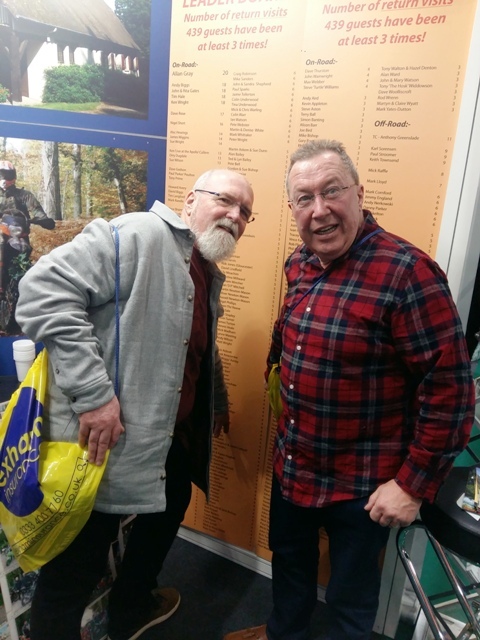 We’ll be at the NEC Motorbike Show which runs from 17 – 25 November 2018 on stand 4A28 – do come & say hello if you’re there. August 2018 – Back from the Rhine in Flames Tour which was amazing as in previous years. The review will be live in the next few days. Due to massive demand we have scheduled the 2019 tour dates and many places have already gone – if you’re interested in doing a tour then please let us know before it’s too late! 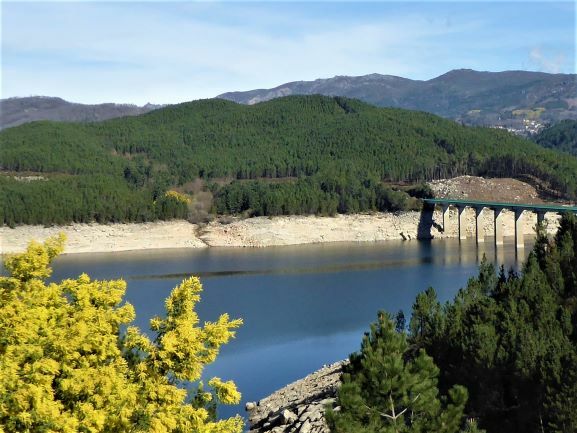 There will be a new tour to Northern “Green” Spain and the “River of Gold” in Portugal in September 2019. We plan to do the research in early 2019 and will then be able to finalise details & price. 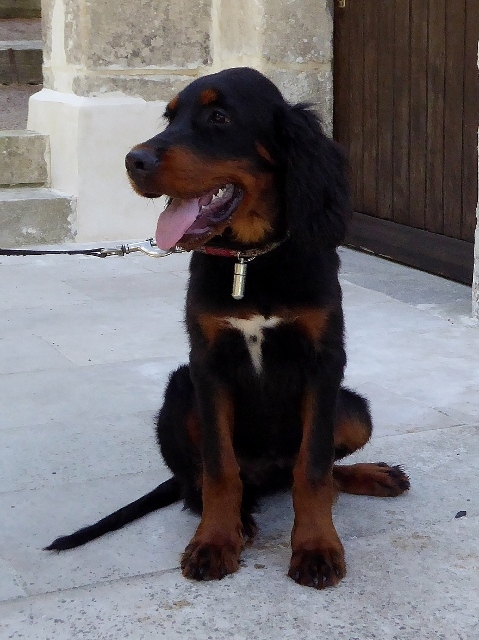 Otto continues to grow at a pace and is becoming even more handsome! July 2018 – We have just received a Cancellation on the Rhine in Flames Tour 8 – 13 August 2018 – one bike place available for either a couple or single rider – please contact us if you’re interested – first come – first served !! Taken already ! 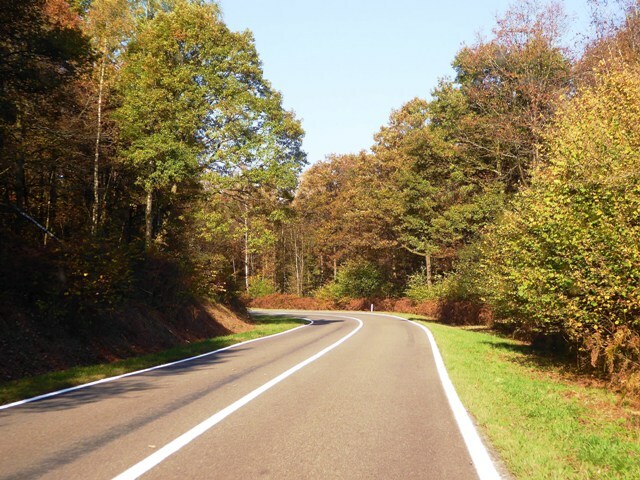 The Black Forest & Vosges Mountains Tour review is now live – another tour with fantastic weather this year. 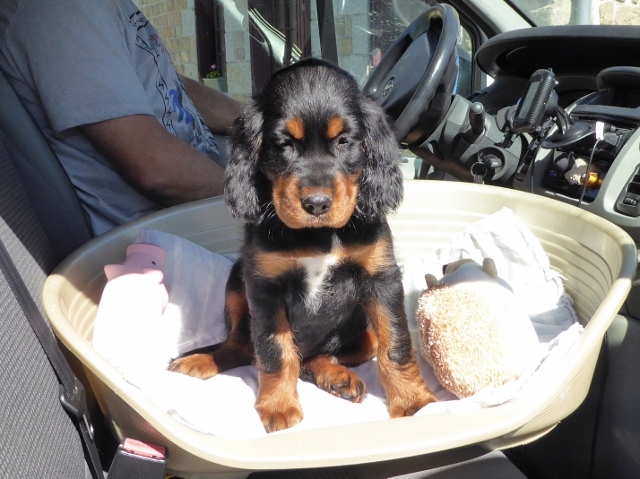 At 9 weeks he’s not sure about the Tracer! 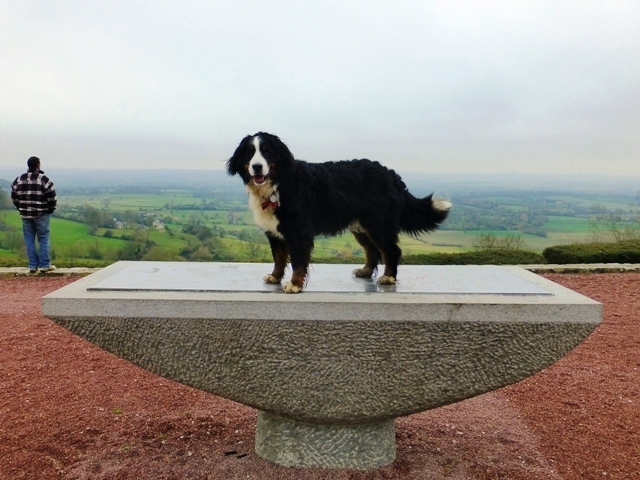 May 2018 – The Monte Carlo or Bust Tour was a great success – the review is now live. Running the 4×4 and the 5×4 as well this month – reviews now live. 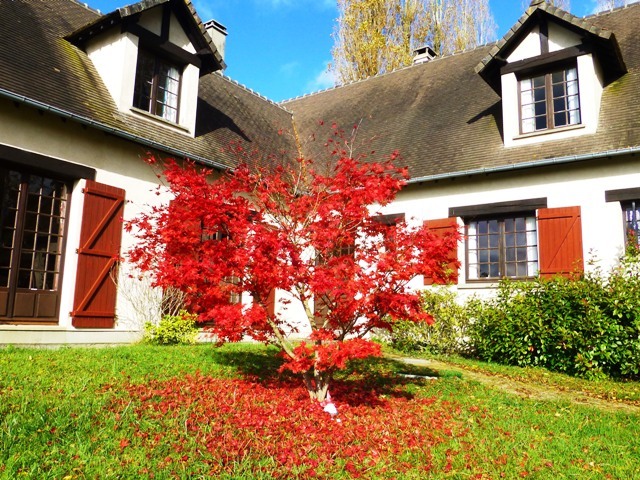 The latest newsletter notified everyone that BN HQ Le Champ Masse in Coudehard, Normandy is being offered for sale. It would be great if there was someone out there who wanted to take over the short breaks & off road side of the business. 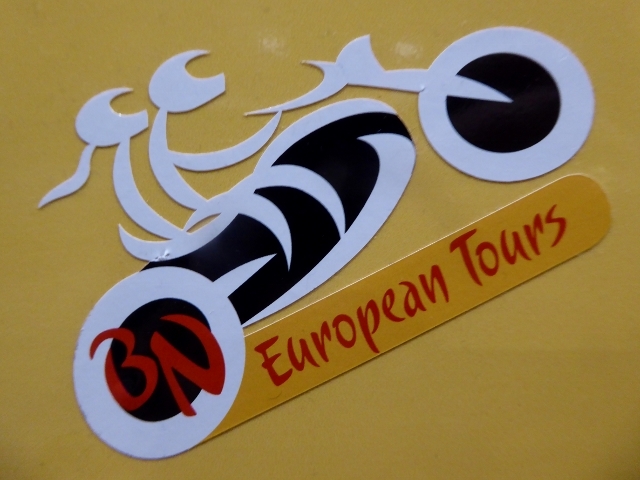 We will continue to run the BN European Tours as usual. Please contact us if you require any further information. 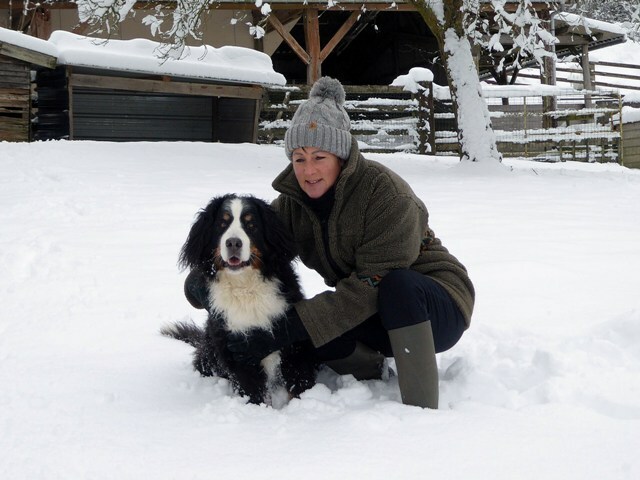 April 2018 – There was sad news at BN HQ with the loss of Della Dog. 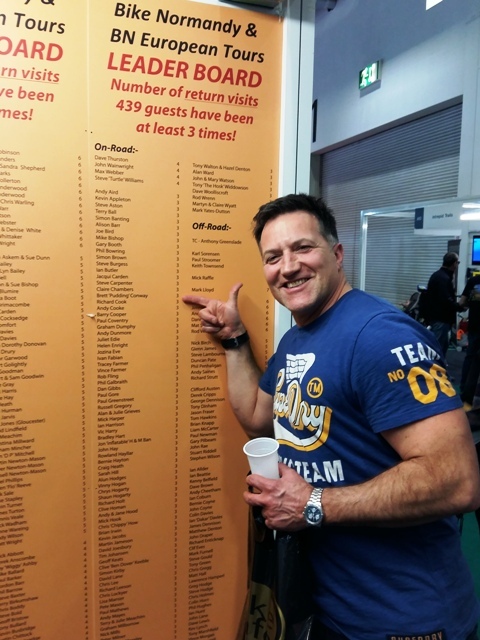 February 2018 – Excel Show – John exhibited by himself while Jen stayed home with Della. 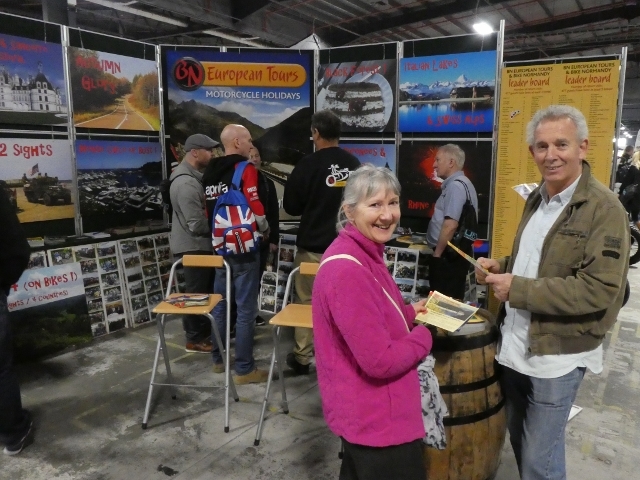 Great to see so many regulars visiting the stand – we look forward to seeing many of you again this year. 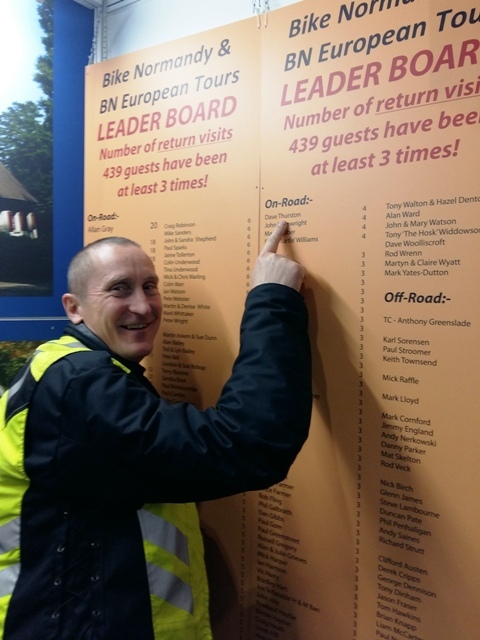 where the Leader Board fills a wall! Chris & Mick have been 6 times too! From the “Black Widows” the “Colonel” & “Swiss Tony” have been 8 times! 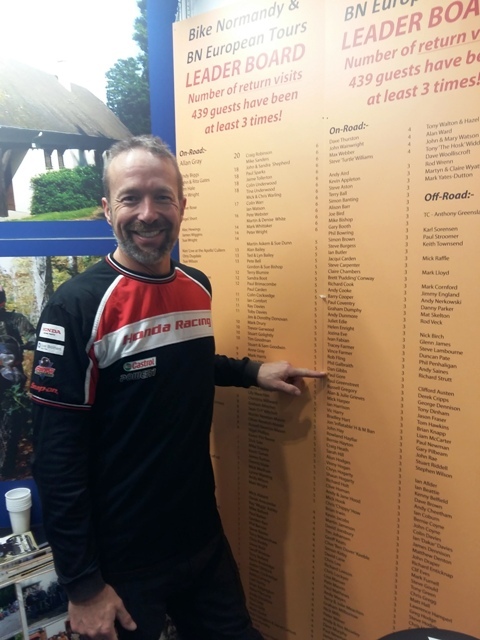 From Oakley Motorcycle Club – Paul has been 3 times so far! 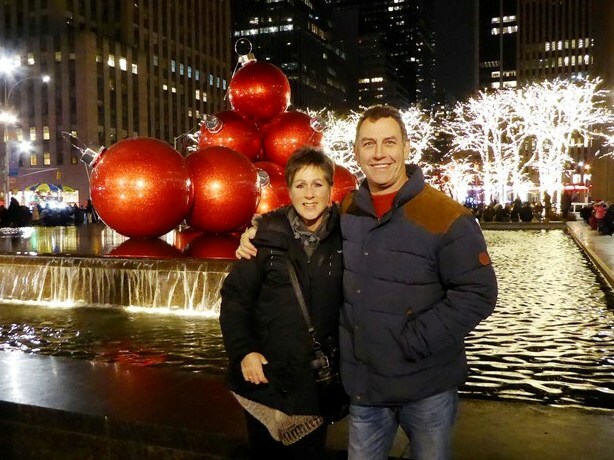 December 2017 – Had a brilliant week in New York just before Christmas – arrived to snow falling so our first night was pretty cold, but lovely weather after that. 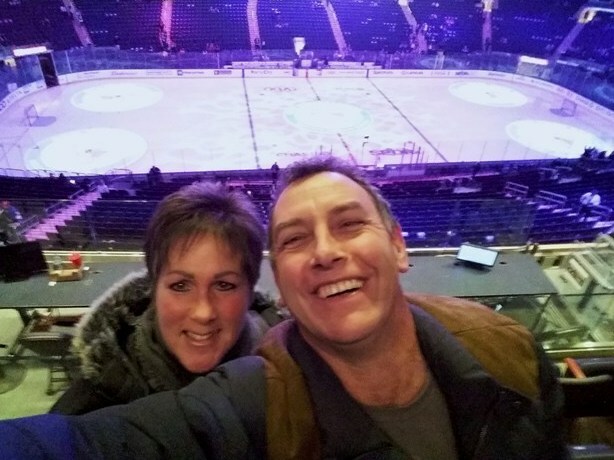 Saw the New York Rangers at Madison Square Gardens & the highlight of the trip – Bruce Springsteen in his one-man show on Broadway – or was the highlight spotting raccoons in Central Park?! 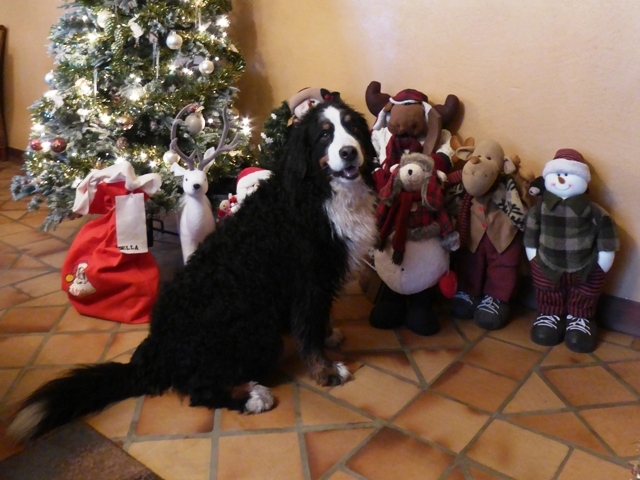 and from Della & friends too! 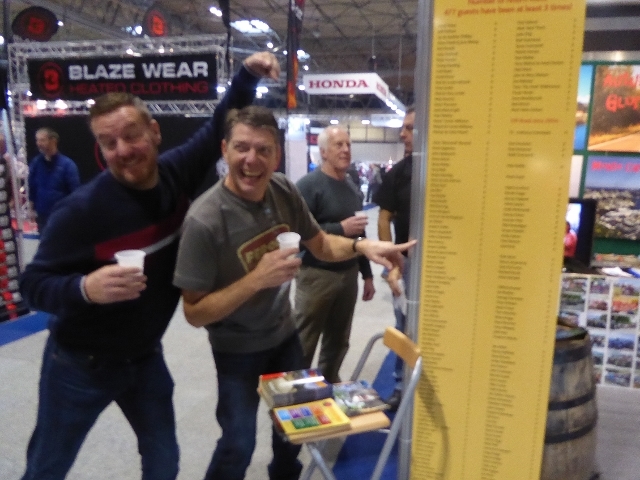 December 2017 – Back home from the NEC bike show, great to see so many “regulars” and to meet some new customers. 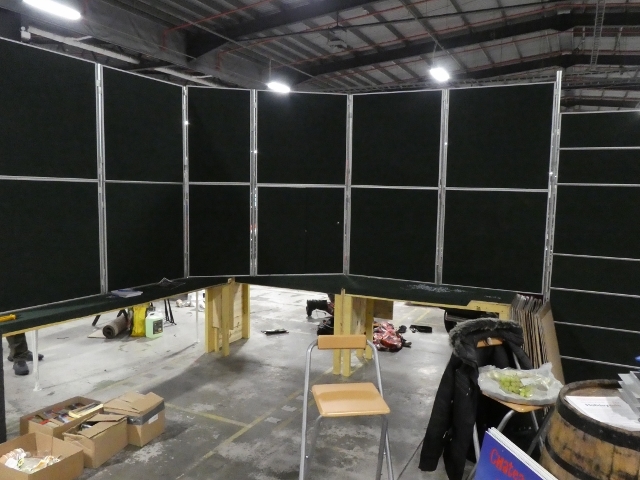 Thanks go to Garry, Dave & Allan for helping to man the stand again. 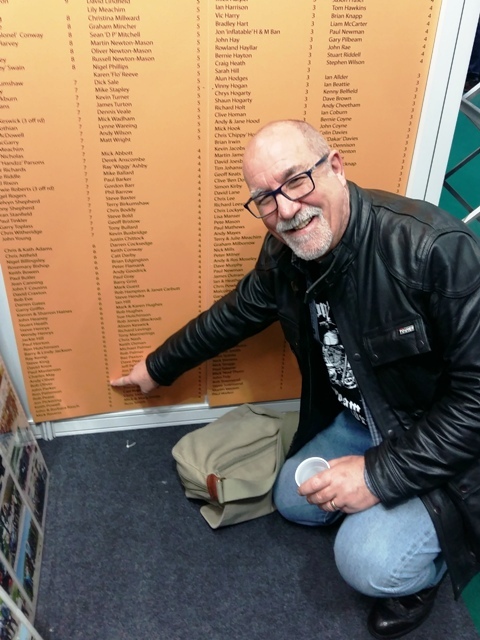 At the show we promised to get back to many people with availability for next year – please bear with us – we are a bit behind schedule having returned to the UK again to attend the funeral of a very dear friend. We will contact everyone shortly. 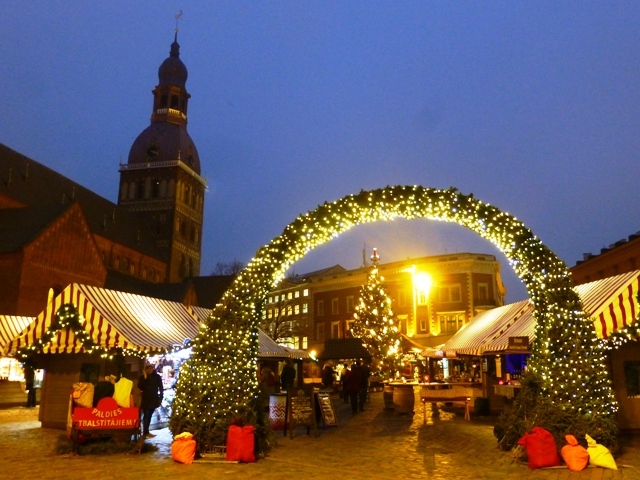 We wish everyone a very Merry Christmas and best wishes for the New Year. The Leader Board has center stage! November 2017 – The new 5×4 Tour and Autumn Glory Tour pages are now live and dates confirmed with all hotels. 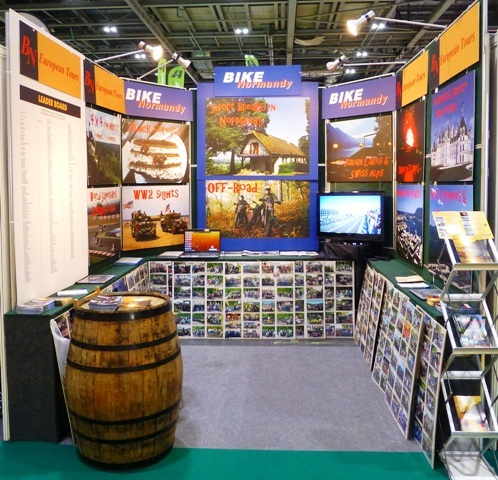 The Bike Normandy off-road season has started then we’re off to the NEC at the end of the month – hope to see many of you there. 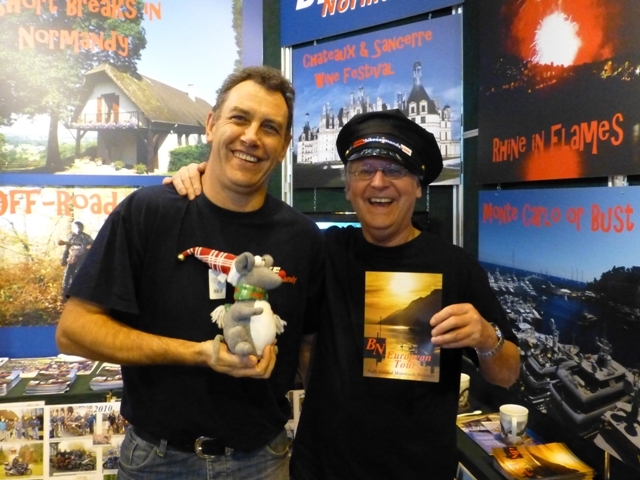 October 2017 – The final tour of the year was another fab trip – the review of the Monte Carlo or Bust! tour is now live under Testimonials. 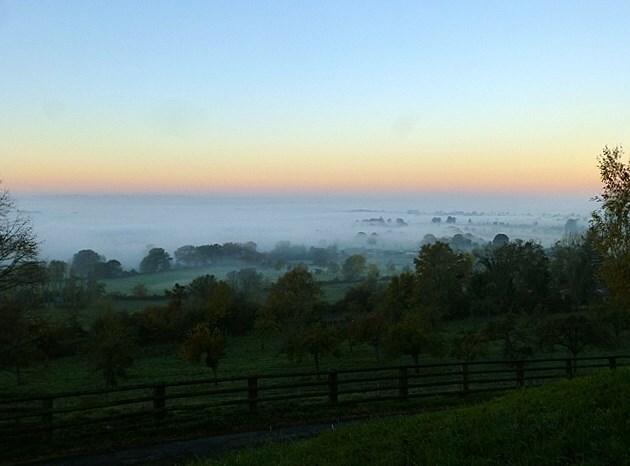 The short on-road breaks have finished with glorious weather, sunsets & sunrises for the last group – see the photos under Bike Normandy’s Latest News. Our Bike Normandy off-road season starts in two weeks then we’ll be heading to the UK for the NEC Bike Show – stand 4C40 – do come & say hello. September 2017 – Just back from a brilliant Italian Lakes & Swiss Alps tour – the review is now live. A couple of short breaks at home then off to the Gorgeous Gorges & Monte Carlo for the last tour of the year. August 2017 – The Black Forest, Rhine in Flames & 4×4 (On Bikes!) tour reviews are all now live under Testimonials. Off to Italy & Switzerland this weekend for our longest tour of 12 days. 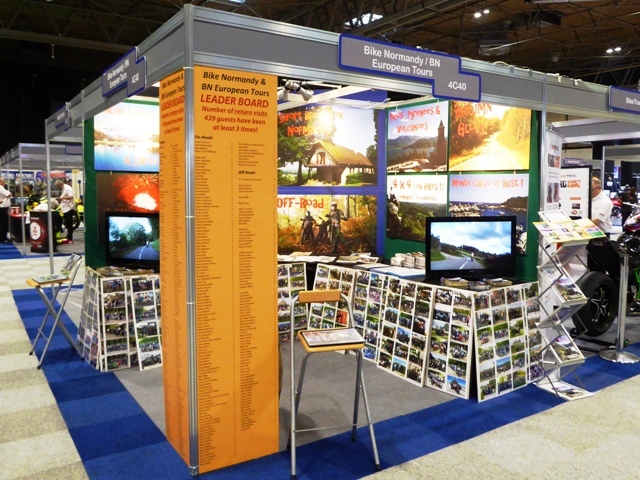 We’ll be exhibiting again as usual at the Birmingham NEC Bike Show 18-26 November this year – come & see us on stand 4C40. July 2017- Again due to huge demand we have now scheduled our 2018 Tour Dates. A couple of the dates are T.B.C. as we have to check availability with hotels and await the WSB calendar which is usually released in February. Off to the Black Forest again tomorrow. June 2017 – The Chateaux & Sancerre Wine Festival Tour was great fun – see the review under Testimonials. Just back from the Picos, Pyrenees & Volcanoes Tour – in reverse – a fabulous trip, the review is now live. Due to popular demand we shall be resurrecting our World Super Bikes at Magny Cours Tour in October 2018 – places are going already! May 2017 – We’ve finished the first two tours of the year – WW2 Extended Sights and the first 4×4 (predominantly for Oakley Motorcycle Club) and the reviews are live under Testimonials. 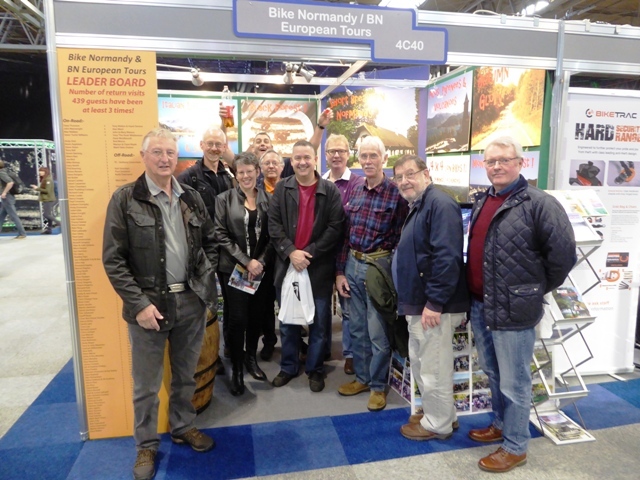 The Bike Normandy Short Breaks are underway – great to have lots of new guests visiting this year. And it had to happen…not happy riding in red, Jen has sold her red GSXS1000F and bought a naked GSXS1000 with all the red parts sprayed black so she can revert to her orange kit!! 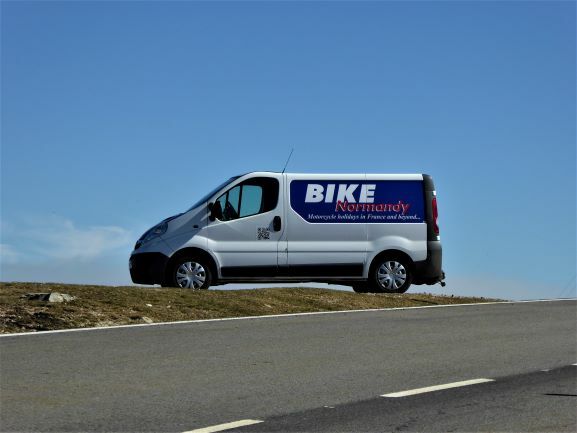 April 2017 – back from our two week holiday in Thailand, the Bike Normandy off-road season has finished and we’re about to start the first tour of the year. 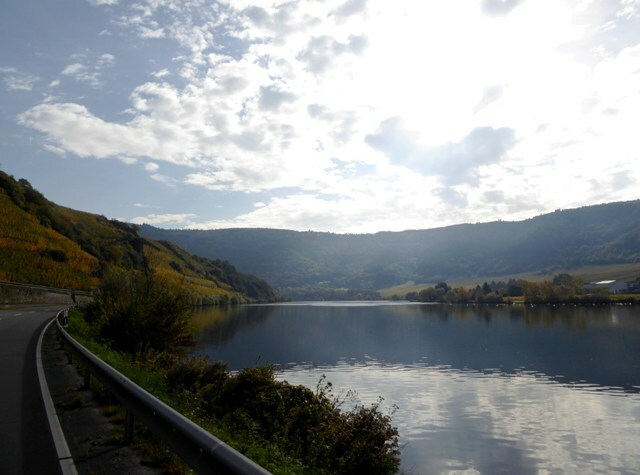 For this summer there are only places available on the Chateaux & Sancerre Wine Festival Tour in early June and following cancellations there are two bike places available on the Black Forest & Vosges Mountains Tour in mid-July – for couples only. March 2017 – we’ve just hit 400 – the number of guests who have been 3 times or more – with Allan Gray booked in for his 20th visit in July!! March 2017 – John’s back from exhibiting at the ExCeL show and the Bike Normandy off-road season has now started – great to have six new lads here for the first group. 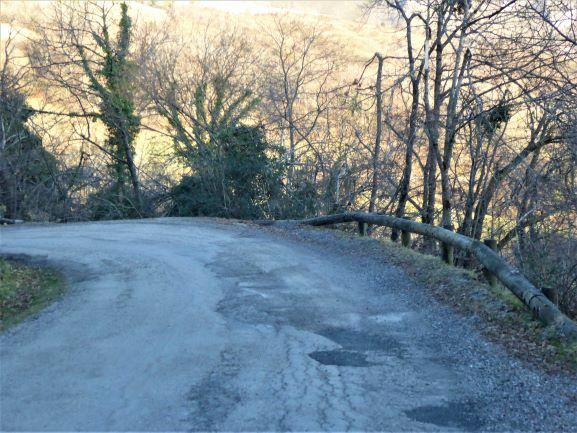 There are still some places available for short breaks this summer and we’ve just had a cancellation so there are two bike places now available on the Monte Carlo or Bust Tour 1-8 October – if you’re looking for some really twisty roads through the gorges of Southern France, the Route Napoleon & the Millau Bridge then this is the one for you – experienced riders only please as this is a high concentration tour. 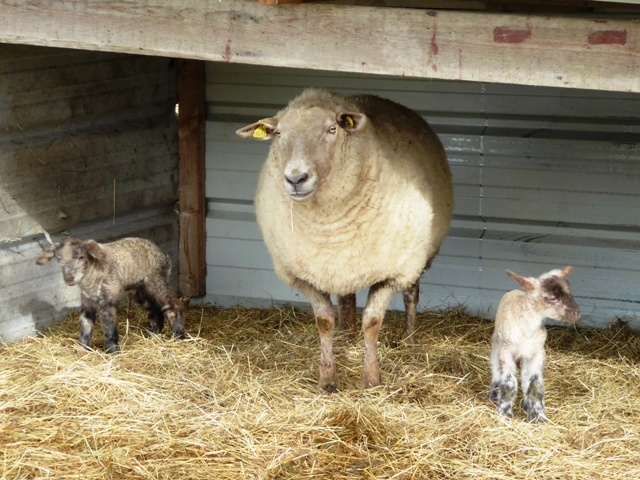 February 2017 – We’ll be exhibiting at the ExCeL show in London 17-19 February – Stand A72 – but John will be there on his own as Jen’s staying home with our expectant ewes. 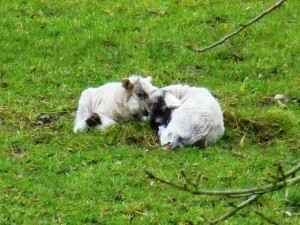 More lambs have arrived along with a smattering of snow. Although most of our Tours are already full there are places available on the WW2 Extended Sights Tour 23-29 April and the Chateaux & Sancerre Wine Festival Tour 2-7 June. Both these Tours are going ahead. January 2017 – Happy New Year! 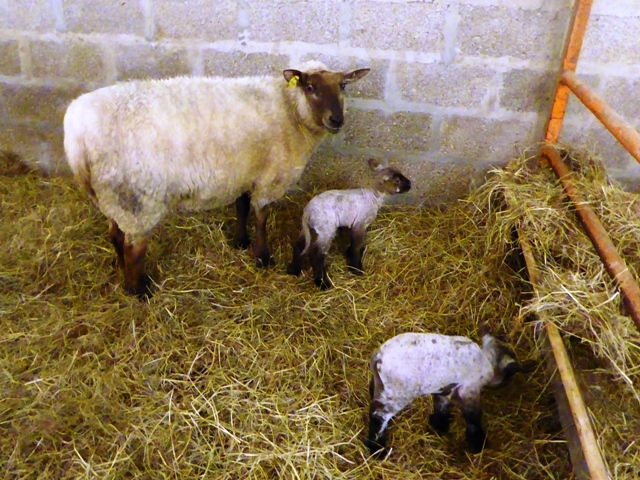 We hope everyone had a great Christmas break, the New Year has already delivered us 5 lambs with more to come. 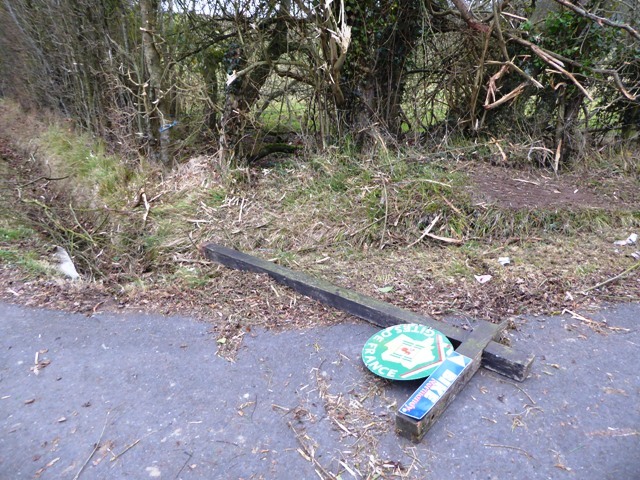 Thanks to our local hedge-cutter who managed to totally destroy our postbox and sign! 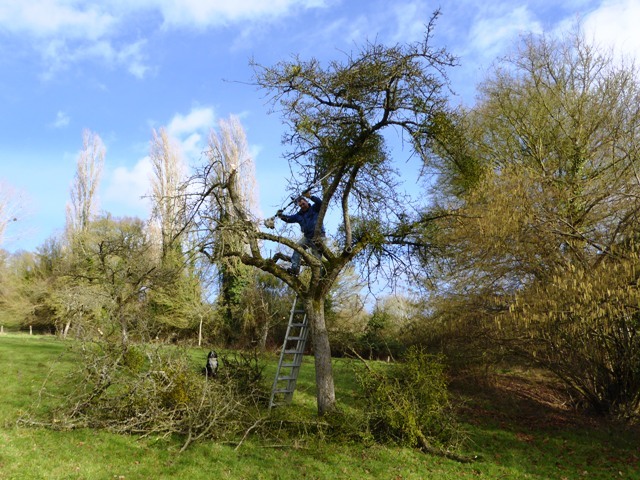 A storm at the end of 2016 brought down a dead tree in the back garden – fortunately it fell away from the house. 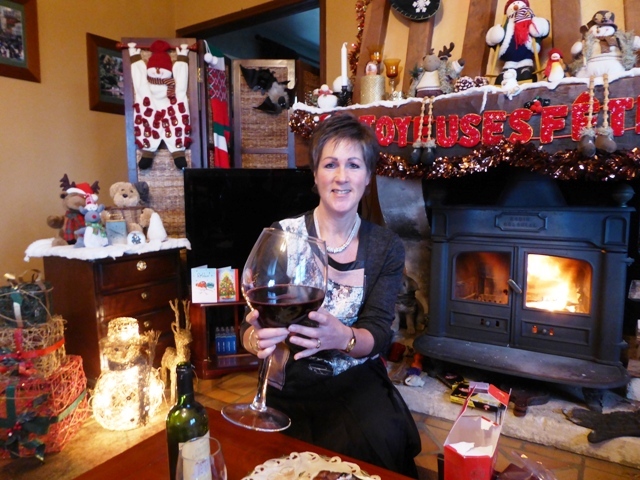 Merry Christmas – & this is a MEDIUM glass! 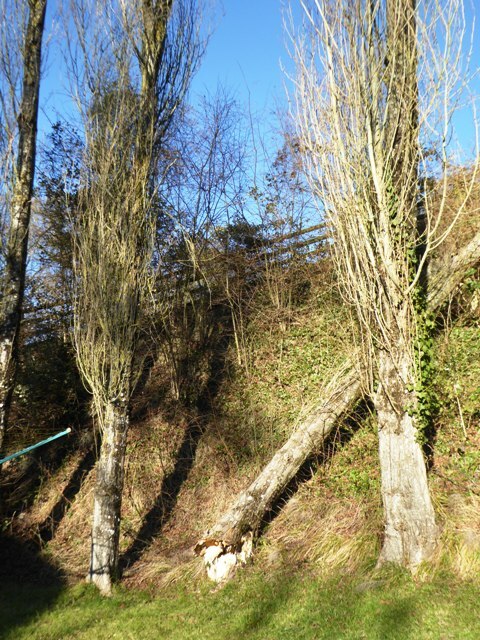 Tree falls away from the house! Our sign down as well! 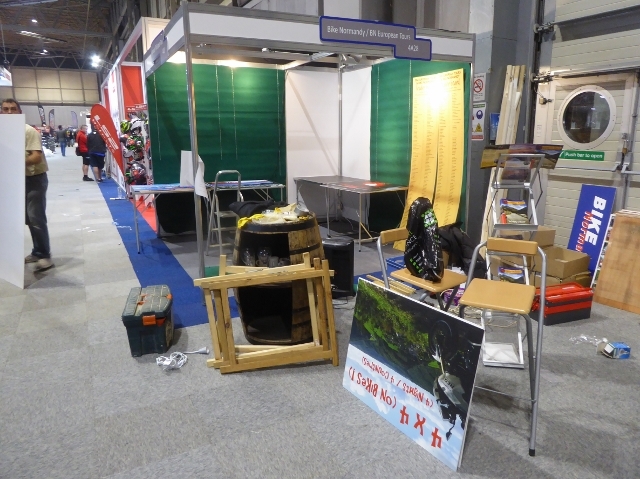 December 2016 – Back from exhibiting at the NEC – great seeing so many regulars at our stand and meeting new customers. Thanks to Garry & Dave for helping to man the stand as they’ve done for the past six years! 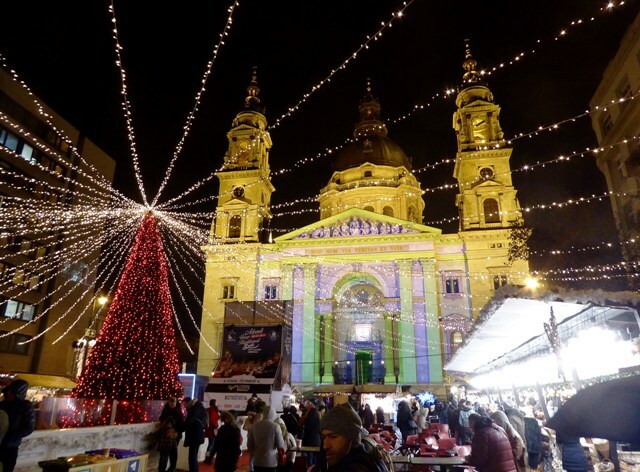 We saw Jess Glynne in concert while we were at Birmingham – really good show if you get a chance to see her – then we escaped to Budapest for a few days to visit the Christmas markets – very festive. 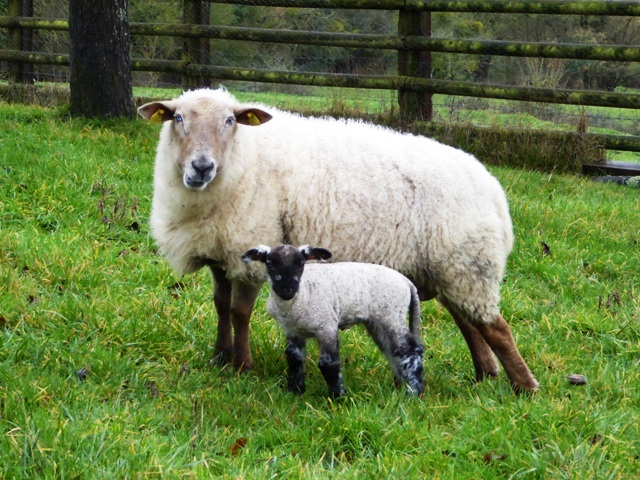 Back home now for a quiet Christmas and the start of the lambing season. We wish everyone a very Merry Christmas and a Happy New Year. 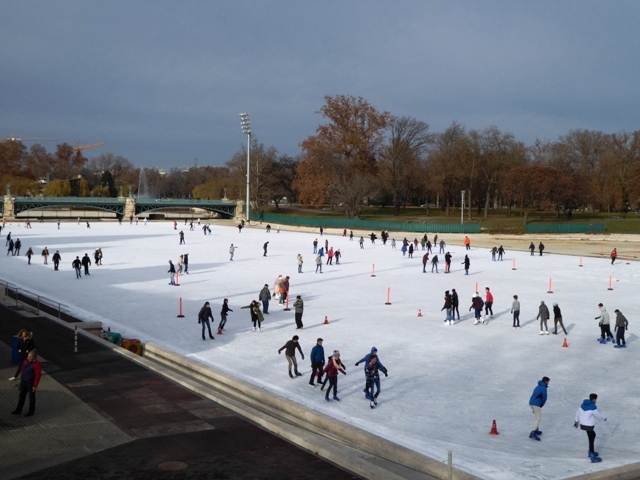 We didn’t brave the ice rink! November 2016 – AS SEEN ON TV ! – John was seen on the 4th episode of the BBC series “The Missing” (2 Nov @ 56 minutes) photobombing their cafe scene in Monschau, Germany on our Street Triple!!! 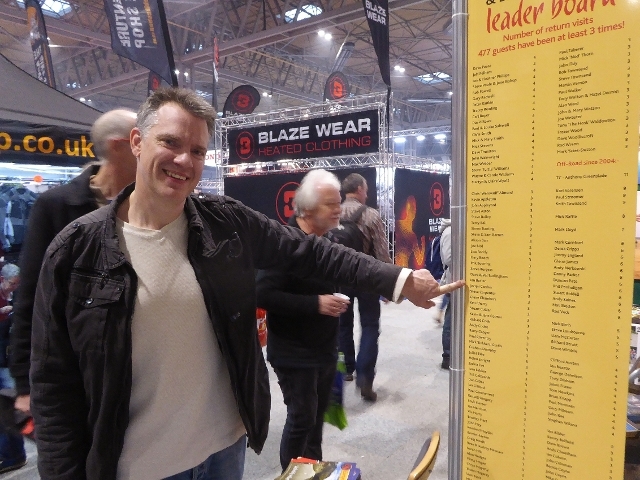 He’ll be on the red carpet at stand 4E46 at the NEC bike show 19 – 27 November 2016 & will happily sign autographs!! 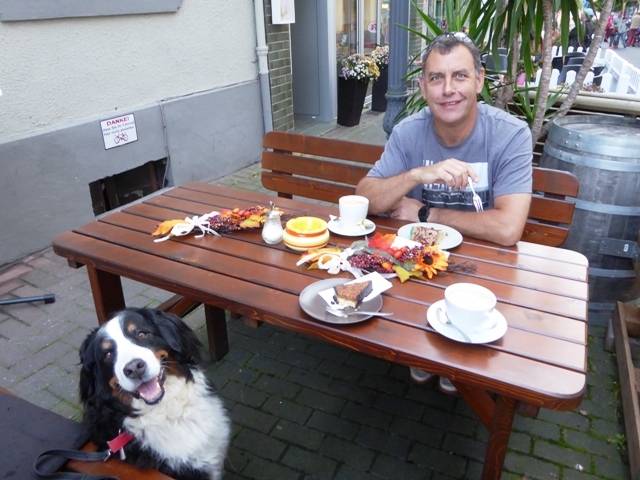 September 2016 – The Rhine in Flames & Black Forest Testimonials are now live – off to Italy & Switzerland next. 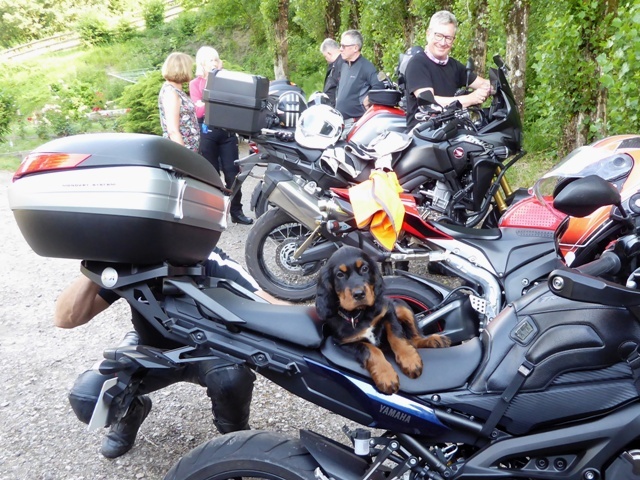 We’ve had so many requests that we’ve added a second Black Forest Tour in July 2017 – if you’re thinking about a tour for next year bear in mind that when we have 15 bikes on the tour then it will be FULL – don’t leave it too late – we don’t want you to be disappointed! 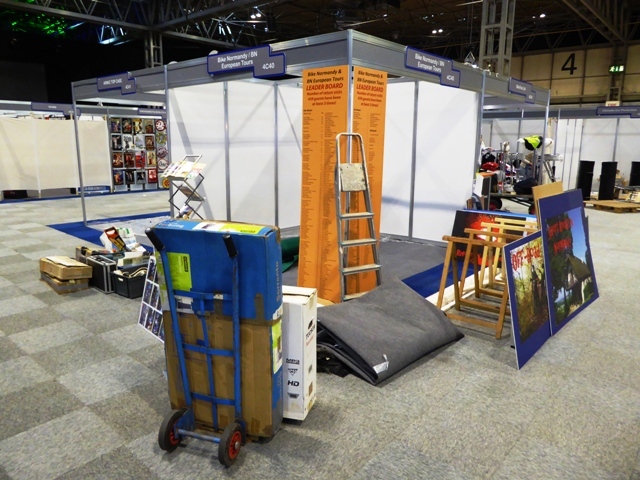 We will be at the Birmingham NEC – stand number to follow. August 2016 – The Picos, Pyrenees & Volcanoes Tour was a great success – see the review & photos under Testimonials. 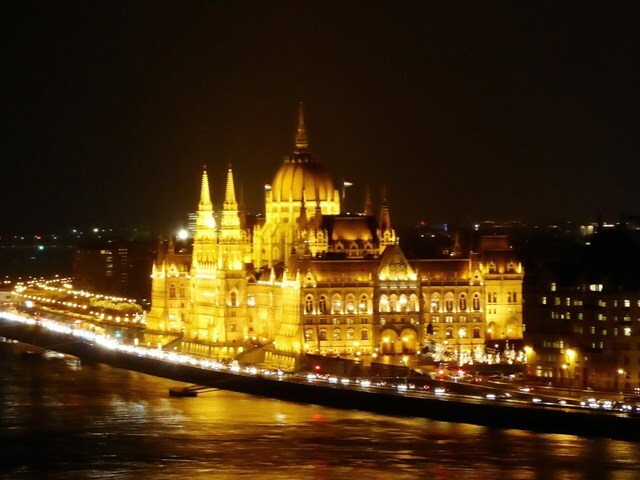 Off to Germany for the Rhine in Flames next, shortly followed by the Black Forest Tour. 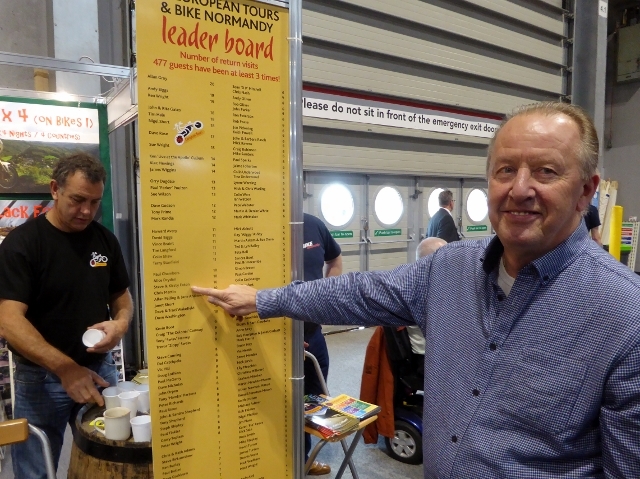 We have a new rider at the top of the Leader Board – Allan Gray has now visited 19 times!! 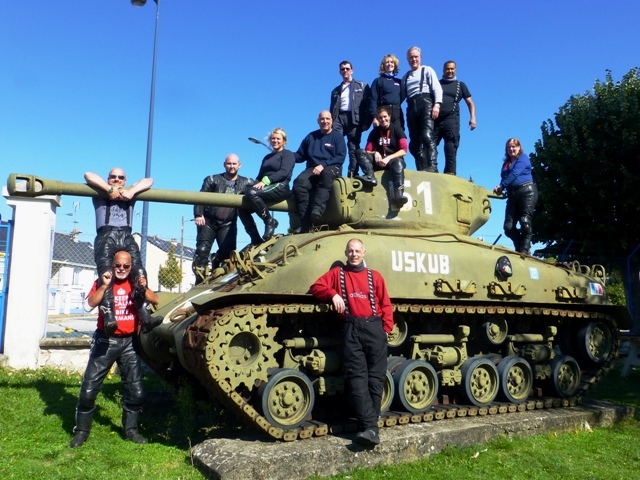 The latest for a short break with the “Black Widows” – see the photos on the Bike Normandy Testimonials page. 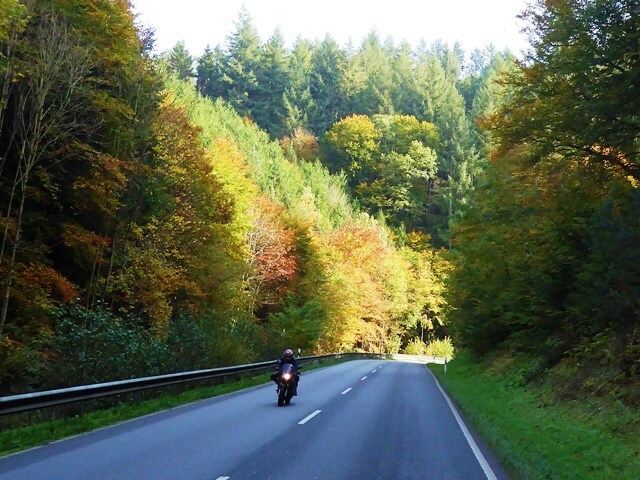 July 2016 – We have just received another cancellation on the Black Forest Tour – there are 2 bike places now available. 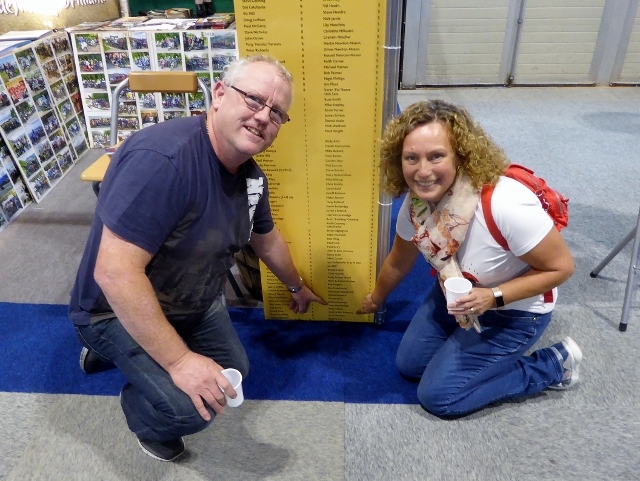 The 4×4 Tours were great fun – see the reviews & photos under Testimonials. 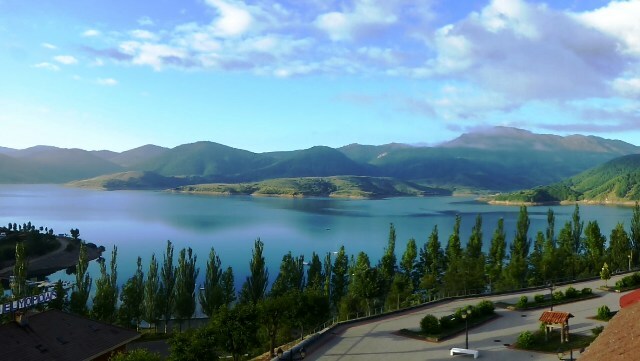 Off to Spain for the Picos Tour – please bear with us if we are slow to reply to e-mails until early August. 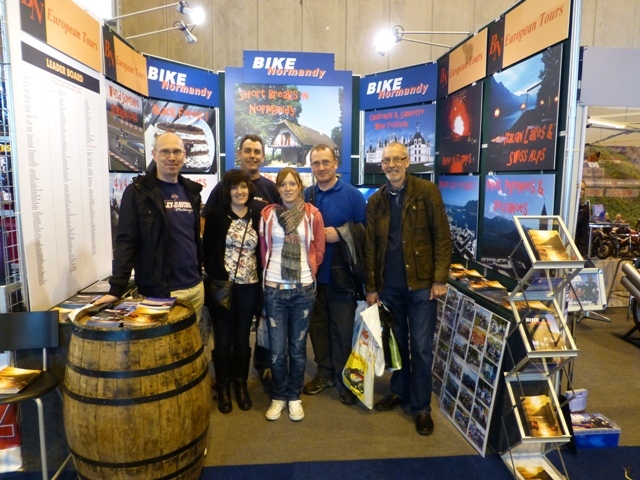 June 2016 – We have just received a cancellation on the Black Forest Tour 23-29 August – 1 bike place now available. 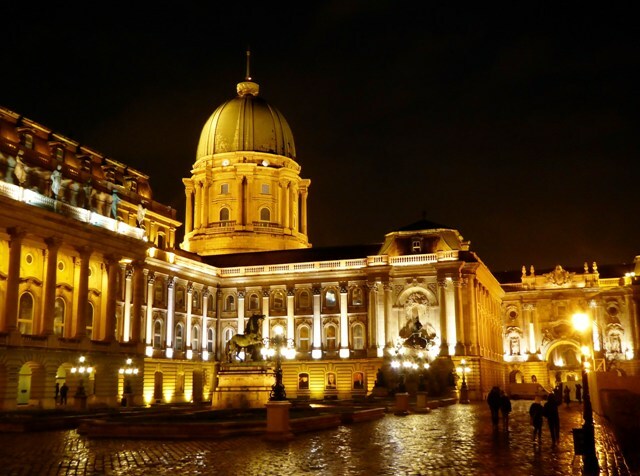 Our WW2 Extended Sights Tour was a great success – see the review & photos under Testimonials. 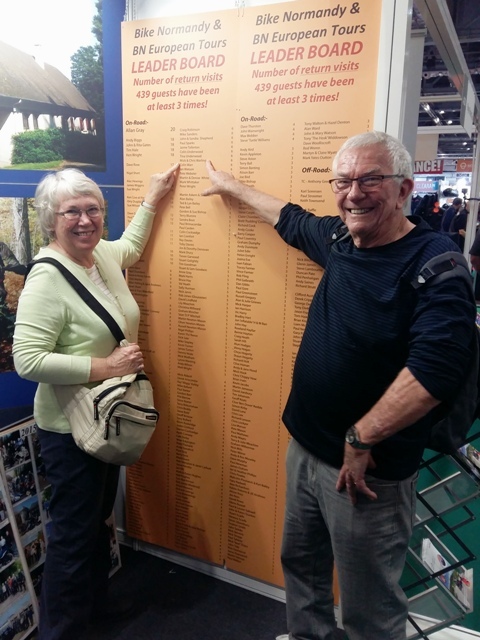 We are running two 4×4 (four nights in four countries – on motorbikes!!) back-to-back so please bear with us if we are slow to reply to any e-mails between 15-26 June. 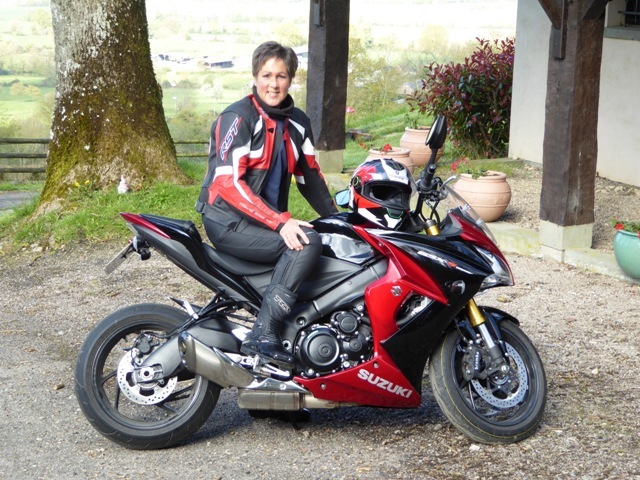 May 2016 – The sun is shining, the short breaks have started & Jen has a new bike – a Suzuki GSXS 1000F in red – so – of course – new leathers & helmet to match! 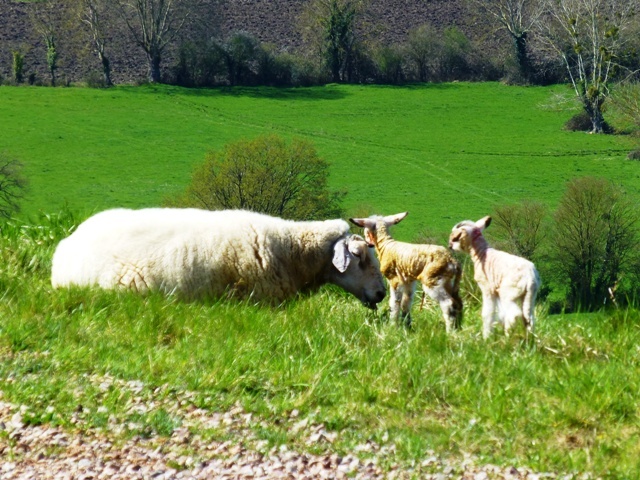 April 2016 – Back from holiday travelling round India, the Bike Normandy off-road season has finished and the short breaks start at the end of the month. Jen just needs to get a new bike! 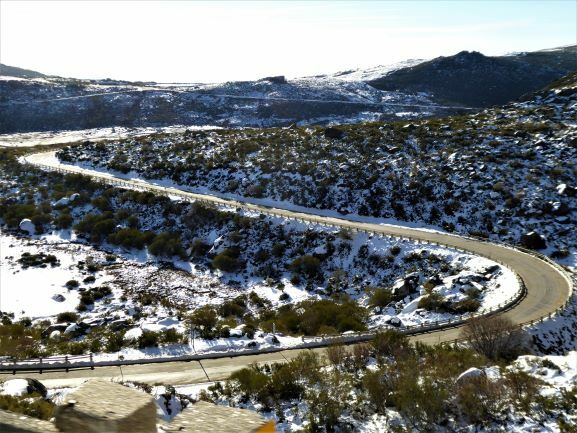 Following a cancellation on the 2nd 4×4 Tour from 21 – 25 June – one bike place is now available. March 2016 – We’re away on holiday from 21 March until 5 April so please bear with us if we don’t reply to e-mails until we get back. 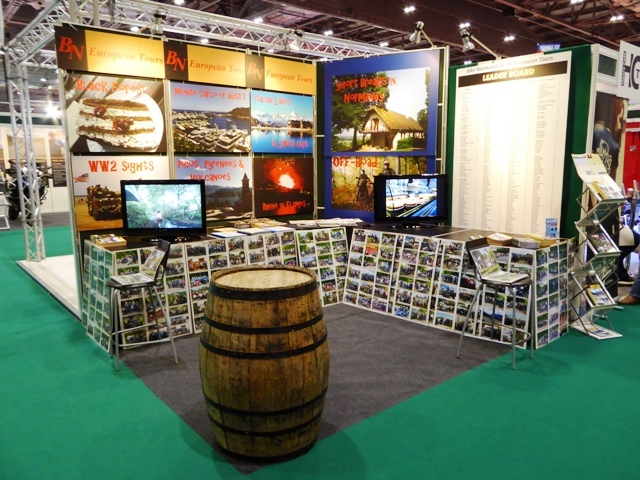 February 2016 – As we had so many requests at the ExCeL show for details of our 2017 Tours we have set the dates and these are now showing on our Tours and Availability pages. The date for the Italian Lakes & Swiss Alps Tour 2017 is t.b.c. 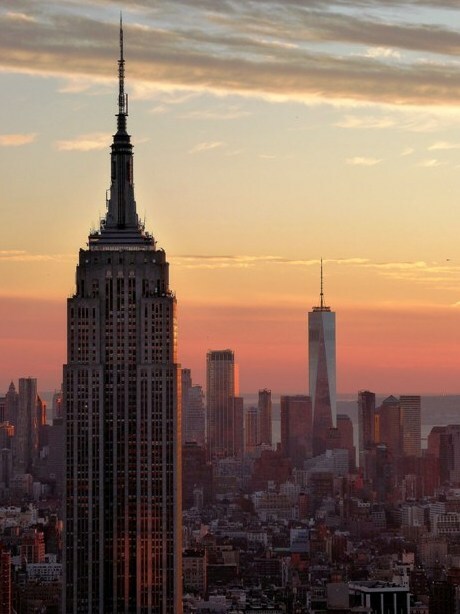 subject to hotel availability – so it could be the following week. 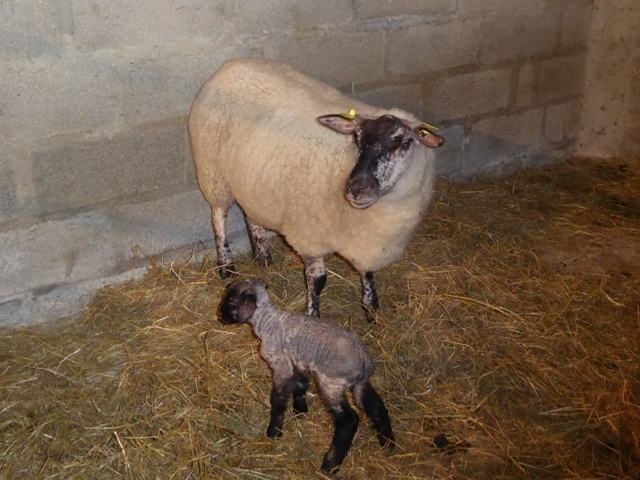 February 2016 – Arrived back in France from the ExCeL show to minus 6 degrees and 6 new lambs – three sets of twins. Our Mayor and his wife had their work cut out while we were away! 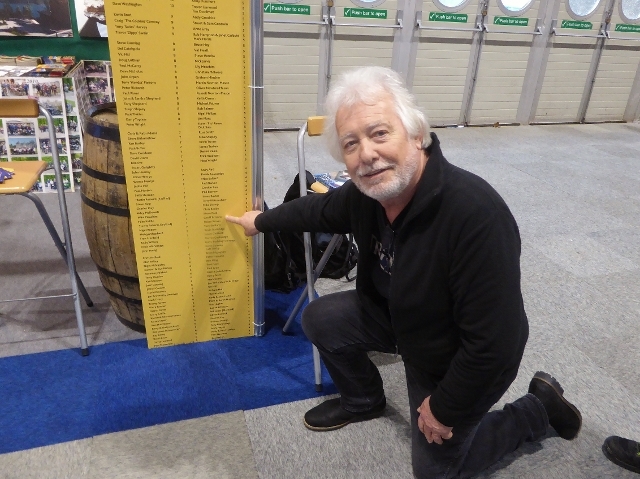 John was interviewed for BIKE magazine so watch out for an article on riding in Normandy in a future issue. The place on our Italian Lakes & Swiss Alps Tour has been taken and there are now only 4 places left on our Monte Carlo or Bust! 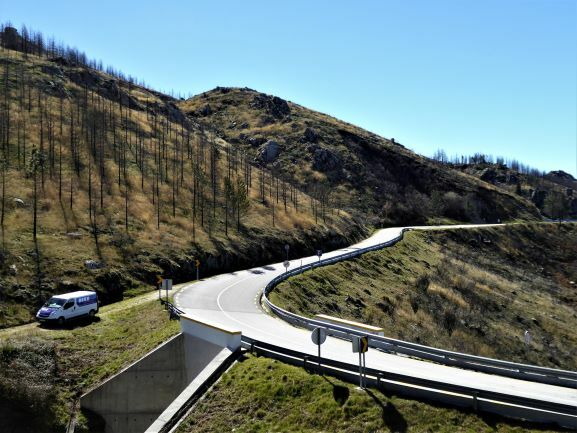 Tour (as at 18 Feb) so if you fancy riding through the gorges in the South of France, across the Millau Bridge and up the Route Napoleon then get in touch! 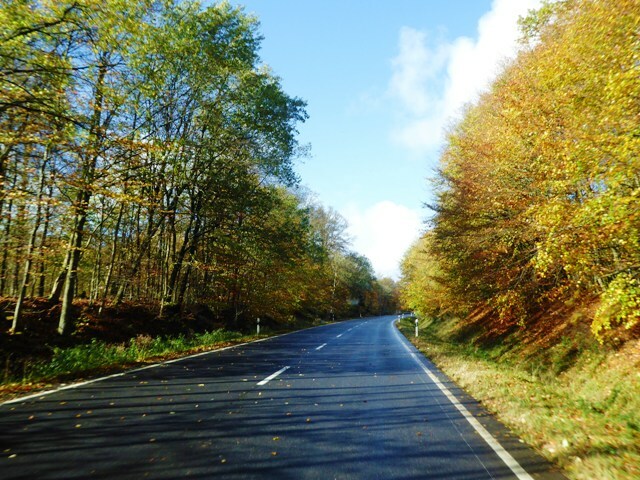 Please also let us know if you are interested in the Escorted Black Forest Tour – we have taken a couple of bookings so far. 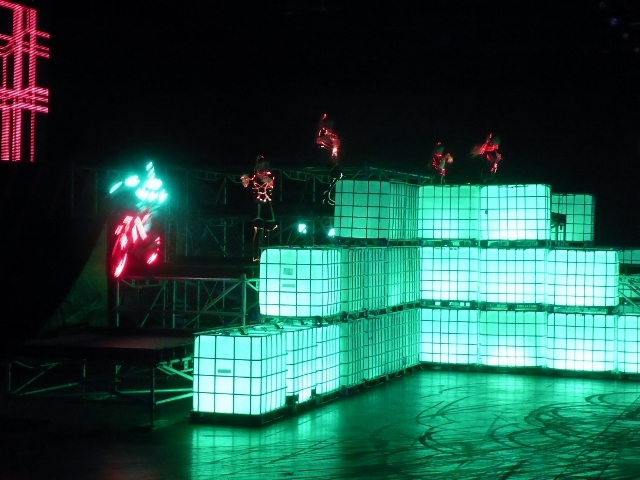 Thanks to David Adams for solving our Rubiks cube – we just need the instructions now please David!! 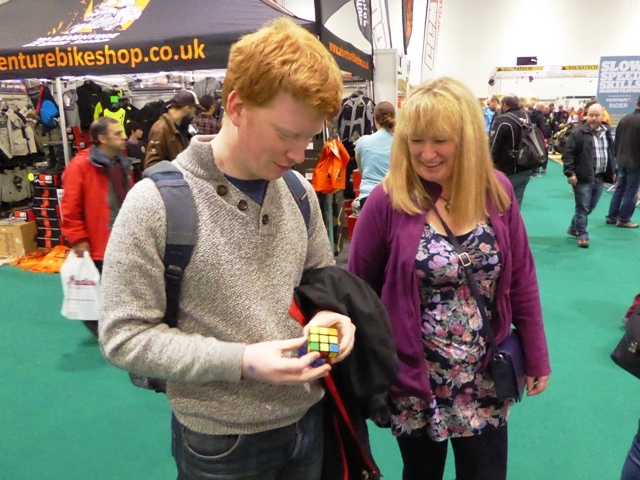 David Adams solves the Rubiks cube!! and finish up with this! 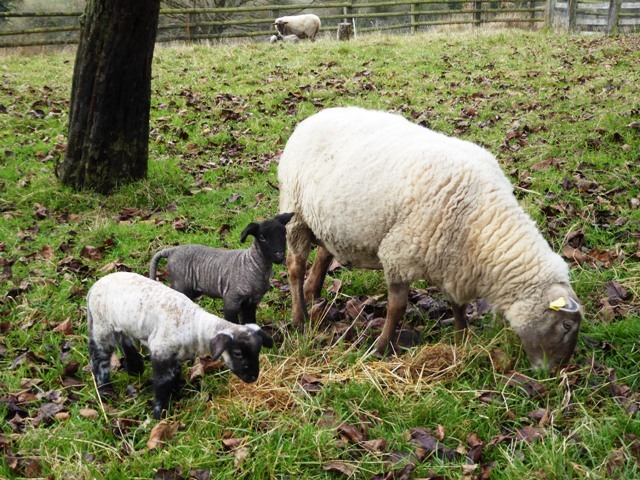 February 2016 – Our first two lambs have arrived & we’ve been busy with our winter job this year – cutting back all the trees in the orchard to get rid of the mistletoe. 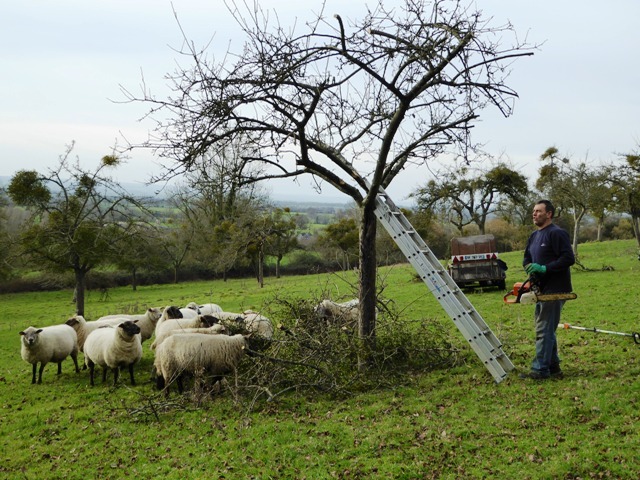 The sheep can’t wait until we’ve finished one tree & moved to the next before they arrive to devour it. At ExCeL this weekend so hope to see many of you there. Just taken a cancellation for the Italian Lakes & Swiss Alps Tour 10 – 21 September 2016 – one double room is now available – first come, first served!! [since taken] Also, due to huge demand this year for the Black Forest Tour we’re offering a second Tour on an “Escorted” basis – Sunday 14 to Sat 20 August 2016. Please refer to the Tour page for further details. 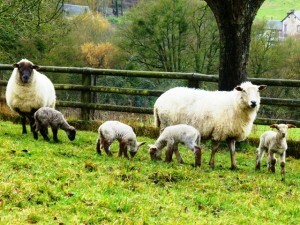 The sheep have a feast! Yes, John is up a ladder!! 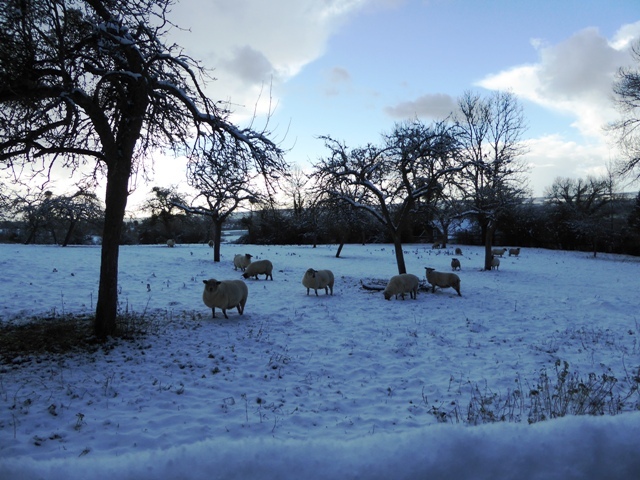 January 2016 – Happy New Year! 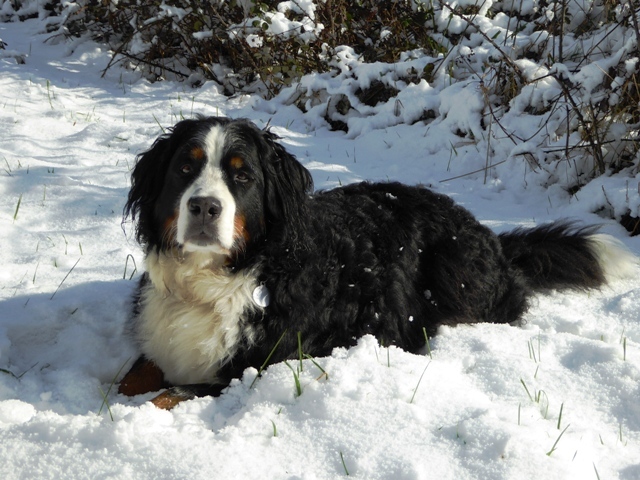 Our first snowfall arrived last weekend much to Della’s delight! 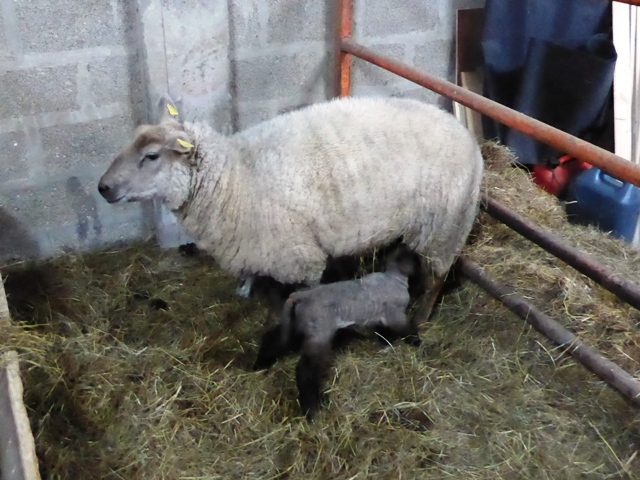 No lambs as yet. 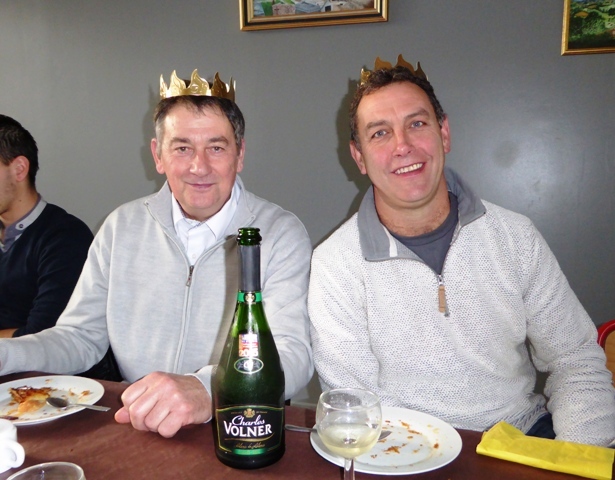 At the annual “Galettes de Roi” John was crowned King along with our Mayor! 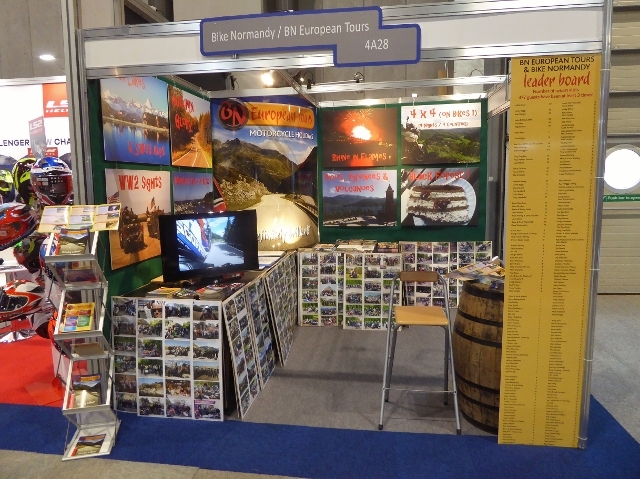 We’ll be at the London ExCeL show 12-14 February on stand A82 so do come & see us there. The Mayor & John – King for a day! 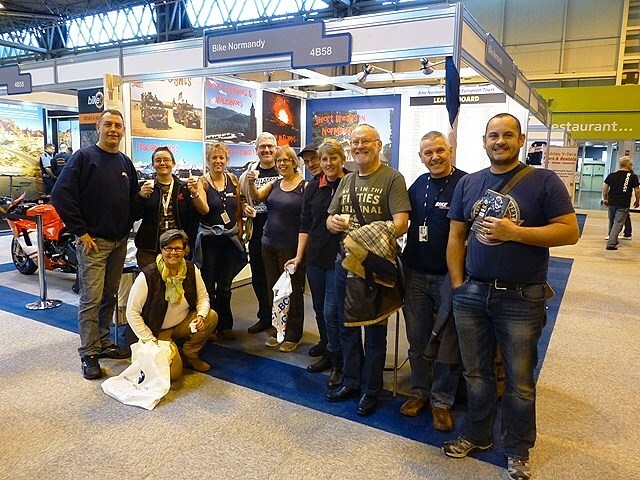 December 2015 – Great to see so many regulars at the NEC – especially Denise White now back on her feet and the 2015 Rhine in Flames group reunion! 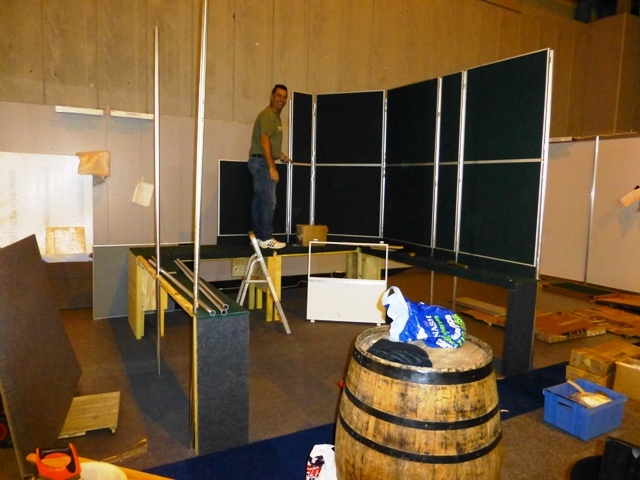 Thanks to Garry Toplass & Dave Washington for helping to man our stand again this year. 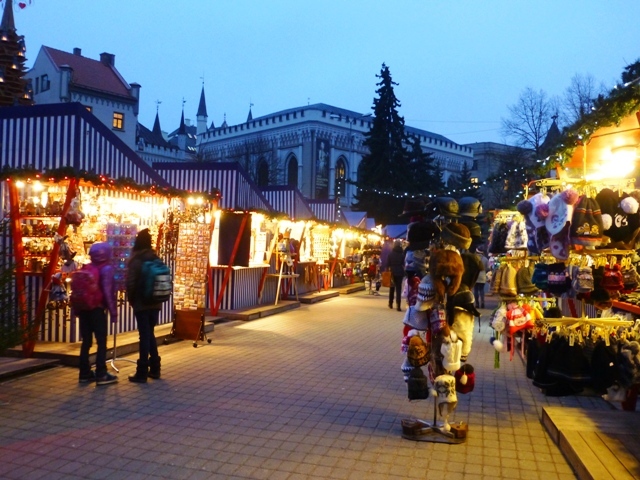 After the NEC we went to Latvia for the Christmas markets – very pretty & lots of hot mulled wine! Back home now for a quiet Christmas. 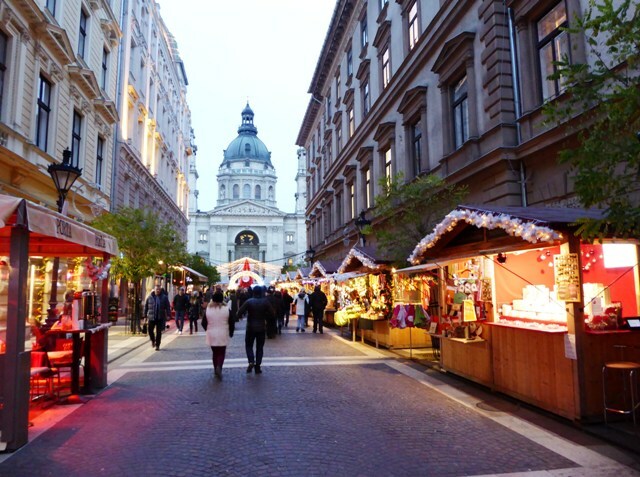 We wish everyone the very best for the festive season and a Happy New Year. 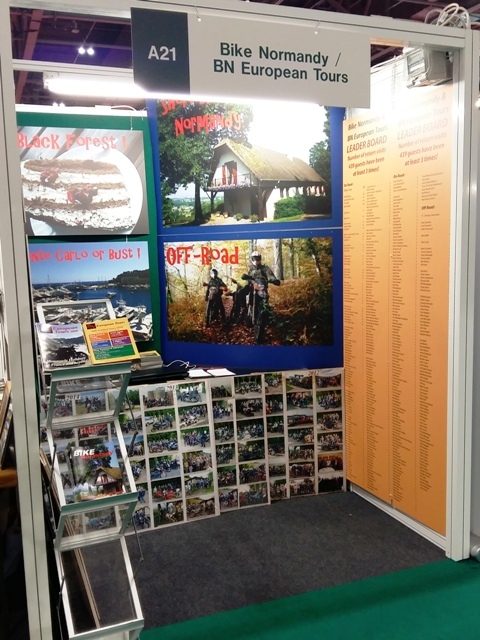 November 2015 – The Bike Normandy off-road season has finished and we’re getting ready for the NEC Motorcycle Live Show 28 November – 6 December – do come & see us if you’re there. We’ll be in Hall 4 stand 4B58. 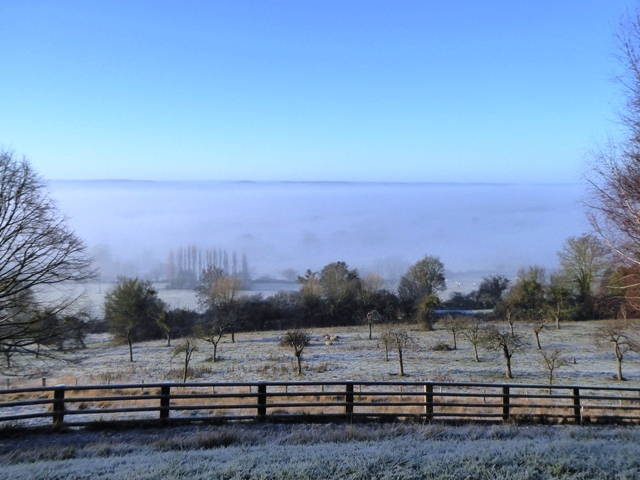 Gorgeous weather here in Normandy at the moment – 36oC at 4.00pm yesterday (2 November)!! September 2015 – Our first Italian Lakes & Swiss Alps Tour was a huge success – we couldn’t have wished for it to have run any better (except for too much rain at times!). 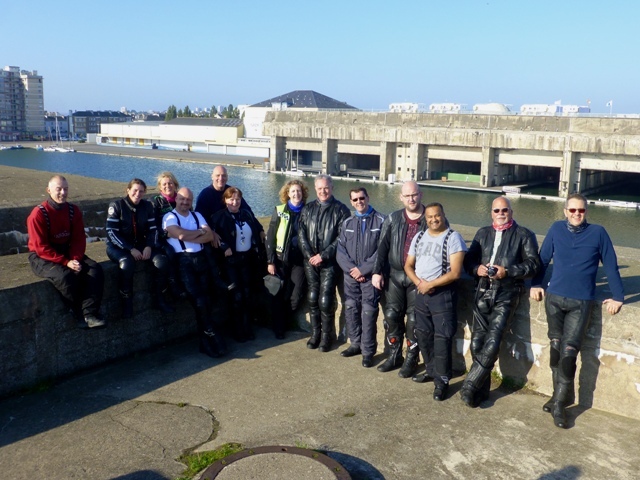 Our final trip was an abbreviated WW2 Tour for Kent Advanced Motorcyclist Group (with sunshine every day!) 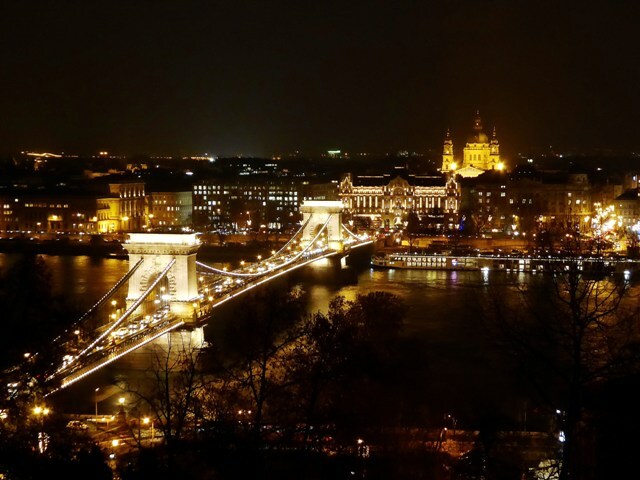 – see the reviews of both Tours under Testimonials. We start our off-road season in two weeks time. 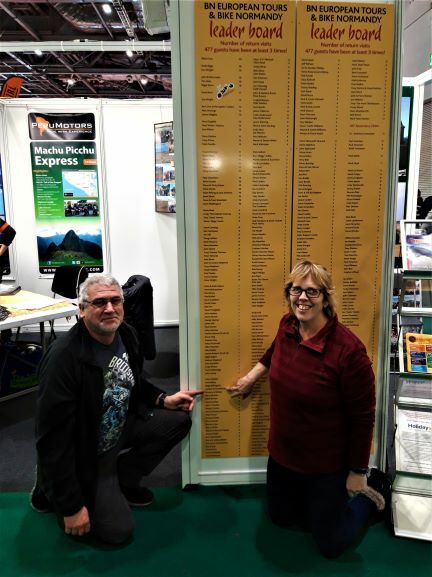 August 2015 – Black Forest, Rhine in Flames and 4×4 Tours have all taken place and the reviews are now live under Testimonials. If you want to book on any of these for next year you’ll need to be quick as places are going fast! Back at home for some short breaks before we head off to Italy & Switzerland in September – still 2 places available if you’re looking for a last-minute holiday. 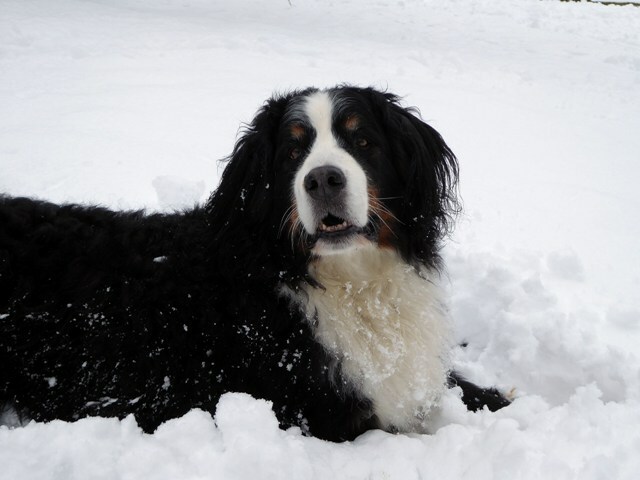 Unbelievably Della is now 7 years old – it really only seems like a few years ago when we got her as a puppy. The Rhine in Flames group ready to embark. 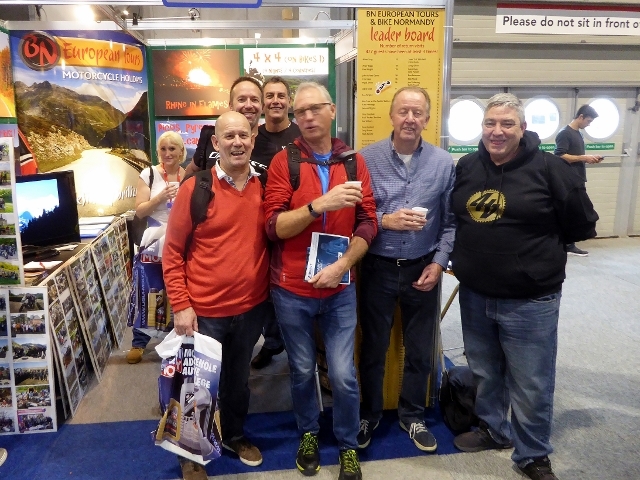 July 2015 – Back from the Picos, Pyrenees & Volcanoes tour – eventful to say the least but fantastic all the same thanks to a really great bunch of people. The review is now live under Testimonials. 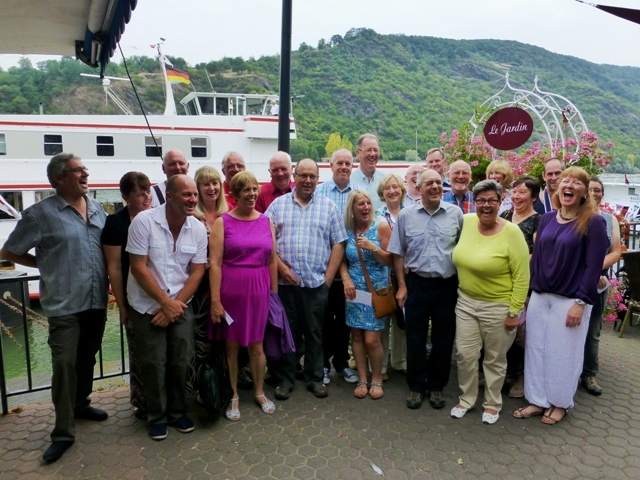 Unfortunately due to illness we have just taken a cancellation on the Rhine in Flames Tour which takes place from 5 – 10 August – take a look at last year’s review & book your place quickly – it’s a brilliant trip! 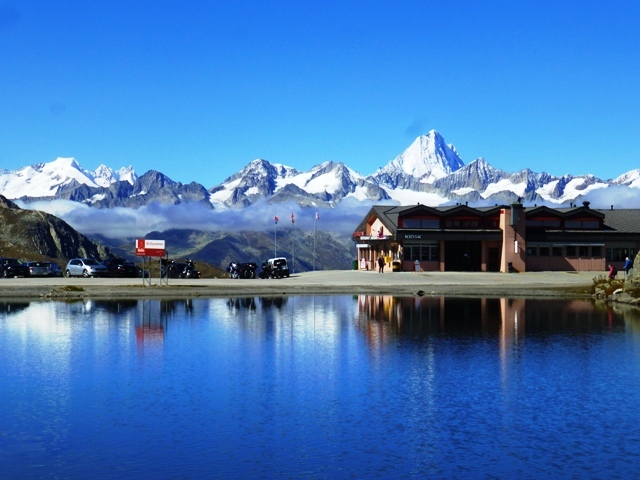 We have also received a couple of cancellations (again unfortunately due to illness) on the Italian Lakes & Swiss Alps Tour in September – a longer trip which offers spectacular scenery and some lovely hotels. 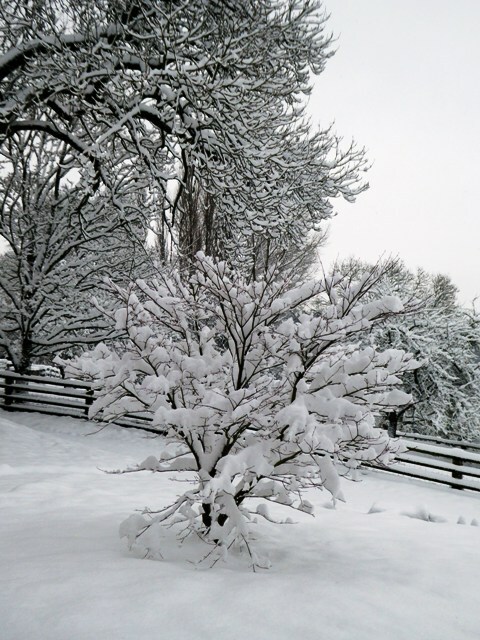 Off to the Black Forest next week. 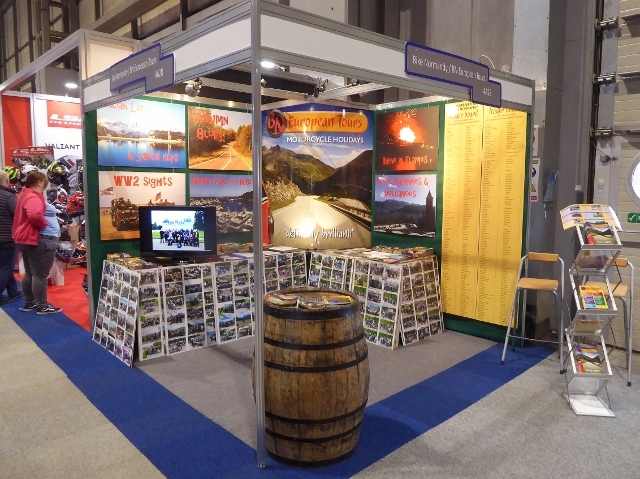 June 2015 – Our first two tours have been great successes with a mix of repeat and new customers. A first for BN – Allan Pelling & Jane Andrews announced their engagement during the Chateaux & Sancerre Wine Festival Tour – Allan proposed in a helicopter flying over Sancerre! Congratulations! Both tours had fine weather with 34oC on several days on the WW2 Tour. The reviews are now live under Testimonials. Off to Spain at the end of the month for the Picos, Pyrenees & Volcanoes Tour. 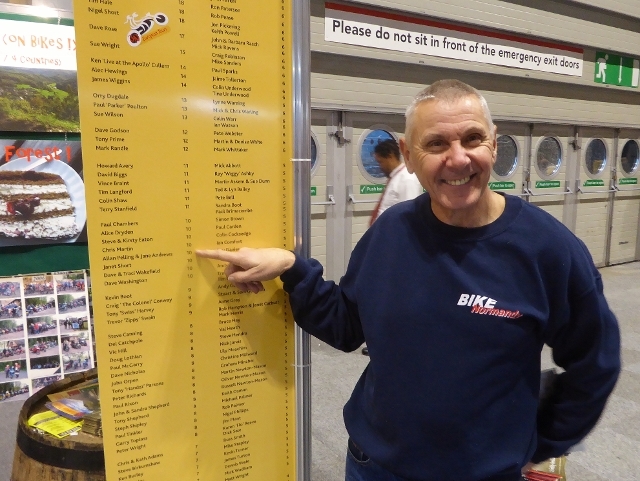 May 2015 – John’s back on a bike!! 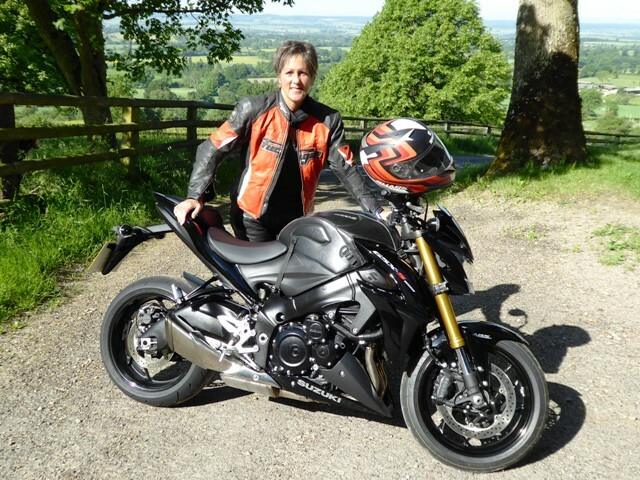 With the first road bikes of the year and a new pair of boots John was back in the saddle of the trusty old V-Strom. Riding is OK – it’s just walking he’s struggling with! 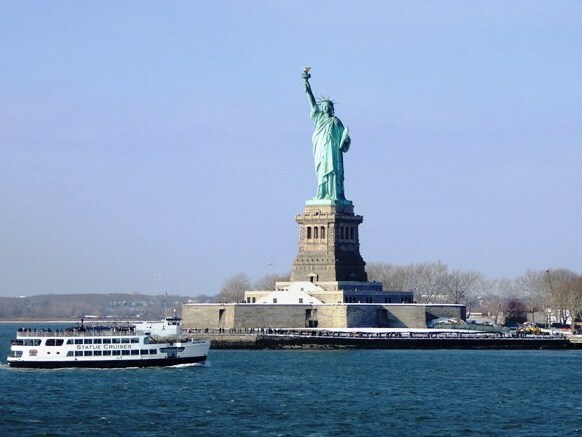 Polite reminder: to any guests who have our mobile phone numbers – please do not call us on them as they are only for use in an emergency whilst you are here on a trip with us. Please contact us on the landline or by e-mail. Thanks. 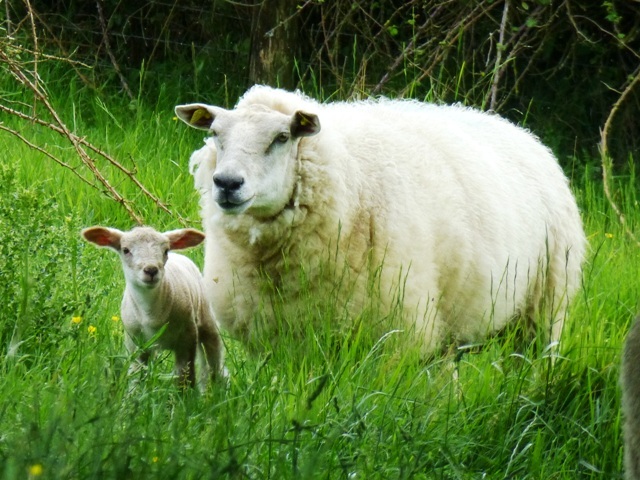 April 2015 – Back from a fantastic holiday to find more new lambs and no heating! Off-roaders here last weekend and for the next two before the road bike season starts in May. 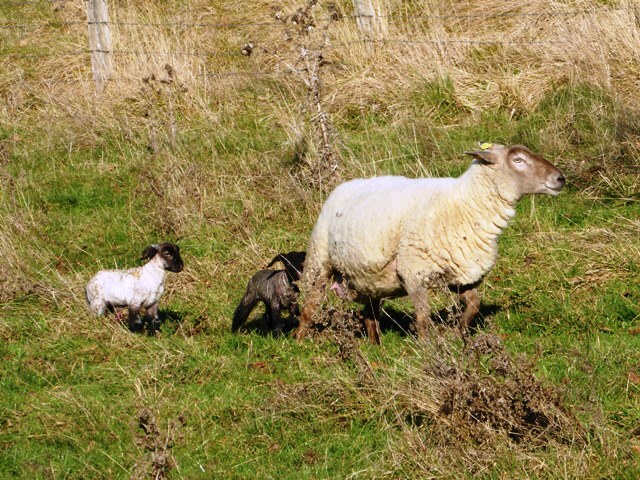 Huge thanks to Stewie & Charlie for helping search until dark last Sunday for a missing, heavily pregnant ewe. 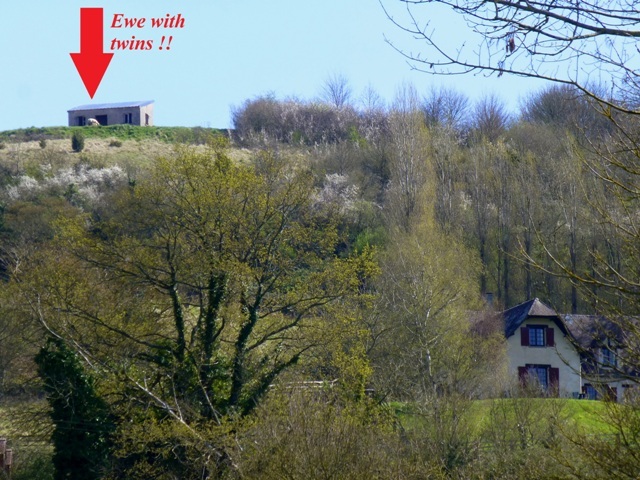 Although we didn’t find her we did find her the next day on top of the hill behind our house – with twins! 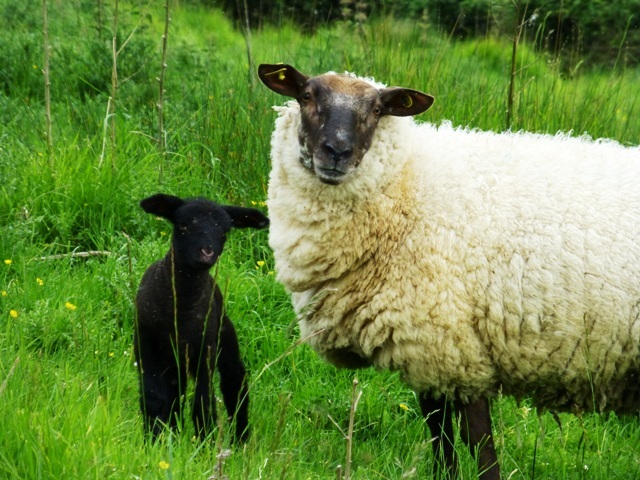 We drove the van through the fields and brought her back in the trailer, all are doing well. 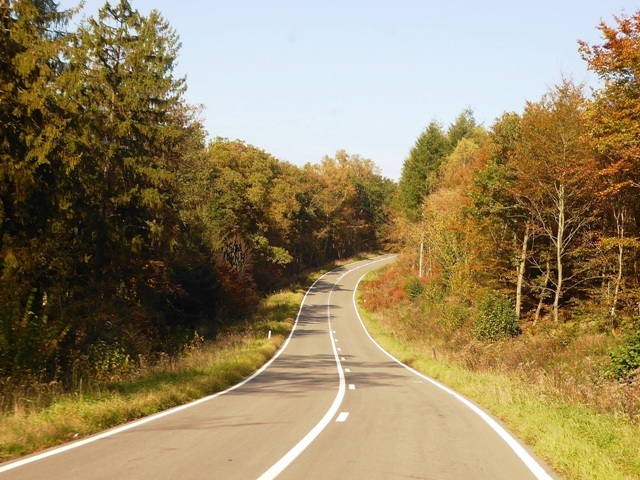 Important News: From 1 May 2015 1 January 2016 (updated May 2015) it will be a LEGAL requirement for motorcyclists to carry a high-visibility vest to be worn in the event of a breakdown (this already applies to car drivers). Penalty will be 90 euros. From 30 June 2015 it will be ILLEGAL to use any “hands-free” kit in a car or on a motorcycle with any sort of listening system whether an earpiece, earphones or headphones – the only exception is a wireless bluetooth system. 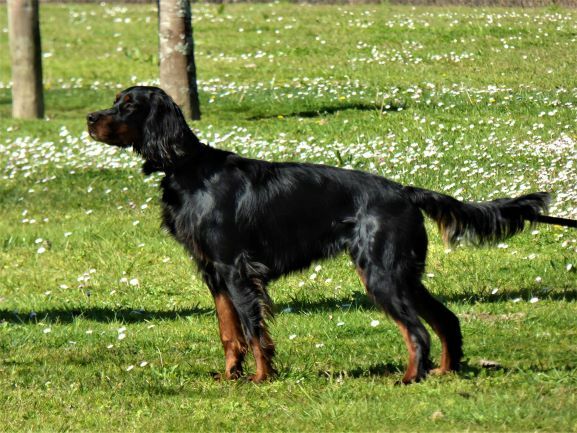 The sanction for non-compliance has not yet been decided but it is expected to be a 200 euro fine (as applies in Spain). Please always refer to our Advice page for the latest requirements. 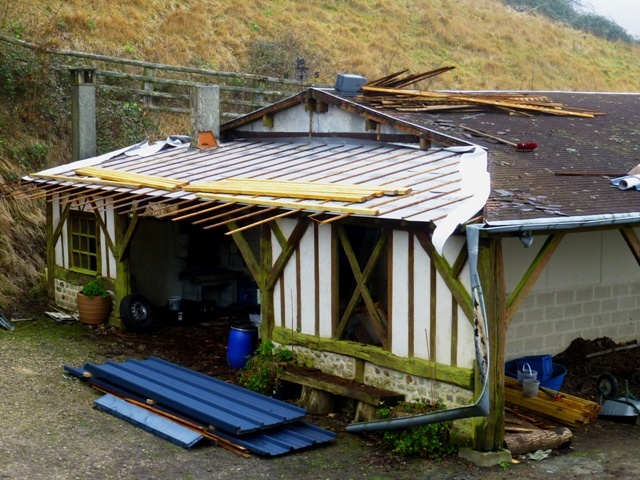 March 2015 – Our off-road season has started (see Bike Normandy Short Breaks) but after just two weekends we’re taking a holiday until 1 April – so please bear with us if we don’t reply to e-mails during this period. See under Press Releases for several articles written about us last year – thanks to those who went to the trouble to do this. 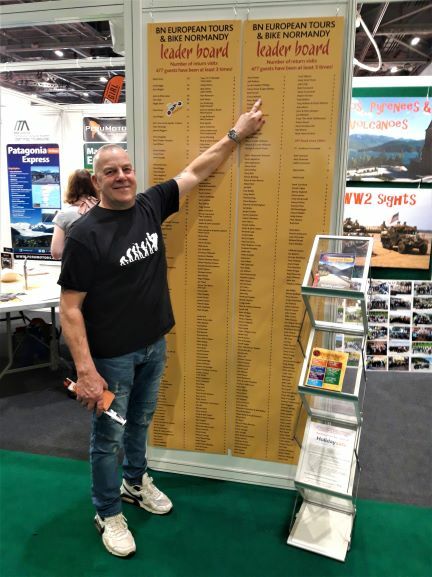 February 2015 – Great to see so many guests at the London ExCeL show – sorry some of you couldn’t find us – thanks go to MCN for getting our stand number wrong in the guide! 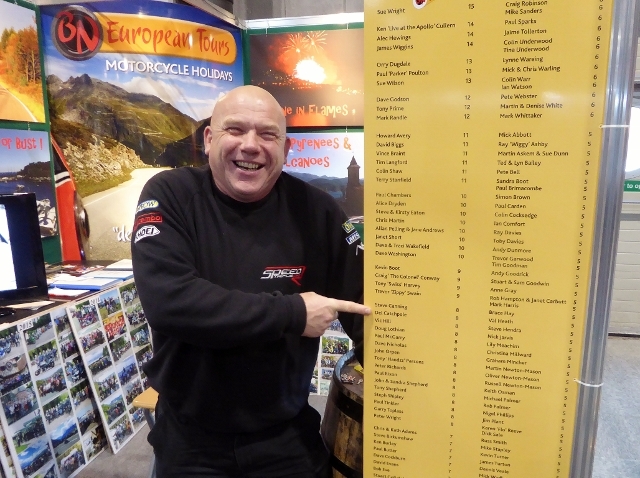 We’re absolutely amazed to have taken so many bookings for 2016 so the calendar has now been updated to show provisional 2016 European Tour dates. We’re off on holiday mid-March – the same one we should have done last year – but had to cancel when John fell off the barn roof! 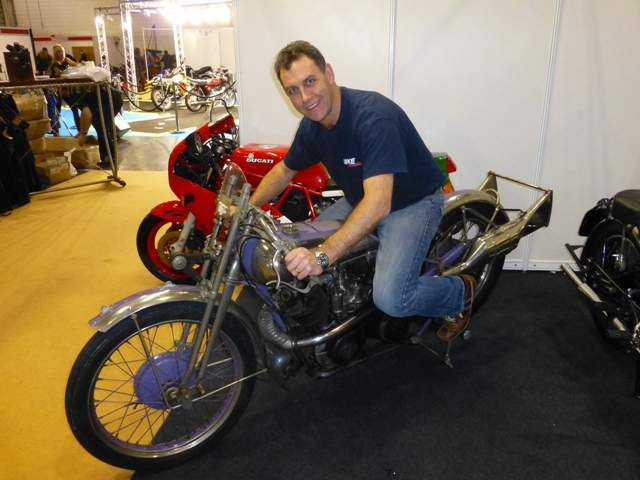 See Valentino Rossi’s Championship winning bikes…John gets to sit on a Brough Superior worth £600,000 !!! Meet some of our crew! 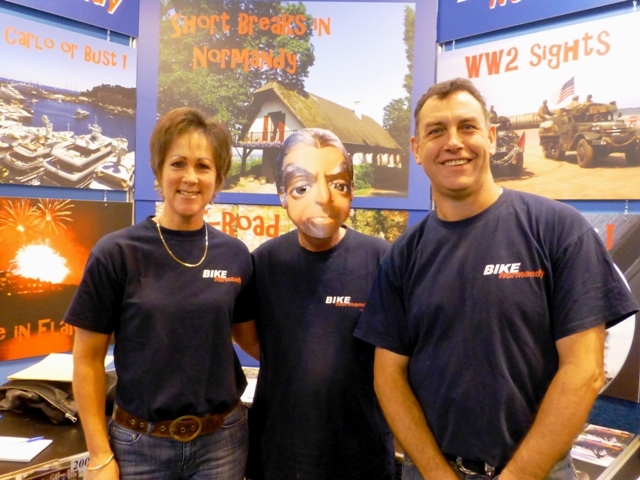 Martin & Denise White with Allan Pelling & Jane Andrews, Jane is our new BN European Tours representative in England. 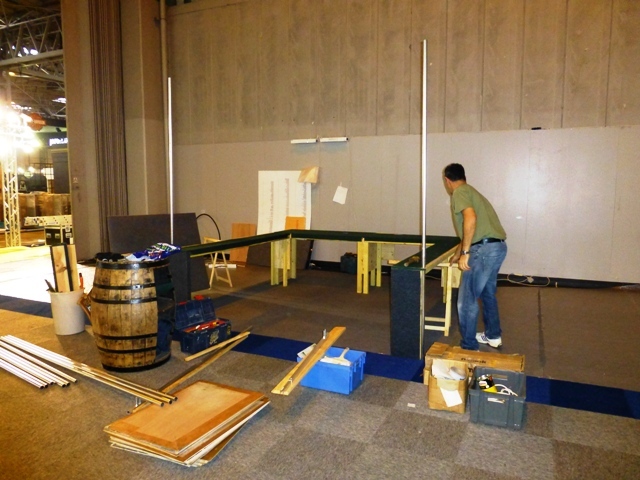 We start with an empty shell and after 7 hours finish up with our stand! 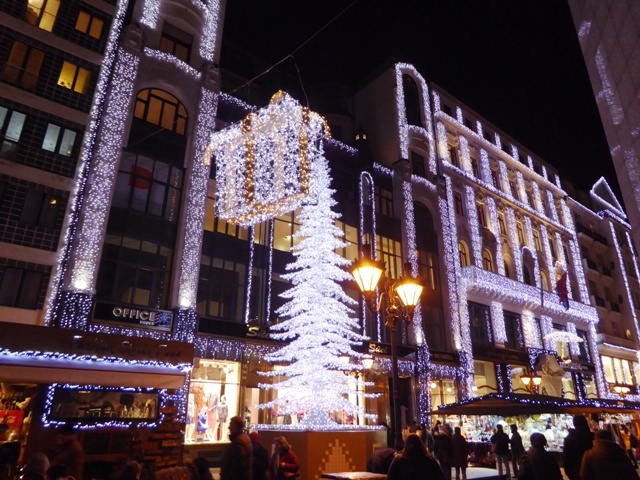 January 2015 – Happy New Year! 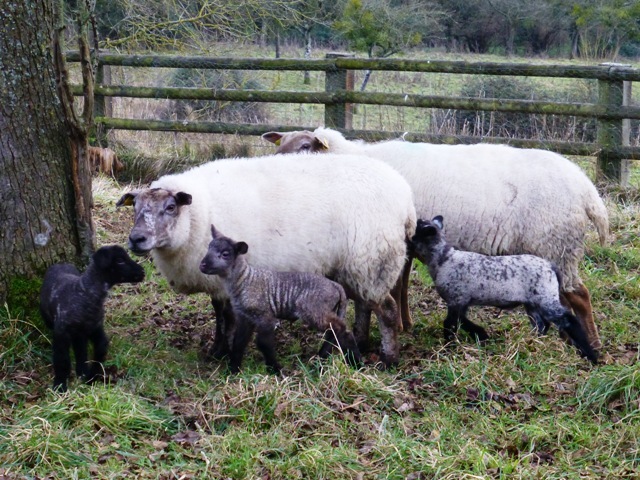 Our first lambs arrived on Christmas Day and we already have seven – with more to come. 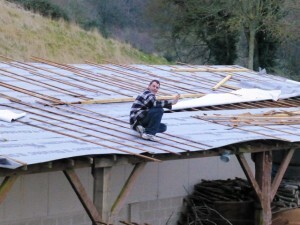 After a storm wrecked the bird table John has been fixing the roof – the only roof he’s allowed anywhere near!!! 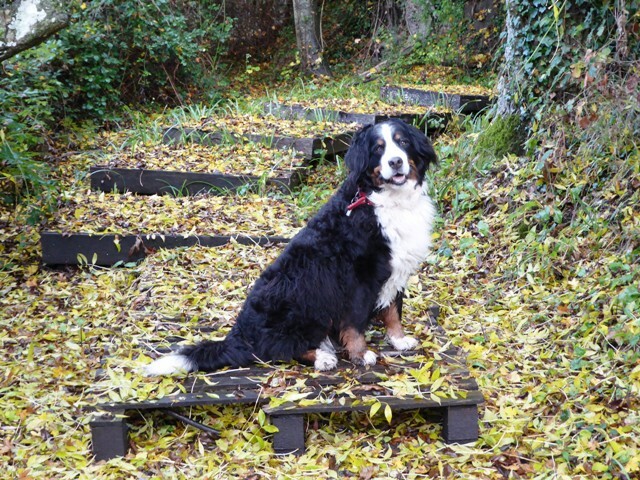 His physio is going well and he’s coming on some walks with Della. 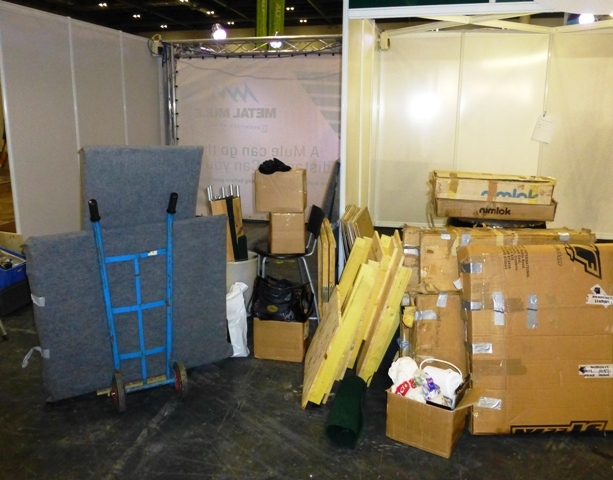 We’ll be exhibiting at the London ExCel show 13 – 15 February on Stand A140 so do come & see us. Cancellations: although previously advertised as FULL there are now two bike spaces on our Italian Lakes & Swiss Alps Tour in September. 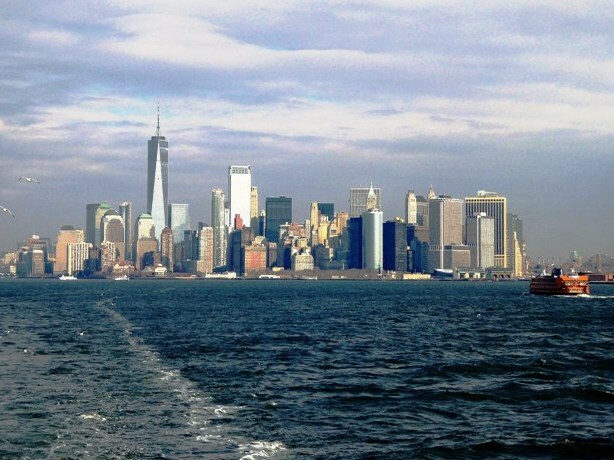 For all Tours please see the new Availability page. 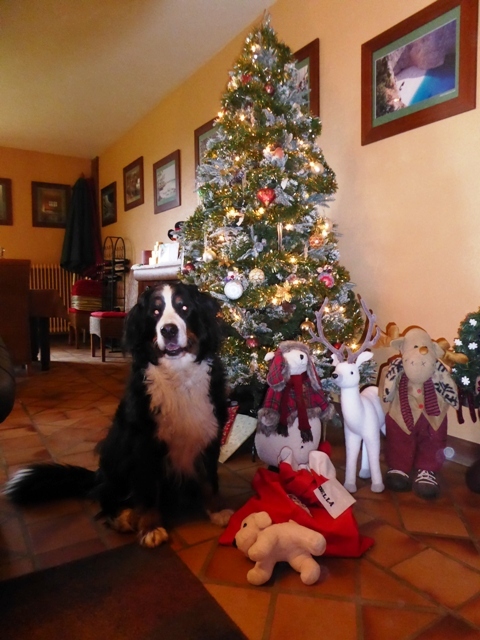 December 2014 – Wishing everyone a very Merry Christmas & a Happy New Year. 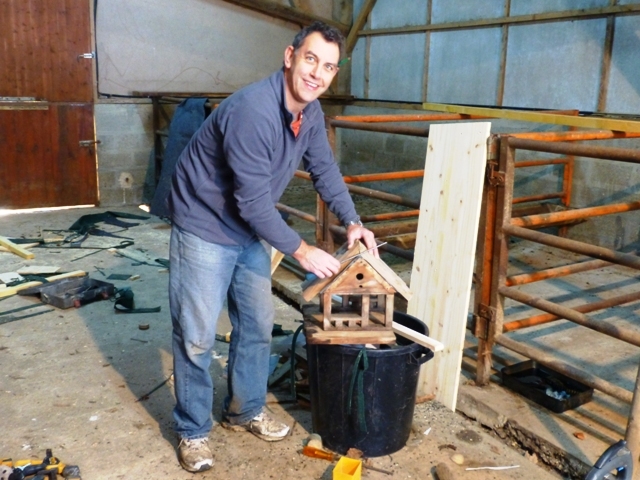 (Jen’s off to Gambia with a friend for a week as John is unable to fly (although it has been said several times that he clearly thought he could when leaping off the barn roof!!!) See you next year! 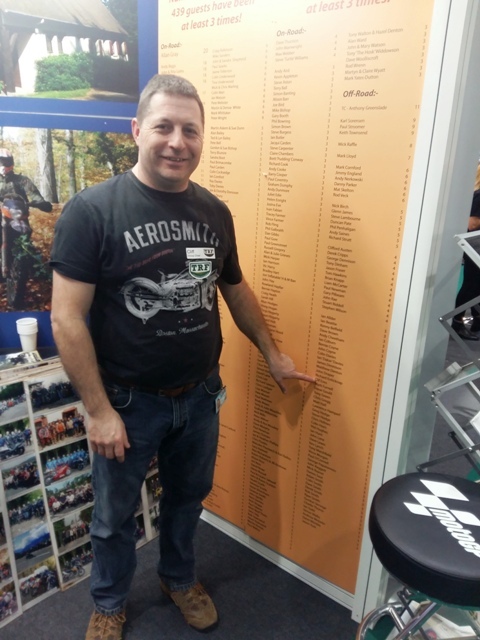 November 2014 – Great to see so many of our guests at the NEC Bike Show and we hope to see many new faces next year. 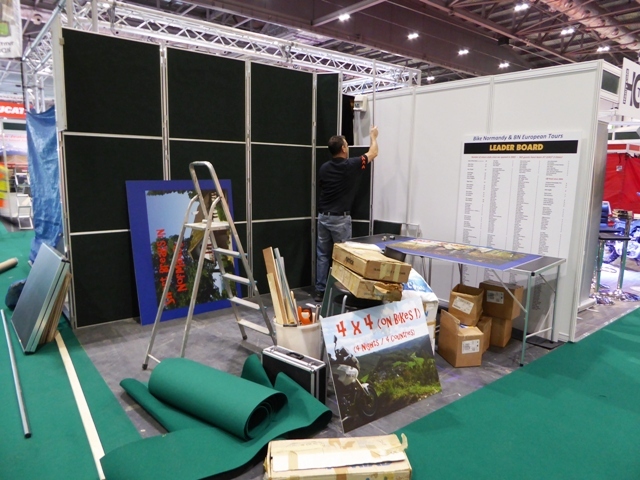 Thanks to Dave Washington and Garry Toplass for helping man our stand again this year. 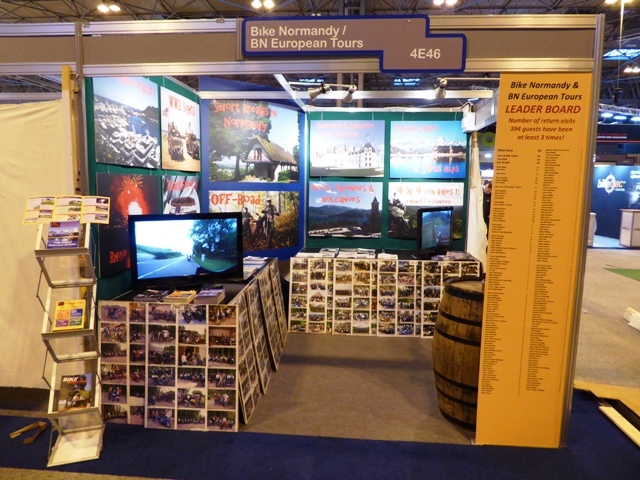 Many of you will have noticed the re-branding of our Tours division on our stand and on our 2015 brochure. BN European Tours Limited was incorporated in 2014 (100% owned by us) and all our European Tours will now be run through this company. There will be no change at all to the way the Tours are run as far as our customers are concerned, the only difference being that information regarding our Tours can now be found on the website www.bneuropeantours.com. If you are a new customer looking at this site you can see some of our history below. 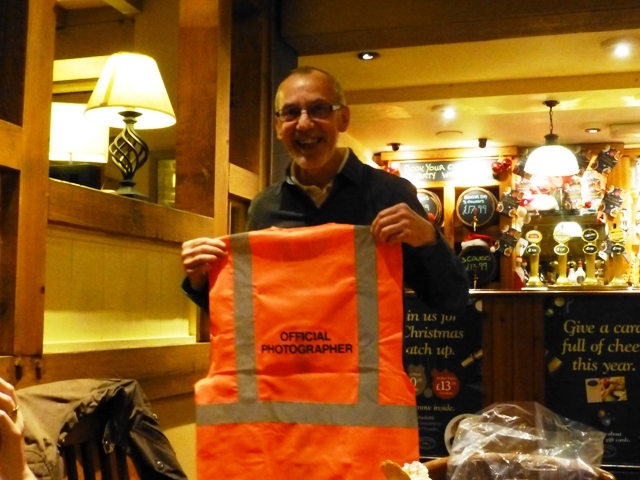 Martin, Denise & Becks White, Craig Robinson & David Joesbury…at dinner David presents Martin & Denise with “official” high-viz jackets! And finish up with this…a special guest appearance by “Parker”! 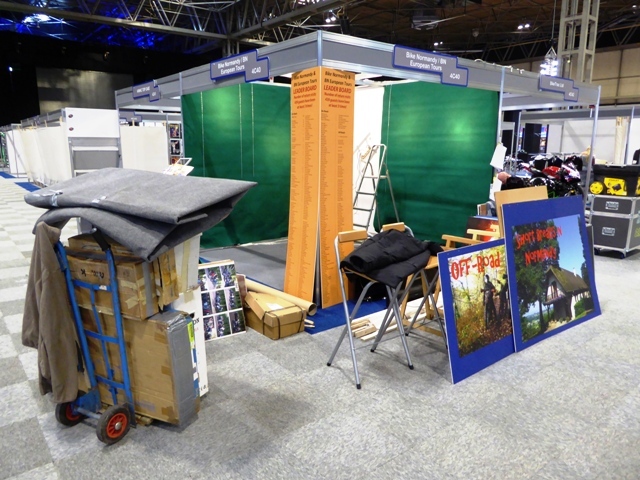 October 2014 – Last minute decision to exhibit at the NEC Bike Show – come & see us on Stand 2E10 – opposite Ariel Motorcycles in Hall 2. October 2014 – Just back from finishing the research for the Italy/Switzerland Tour – if you’ve been on any of our tours and thought they were good – this one will blow you away! Yes, you WILL ride this Pass! 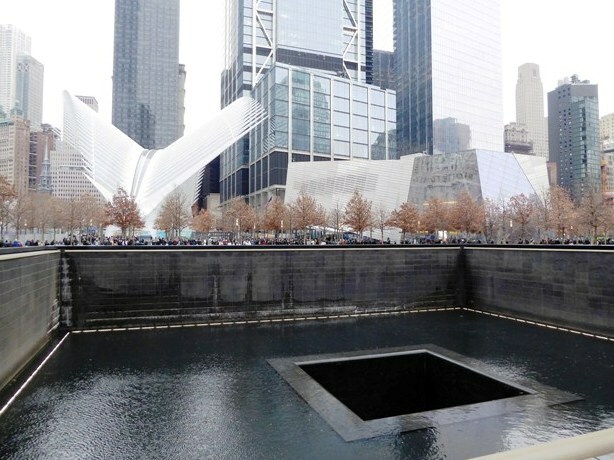 (photo taken Sat 11 October!) The Tour webpage is now live. 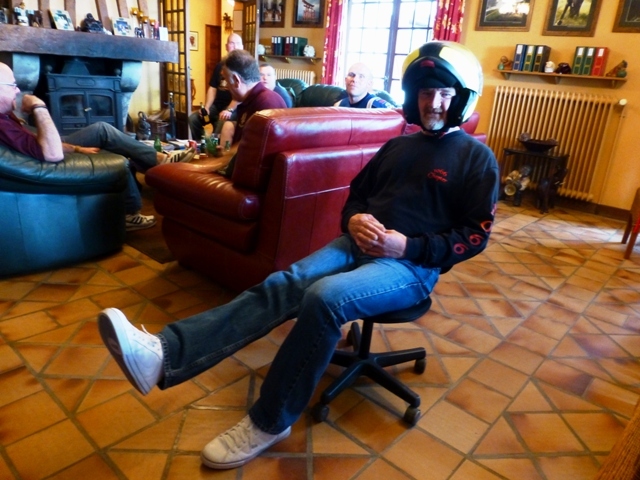 As John no longer has need of the old “Office Chair” to get around we have abandoned our “Star in a Reasonably Priced…” and emptied the piggy bank – we’ve sent a cheque for £35 to the charity Riders For Health so thanks to everyone who took part and made a donation. 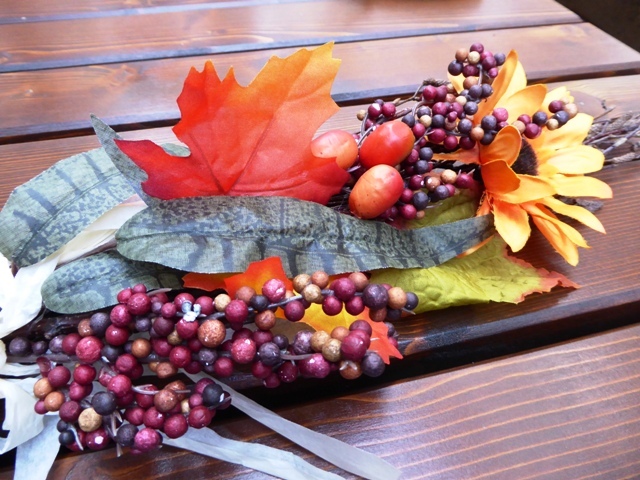 October 2014 – That’s it! The two 4×4 Tour reviews are now live and the road-riding season has finished for another year. 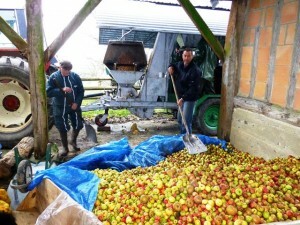 Thanks again to all those guests on the short breaks who have helped dish-up and clear-up while John was out of action. Off to Switzerland now to finish the research for the new tour next year “Italian Lakes & Swiss Alps” – the webpage will hopefully be live later this month. 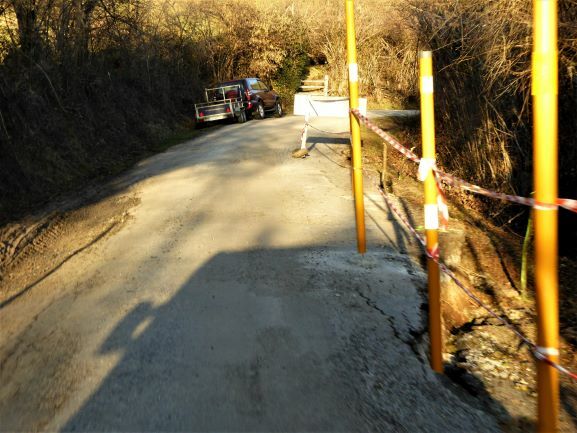 Off-road breaks start on 17 October. 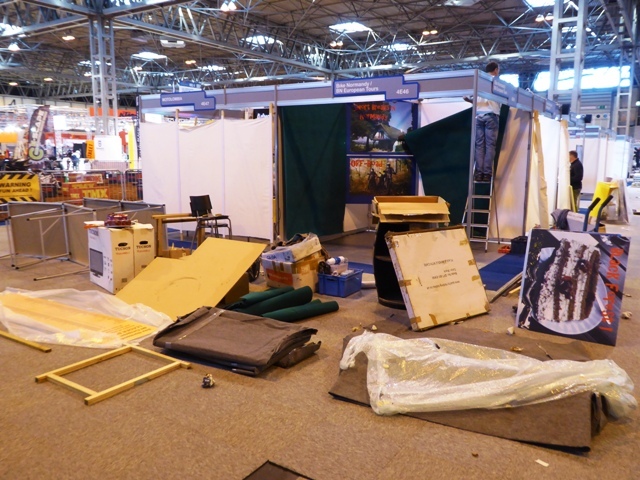 We still haven’t made our minds up whether to exhibit at the NEC this year but will announce here if we do decide to go. 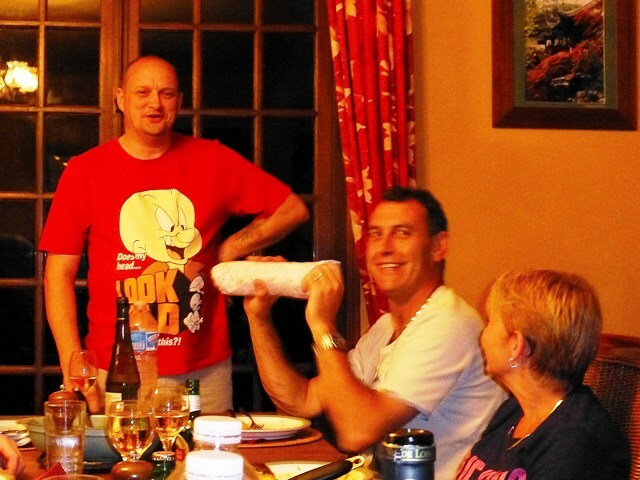 September 2014 – Monte Carlo or Bust! 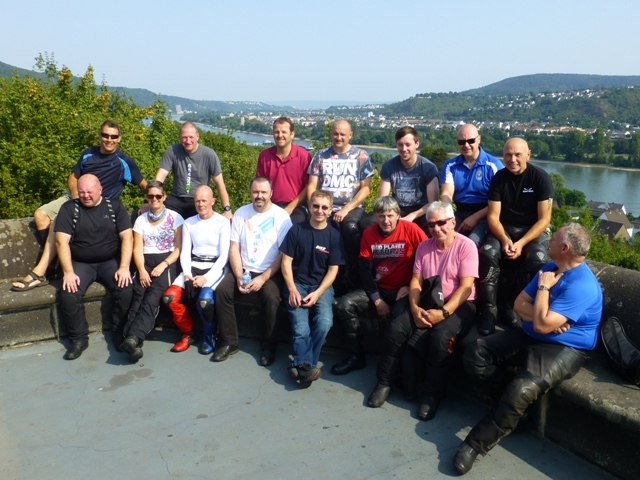 Tour review is now live – another great trip with fantastic weather, guests & riding. Two 4×4 Tours still to come before we start the off-road season. John has had his last operation & is now tentatively taking a few steps – thanks to Paul Sparks & Paul Chambers for their gift of a can of Red Bull (Gives you Wings!) and a “I Wish I Could Fly” T-shirt!! 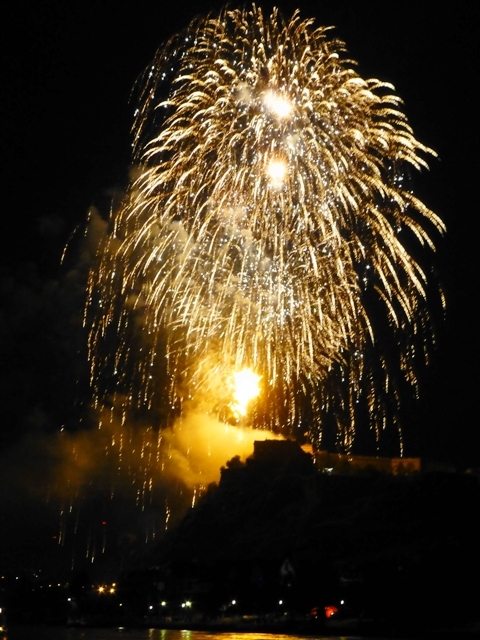 August 2014 – Rhine in Flames Tour review is now live – a new trip this year and what a fantastic spectacle it was! Off to the Black Forest next for our second trip there this year. 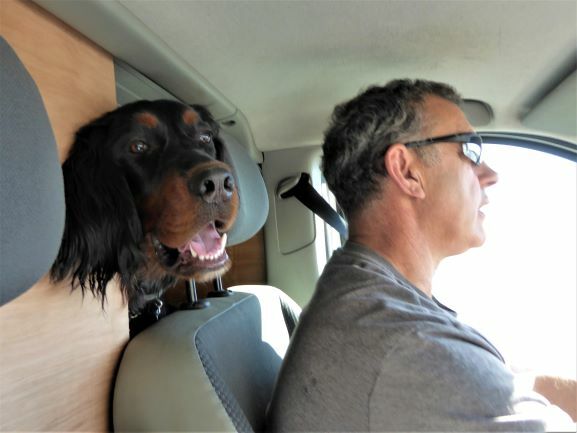 John does have to have a further operation on his ankle – this will be in early September so thanks go to Tim Hale for driving the van for us on the recent Tours. 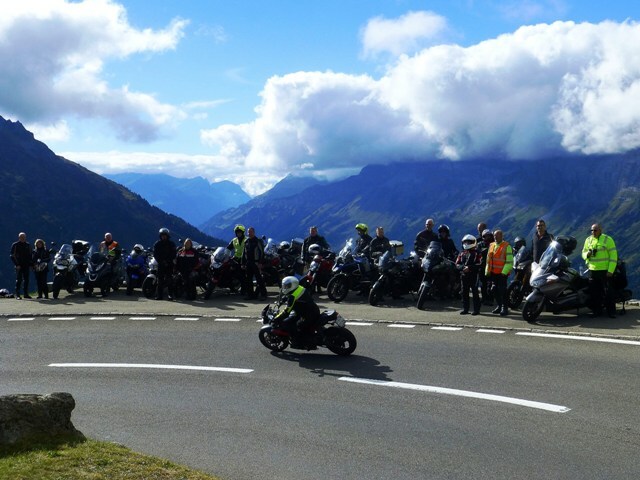 July 2014 – Picos, Pyrenees & Volcanoes Tour review is now live – a great riding tour already getting booked up for next year! 2015 Tour dates are now showing on the calendar – we’re having to fix dates earlier each year – and places are being snapped up – so if you are considering doing a tour with us please register your interest to avoid disappointment. John has finally had the plaster cast removed from his ankle (24/7) and has an appointment for a scan next week to see if he needs a final operation. 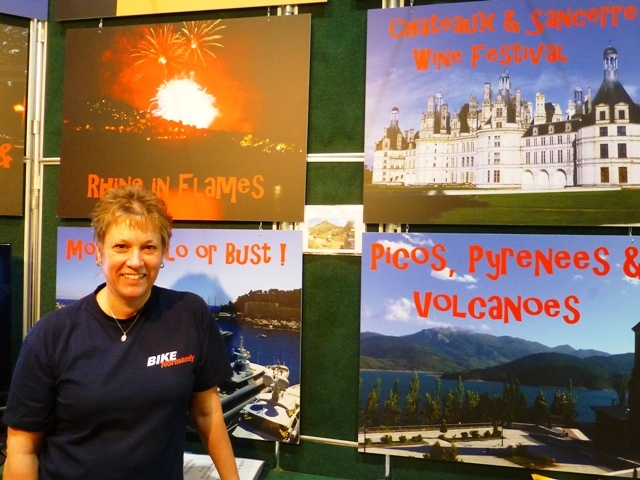 June 2014 – Chateaux & Sancerre Wine Festival Tour review now live – Black Forest Tour to follow shortly [now live]. Thanks to Janet “Parkerette” Short and the original “Parker” for driving the van and John on these two tours. 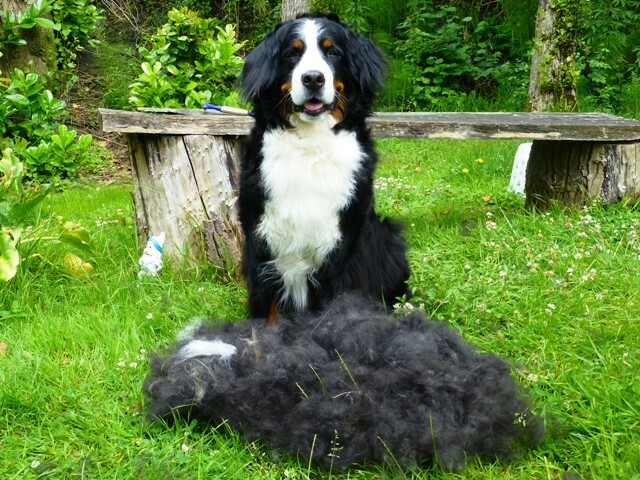 Having spent a few weeks in kennels Della’s had a shampoo & brush (you’d think she was never brushed the amount of fur collected!) 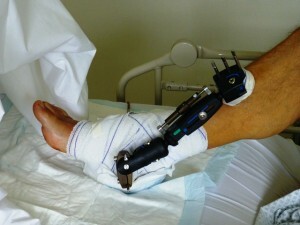 John’s been in & out of hospital to have his “steering damper” removed and is now “resting” and watching the football! Those of you who have been asking for next year’s tour dates you now know why they’re not yet showing on the website!! 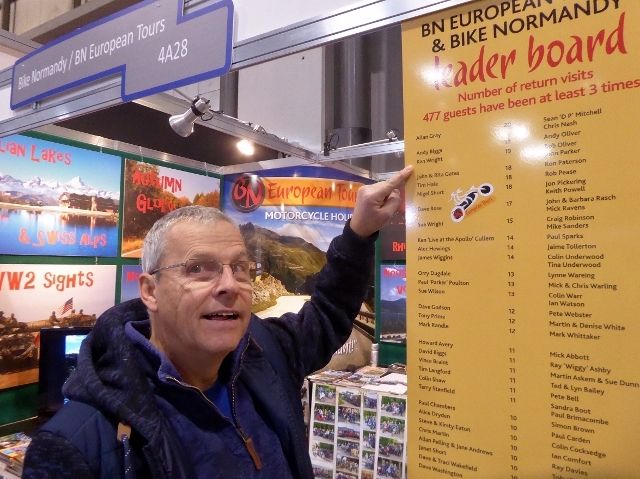 26 May 2014 – Four places now only one – just available due to cancellation 1 – 3 August (leisurely/moderate riding). 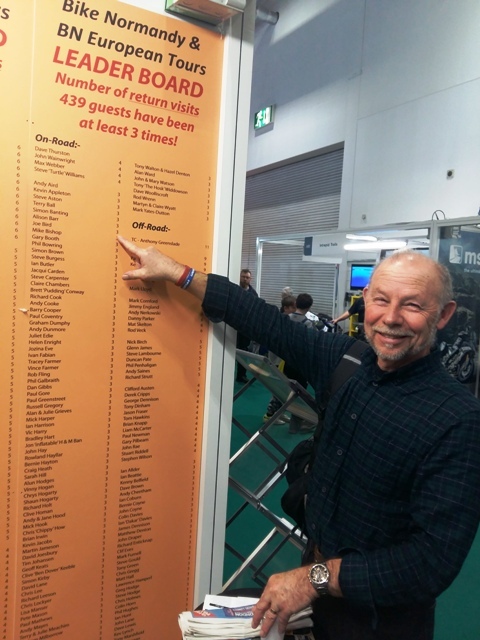 New leader in the “Star in a Reasonably Priced Office Chair” tournament – Graham Blunden with 22.03 seconds!! WW2 Tour review now live. 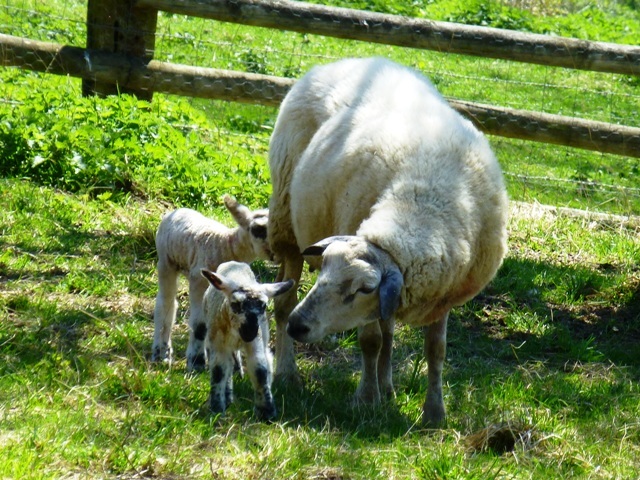 And look at the late arrivals – our two new lambs. 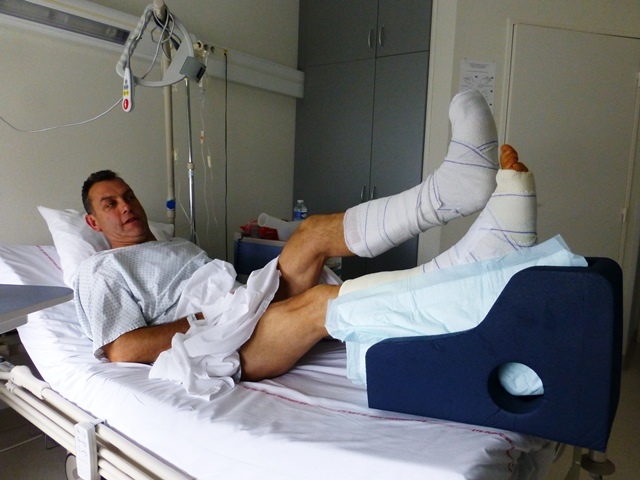 May 2014 – Having seen the specialist in Paris, John has had his “steering damper” adjusted but still needs a fourth operation in about six weeks time to remove some loose bone in his heel. He’ll then have to be in plaster for a further two months so no riding for him this season – although he hopes to be on the Tours as a passenger in the luggage van! 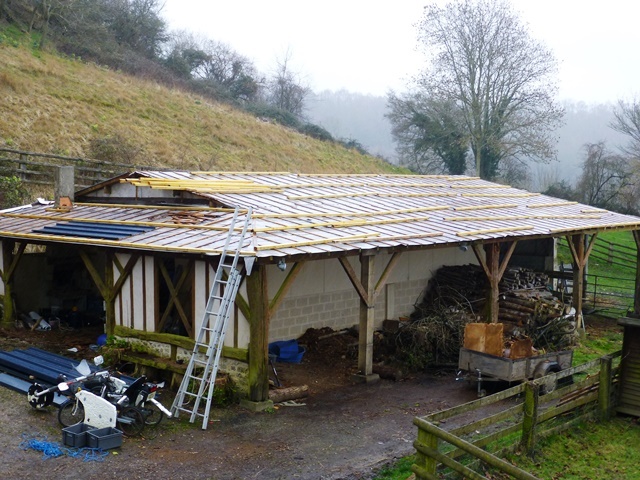 The barn roof has been finished by a local artisan, the off-road season has ended and we’ve had our first two on-road groups here. 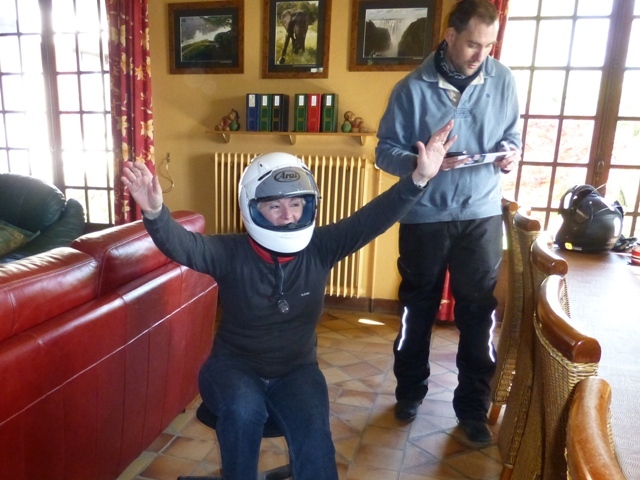 This led to some fun & games last weekend as we commenced our own “Star in a Reasonably Priced Office Chair” tournament – a new race leader board will shortly be live on the website and we think that Sue Wilson with a lap time of 30.59 seconds is going to take some beating!! April 2014 – After returning to hospital 3 weeks after his first operation for a check-up the surgeon decided John’s ankle was not set correctly so he’s had a second operation and now has a “steering damper” screwed into his leg! He’s back home after spending two more weeks in hospital but has to go to Paris at the end of April to see a specialist for a second opinion as there still may be some internal damage…needless to say he will not be back on a bike for the start of the road-bike season in May! 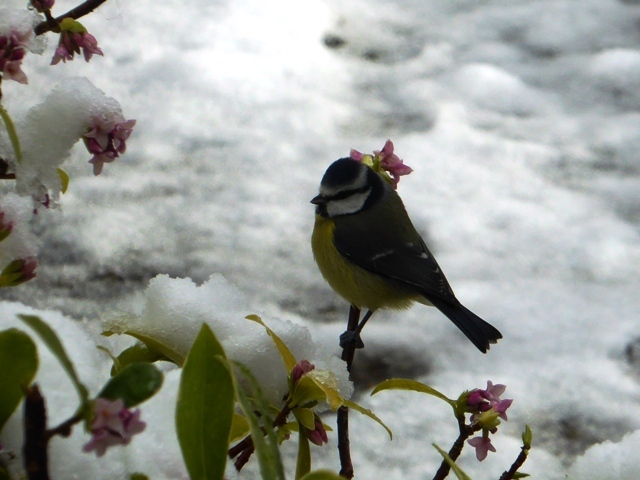 March 2014 – 30oC in the sun today (5th) – Spring is here! 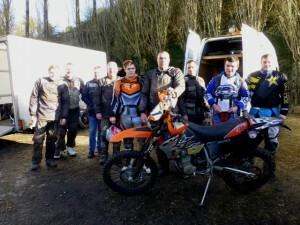 Our first off-road riders were here last weekend with two more weekends to go before we escape on holiday! Progress on the barn roof – the new sheeting is being laid and the end is in sight! 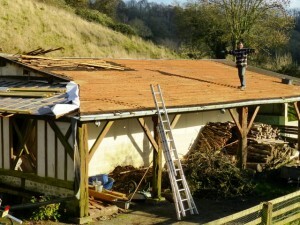 Well, it was until John slipped off the roof one day later & broke his ankle!! 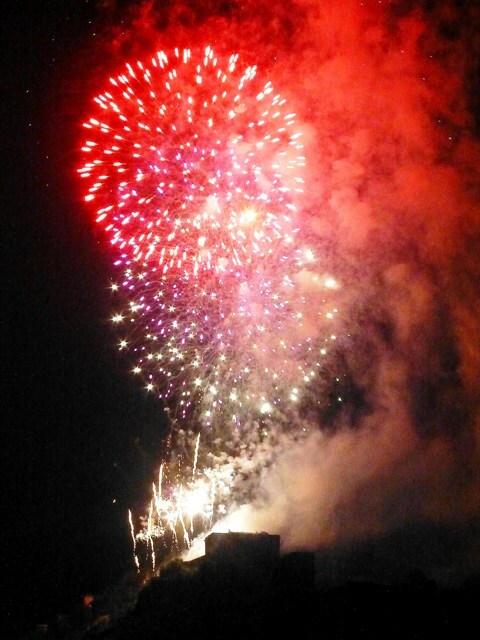 Bang goes the holiday!!! Stop Press! 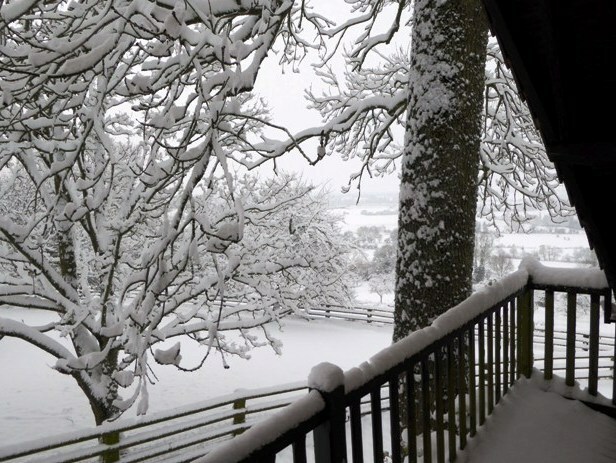 26 Feb – following cancellations we now have spaces on two short-break weekends: 2 places 10 – 12 May (leisurely/moderate riding only) [taken 4 March] and 2 places 19 – 21 September (moderate riding & visiting some WW2 sights) – first come – first served! 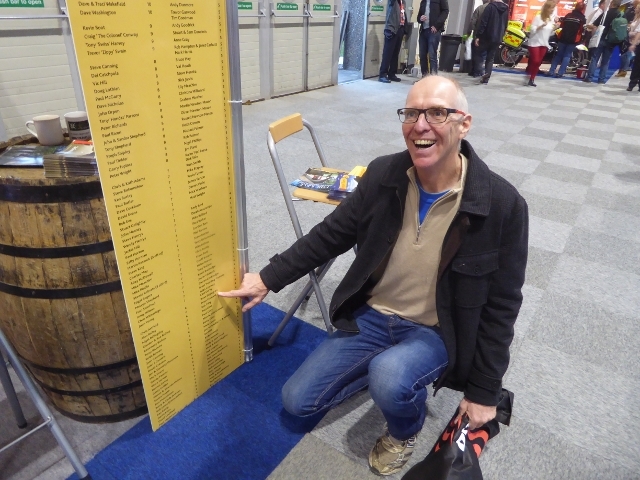 February 2014 – Back from exhibiting at the London ExCel show, great that so many customers came to see us (perhaps more to sample the calvados than to see us!) 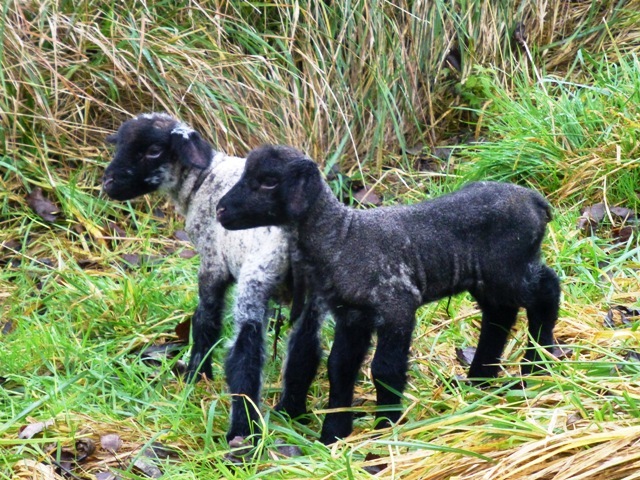 Two more lambs had arrived whilst we were away. High winds & rain have slowed work on the barn roof but with 18oC (24 Feb) John’s finished the waterproofing and we’re almost ready to lay the new sheeting. Off-roading starts 1 March – at least it’s muddy enough for these guys! 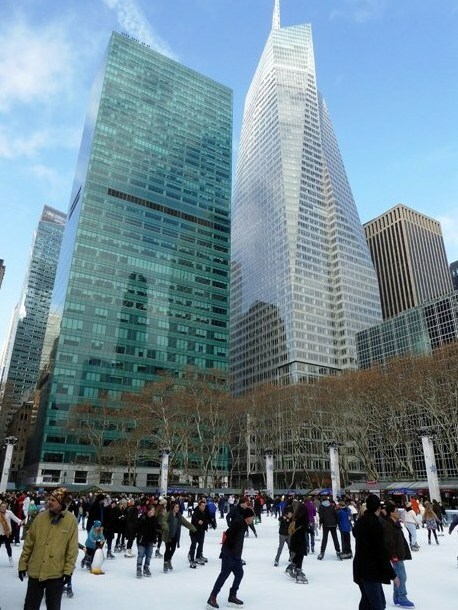 January 2014 – Happy New Year! 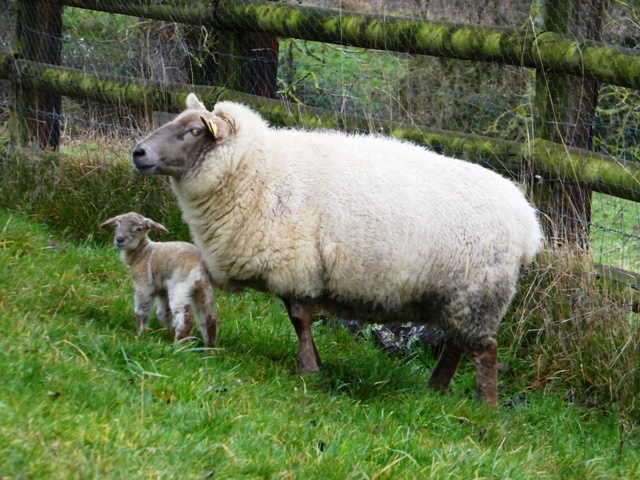 The lambs are arriving – we already have 10 with just 3 ewes still to give birth. The apples have been pressed for this year’s cider and we’re now in the process of removing all the old tiles & wooden slats from the barn roof ready to replace them with new slats, a waterproof lining and metal sheeting – should keep us busy for a few weeks! 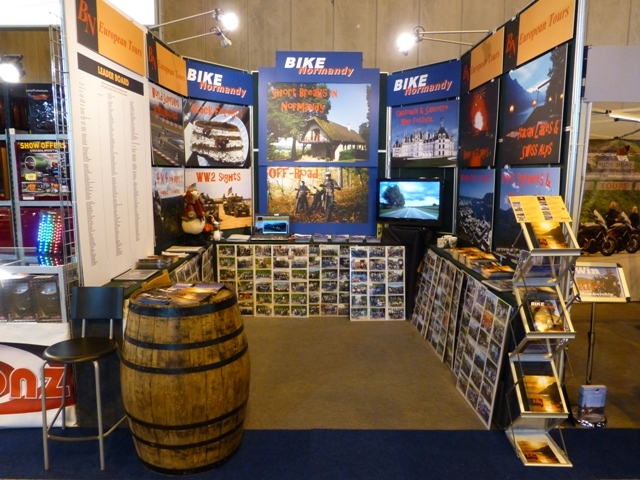 We’ll be in the UK to exhibit at the London ExCel Motorcycle Show 14 – 16 February so do come & see us if you’re there. 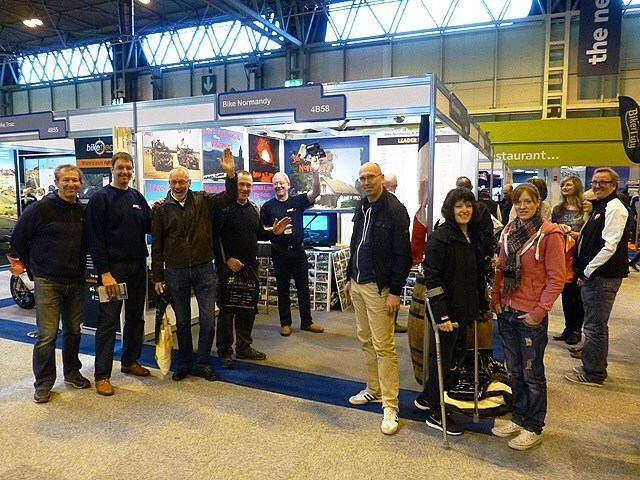 December 2013 – Great to see so many customers at the NEC and to meet some new faces. 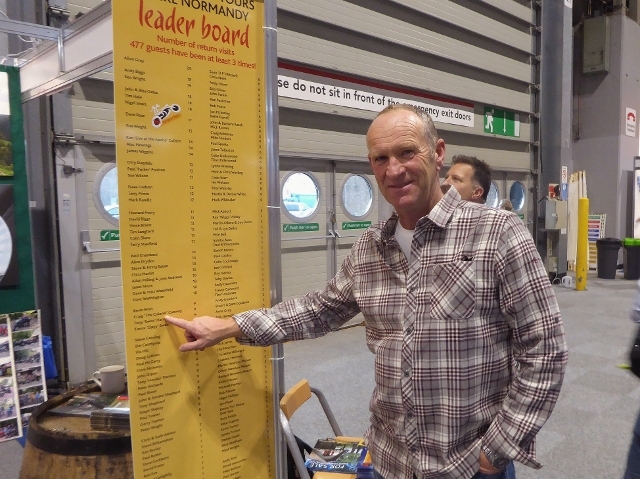 Many thanks to Dave Washington & Gary Toplass for their help manning our stand at the weekends – much appreciated. 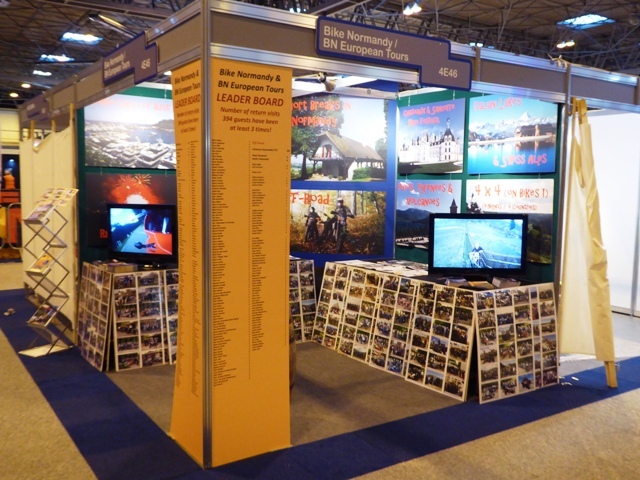 Thanks too to those who commented or sent us feedback on our new poster-boards – we were really pleased with the stand this year. We also had a surprise guest appearance by “Parker”! 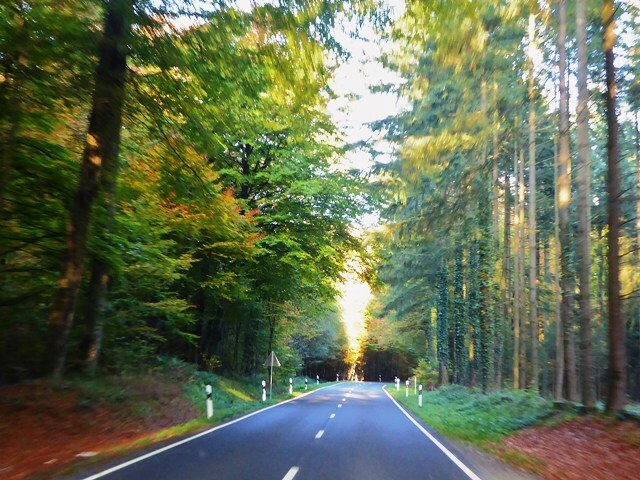 (see review August Black Forest Tour). Now back in France after a week in the Gambia we are gradually contacting all those who have enquired about Tours for 2014 – please bear with us – we will get back to you. 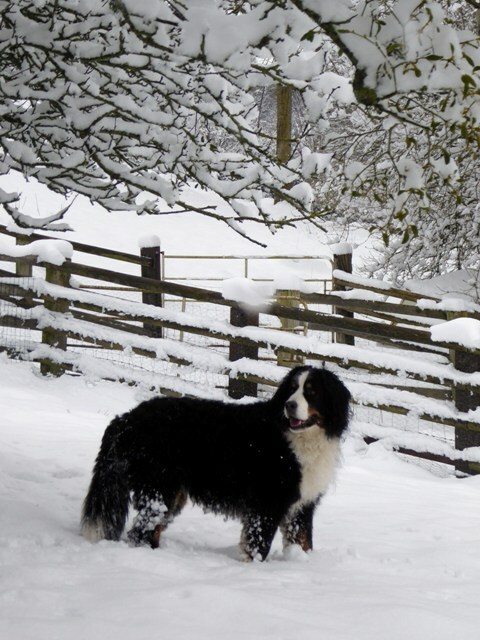 And finally, thanks to those who have sent us Christmas cards – we hope everybody has a very Happy Christmas and send our best wishes for 2014. 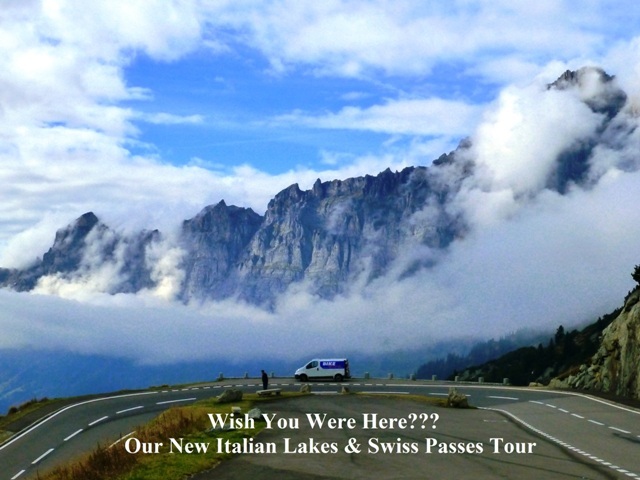 November 2013 – Back from 10 days researching our new Italian Lakes & Alpine Passes Tour for 2015 – many passes already closed due to snow but as it was so scenic we thought we might run the tour in the winter!! 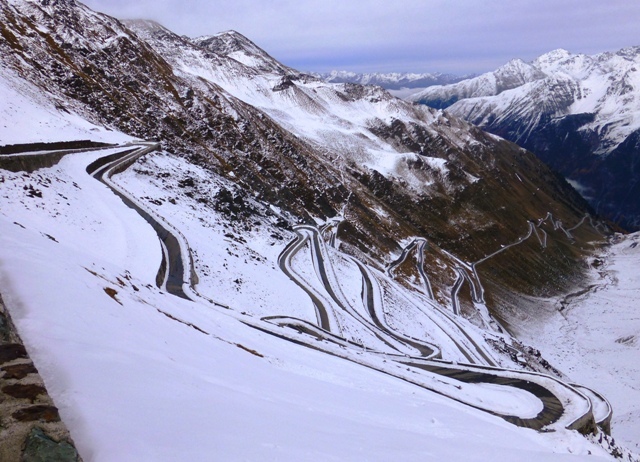 (see pic below of the Stelvio Pass). 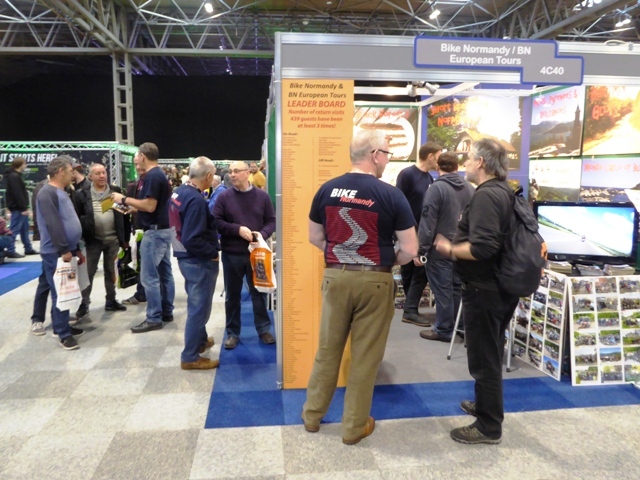 Last two off-road groups before we head over to Birmingham for the NEC bike show (stand 2C65) and then a week of sunshine in Gambia. Hope to see many of you at the NEC. 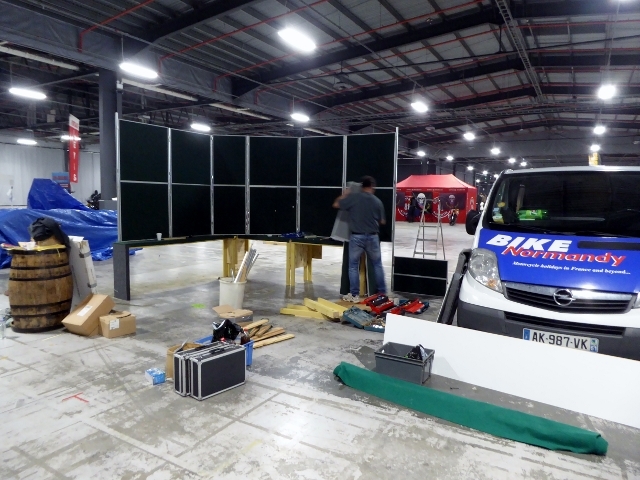 October 2013 – Now into our off-road season and getting ready for the NEC. 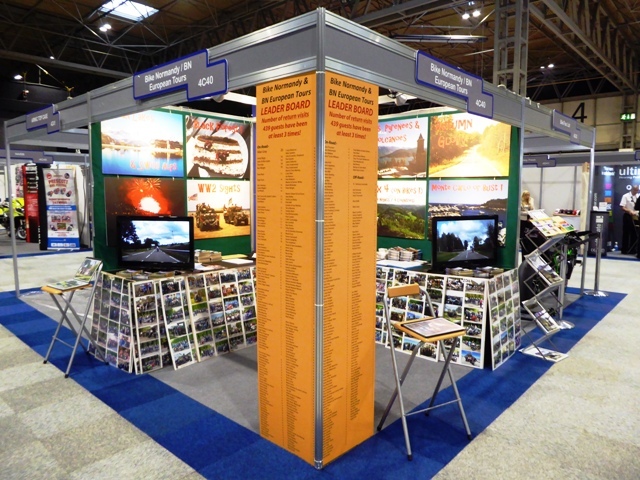 New posters & brochures this year so do come and see us on stand 2C65. 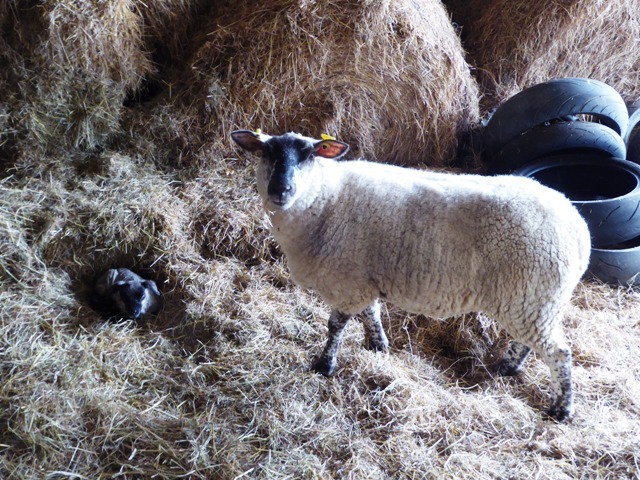 Sadly Zuki (kitten) has disappeared – we believe taken by a buzzard – but we have taken delivery of two goats to add to our 11 sheep. 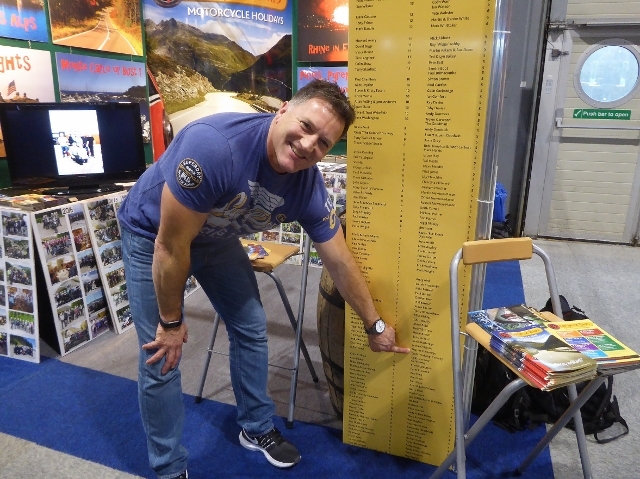 Off to Switzerland now for 10 days to do research for a new tour in 2015 before next off-roaders arrive. 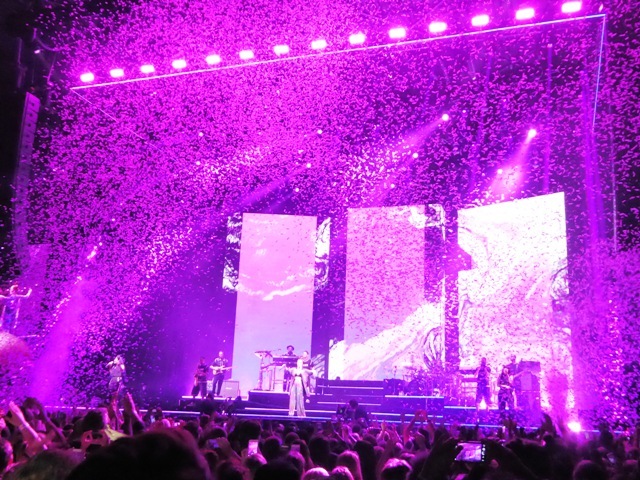 September 2013 – Just back from Monte Carlo – another fabulous tour – take a look at the review and get booked in for next year! Good news for Jen in that she doesn’t have to have a second operation on her elbow. 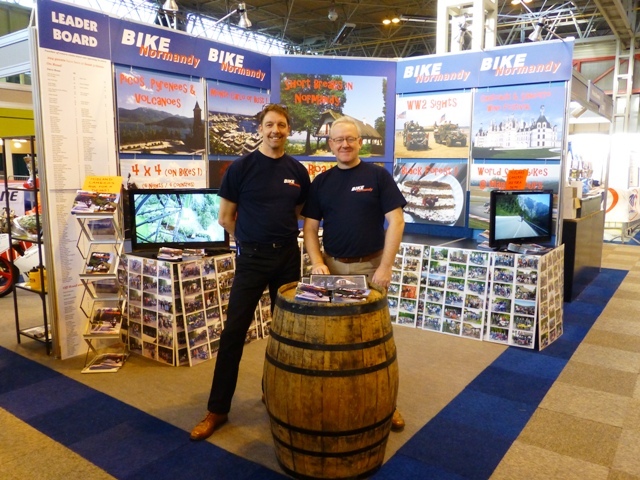 We’ll be at the NEC bike show at the end of November – stand 2C65. There’s no touring zone this year so we’re in amongst all the other exhibitors. We also have a new addition to the family…we came across a tiny kitten in the road & Jen brought it home whilst riding pillion. 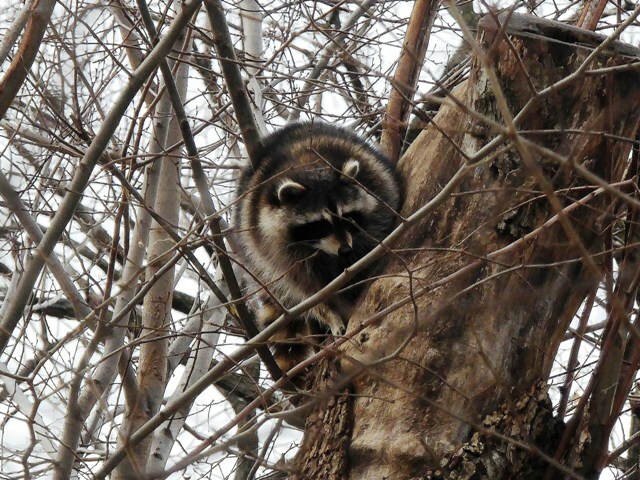 Having returned to try & find it’s owners to no avail Zuki is now happily climbing trees in the paddock and squaring up to Della (dog)! 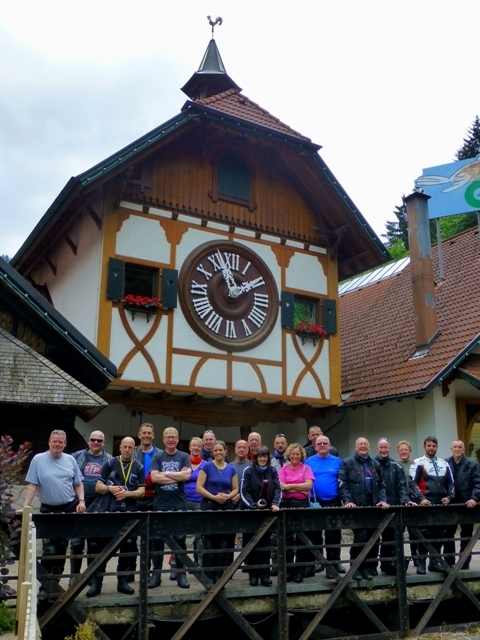 August 2013 – Just back from the second Black Forest Tour this year – a fantastic trip with a great group of people. 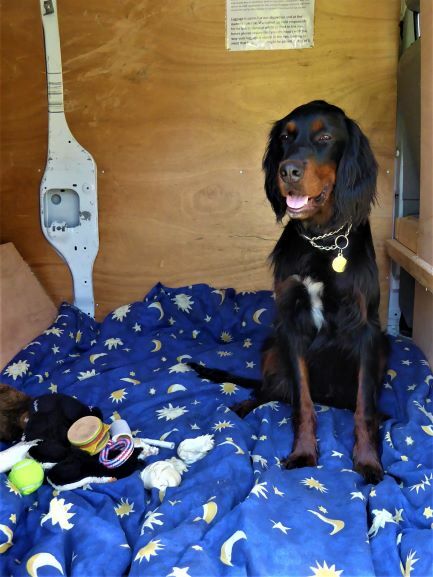 A HUGE thank-you to Paul Poulton – forever to be known now as “Parker” – who stepped in with just one day’s notice to drive the luggage van for “Mi Lady” Jen who came along as a passenger (not wanting to miss out on the trip!). 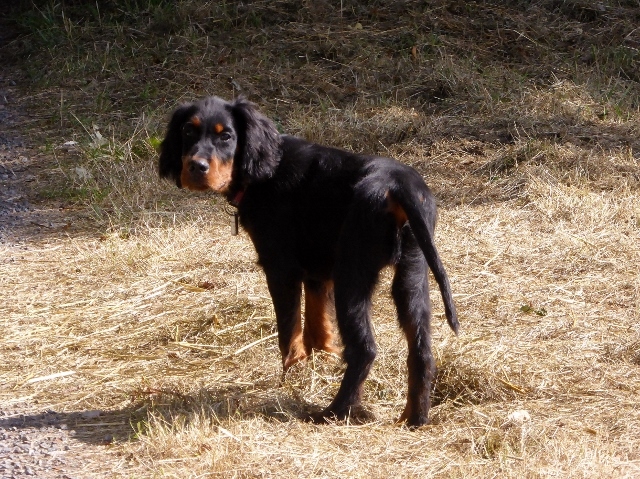 August 2013 – While doing research in Germany for the Rhine in Flames Tour 2014 Della (the dog) pulled Jen who fell and broke her elbow. She spent 4 days in hospital in Germany and now has pins & wires holding her elbow together. 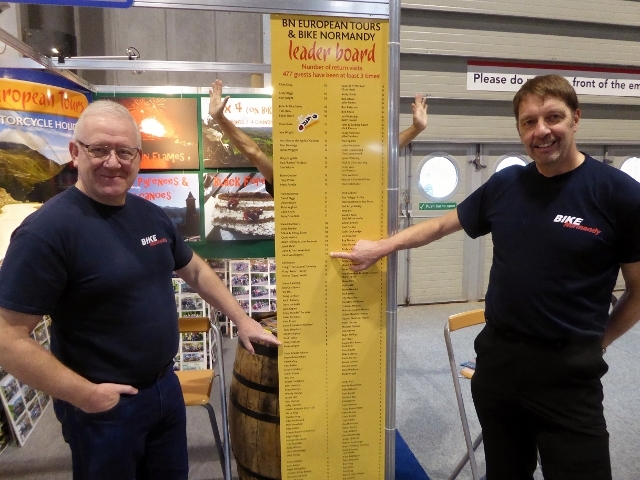 July 2013 – Rouen Armada, Black Forest and 4×4 Tour reviews all now live – see the photos & feedback under Testimonials. 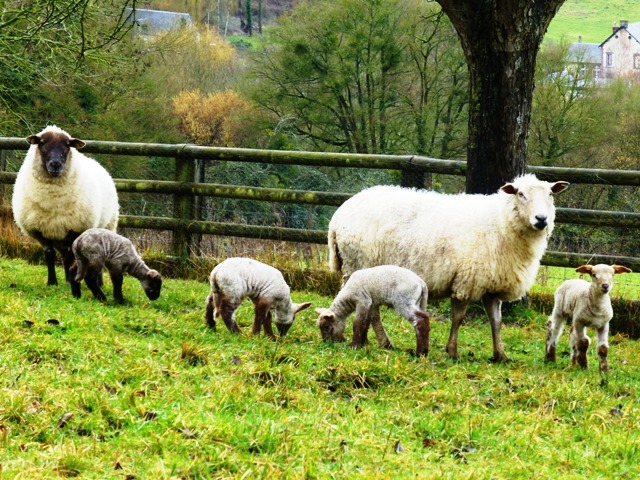 Bookings flooding in for 2014 – for both short breaks & Tours. 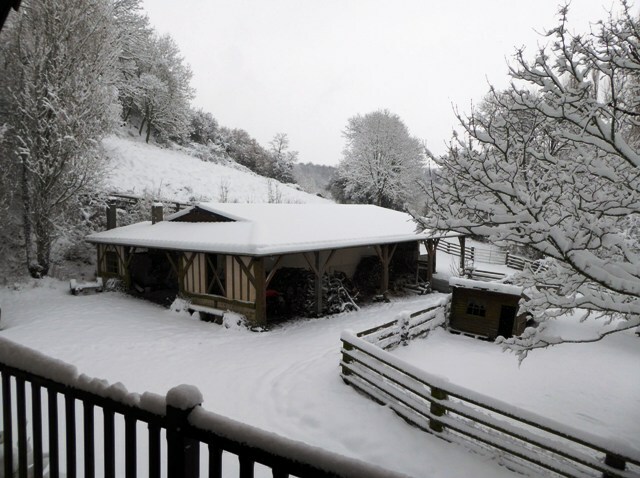 June 2013 – Due to cancellation 1 double room just available on our Black Forest Tour 13 – 19 August 2013 – first come – first served! 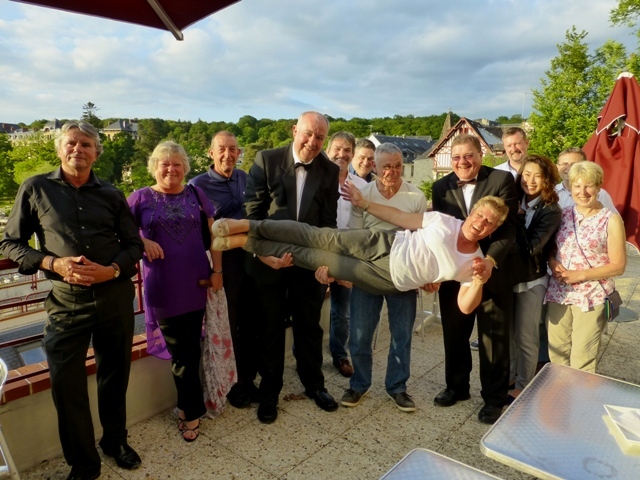 See the review of the Chateaux & Sancerre Wine Festival Tour – great fun. Off to Rouen tomorrow for the Armada Tour. 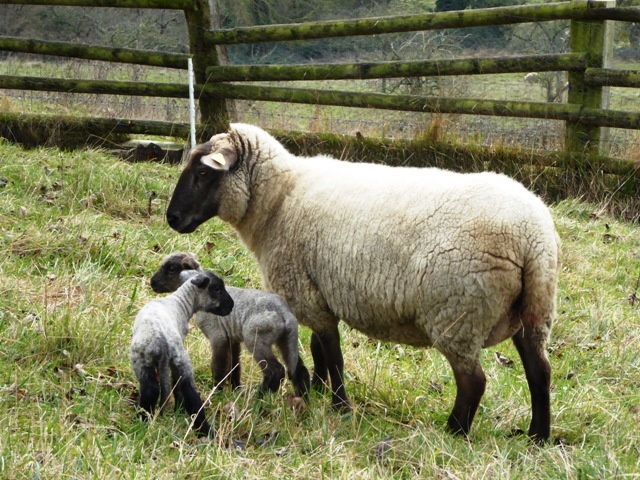 March 2013 – What a surprise ! The French have yet again changed their minds and following a new decree (No. 2013-180) the requirement to carry a breathalyser kit from 1 March 2013 is now in force but there will be no penalty if you do not carry one !! 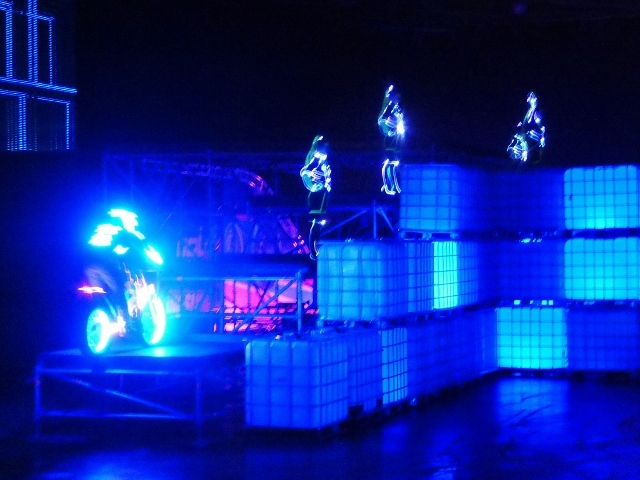 Also there is NO requirement to wear or carry high-viz jackets – the legislation was repealed w.e.f. 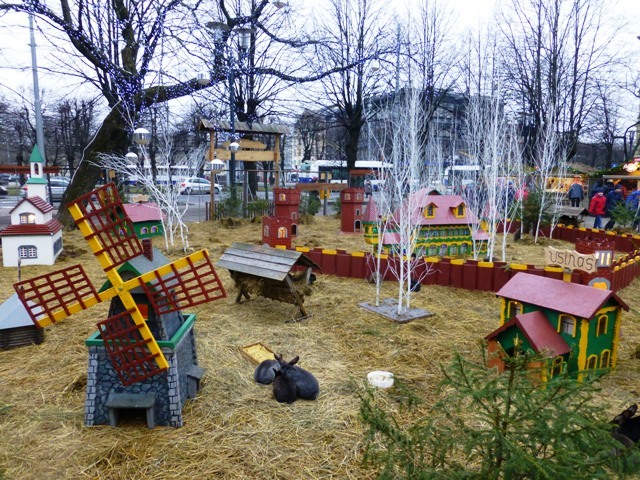 2 January 2013. 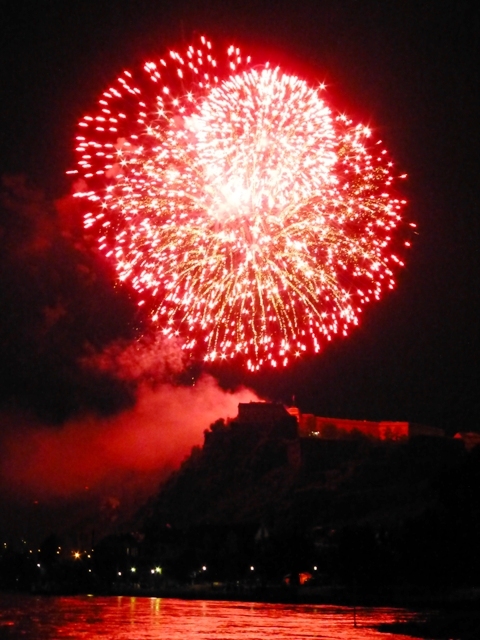 15 January 2013 – Happy New Year. 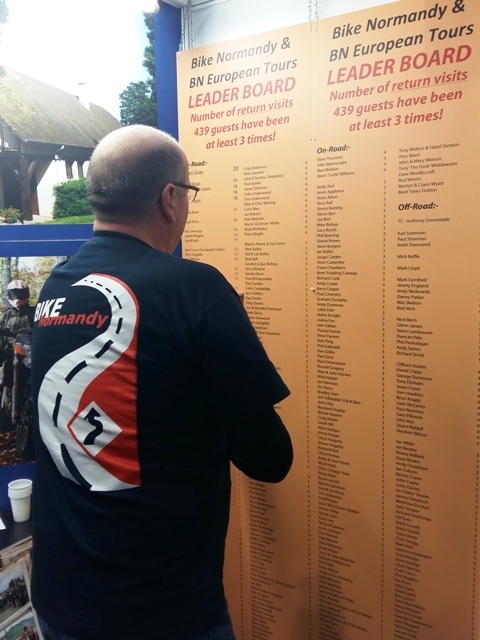 We can’t believe Bike Normandy has been running for 10 years. 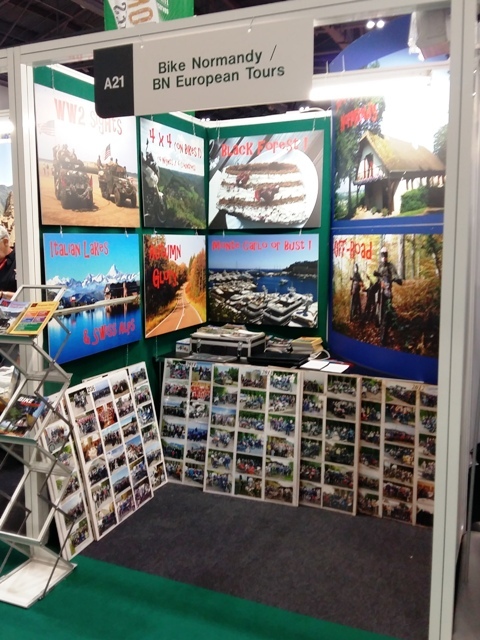 We’ve booked a stand (A90) at the MCN Excel Show from 15 to 17 February, not sure why though as we’ve hardly got any spaces left this summer and are already taking bookings for 2014! 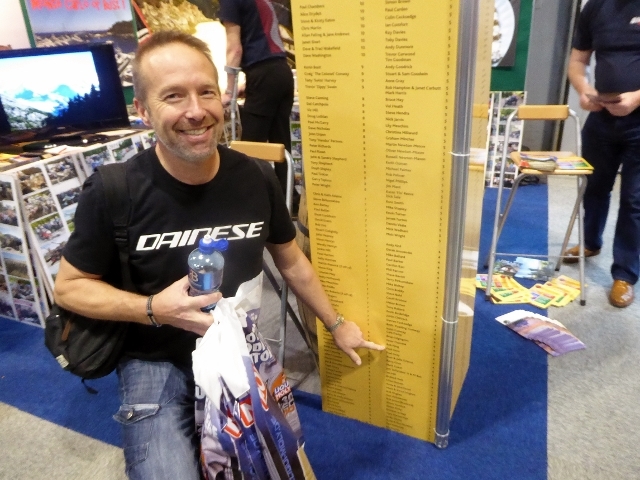 The winner of our competition for tickets to the NEC Show was Tim Hewitt, we’ll run another for a free ticket to the MCN Excel Show in our next newsletter. 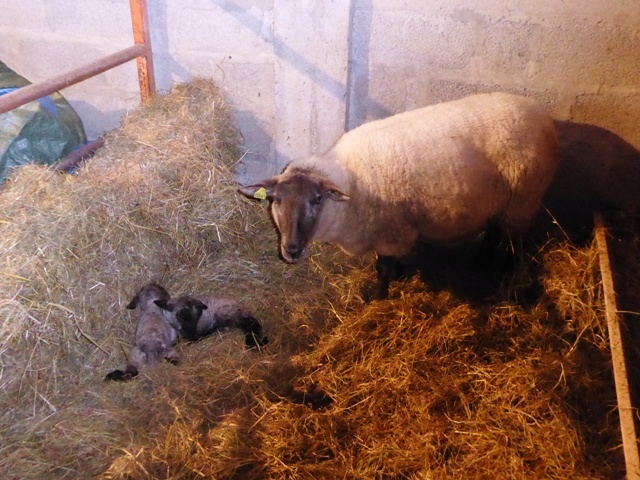 The lambs have started to arrive early and our 7th was born in the snow earlier today. The road bikes are hibernating, and we’ve (sorry John) has just got a 2012 KTM 350 EXC-F, thanks to Rod Veck at Fowlers for sorting it – how many other UK dealers would take a French registered bike in PX? 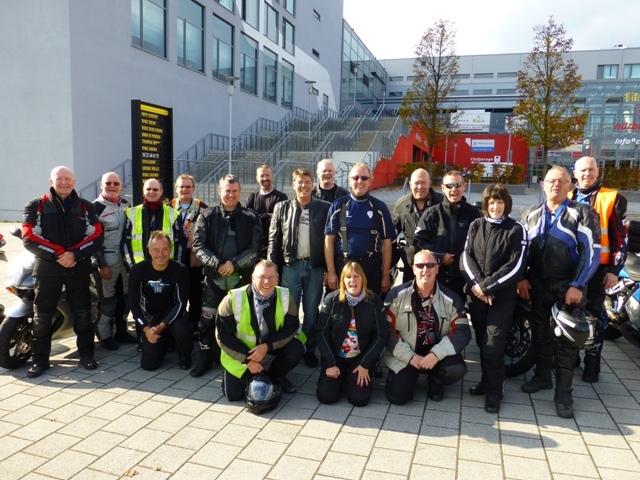 October 2012 – Just finished the “road” season with our final tour to Magny Cours – great group, great riding & no rain on race day!! Now into the off-road season. 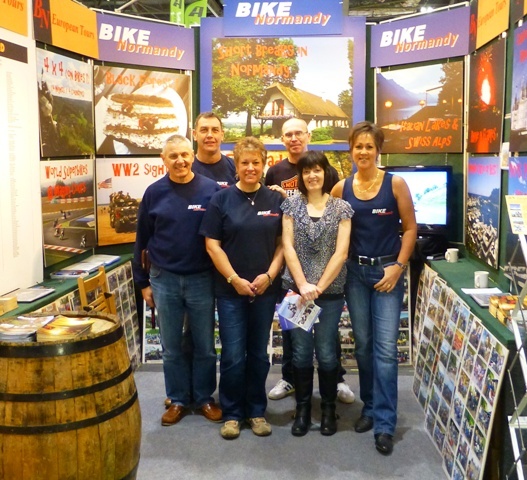 Will be at the NEC bike show 24 Nov – 2 Dec on stand E14 in the Escape Zone – come and see us if you’re there. 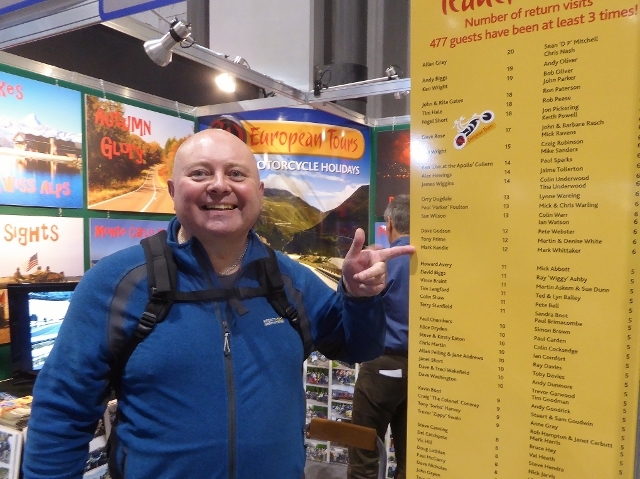 27 Sept 2012 – The places quickly went on the 4×4 Tour and the Monte Carlo or Bust Tour – see the reviews under Testimonials – European Tours and get you name down for next year! 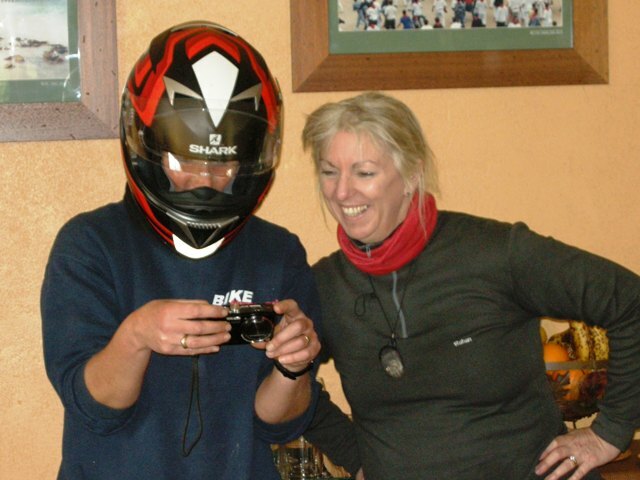 24 July 2012 – Late Cancellation – now 2 places on our 4×4 Tour (on motorbikes!) 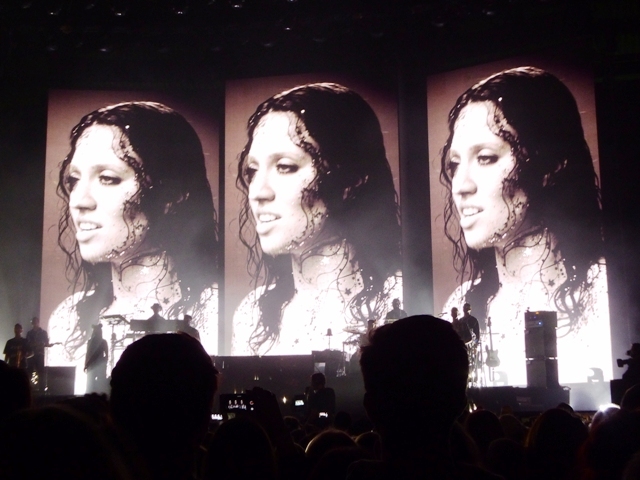 22-26 September 2012. 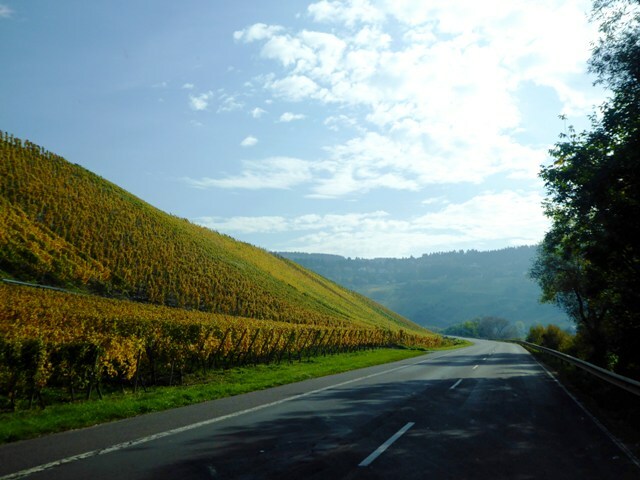 Still 2 places available on the Monte Carlo or Bust Tour 21 – 29 August 2012. 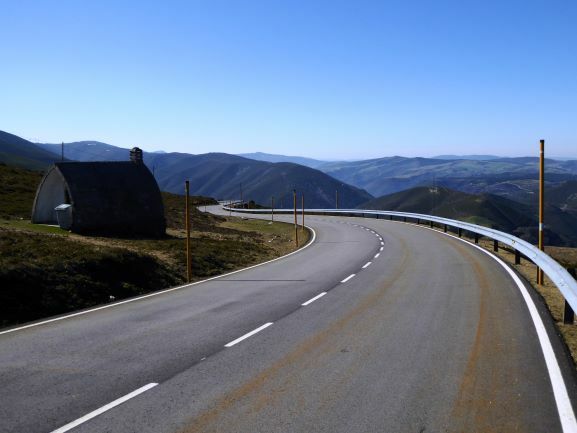 Just back from the Picos & Pyrenees Tour – see the fab review & photos under Testimonials Tours. Off to the Black Forest tomorrow. 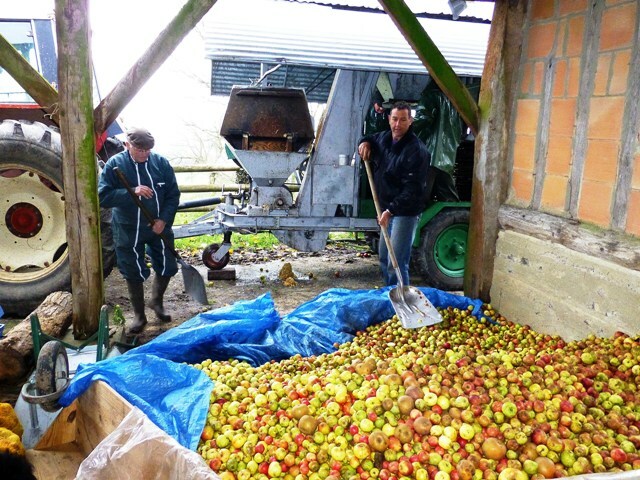 June 2012… STOP PRESS! 2 bike places now available on the Monte Carlo or Bust! 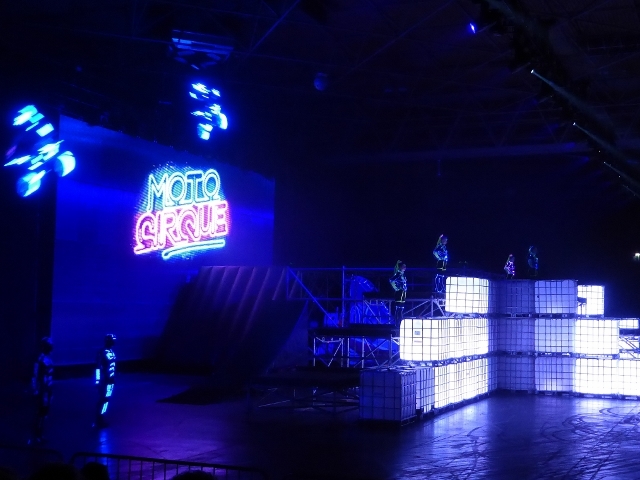 Tour 21 – 29 August 2012 – first come – first served ! 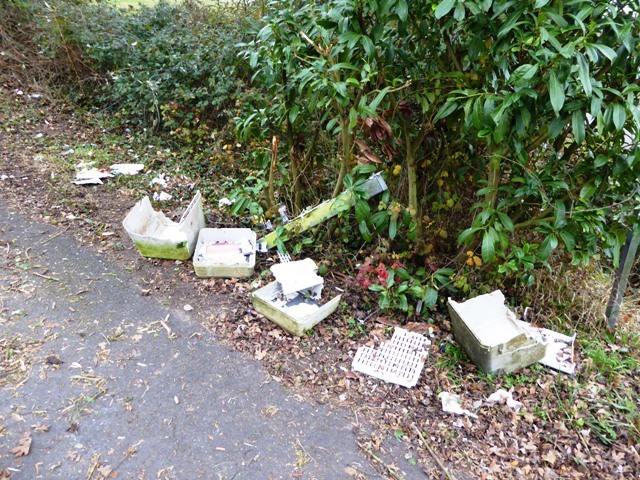 16 January 2012… We’ve been using a couple of Midland Action Cameras for a while now. We occasionally film guests and then play the video back on our large screen TV over breakfast. The video quality is excellent and we’ve started selling the cameras due to an increased demand. The cameras are HD, have a rechargeable battery that lasts up to 3 hours, an image stabiliser and a host of other features. 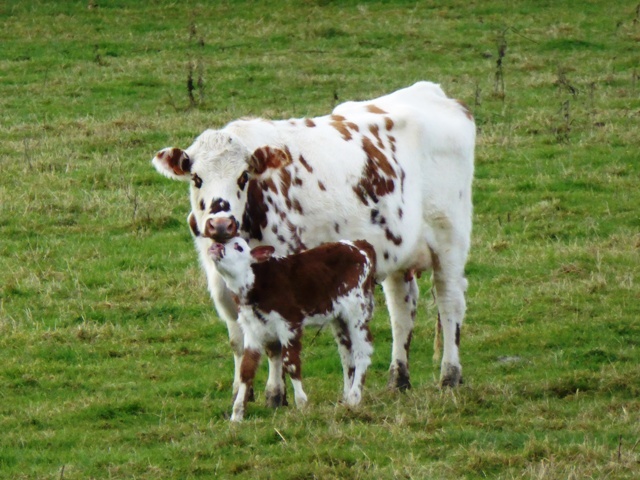 The cameras cost £160 each and we’ll shortly be able to take payment for them by credit card – giving you peace of mind. 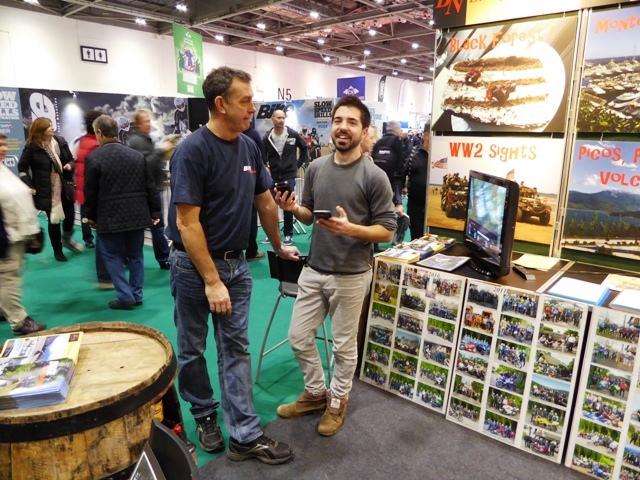 All of the videos that we use at the shows have been shot using these cameras – visit the Bike Normandy stand at the MCN Excel show to see just how good the Midland Action cameras are. 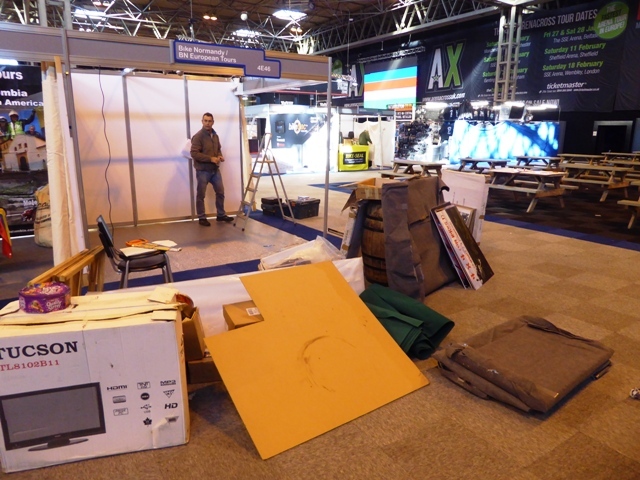 9 December 2011…We’ve just returned from a successful NEC Show, the crowds were back and the buzz continued from last year. The new Explorer was a ‘Triumph’. 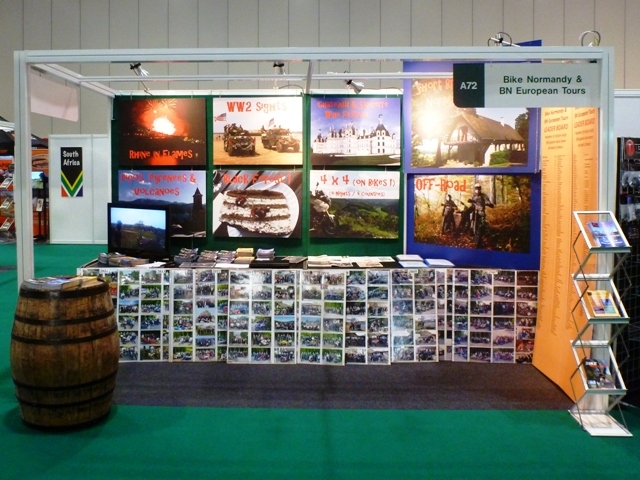 We’ve booked stand N80 at the MCN Excel Show in London from 2-5 February 2012. 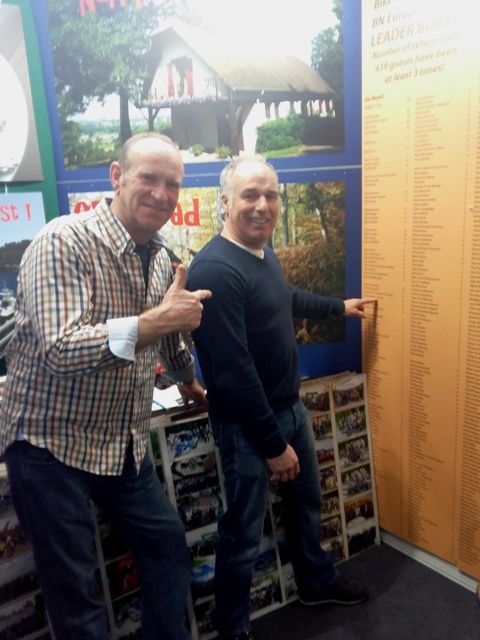 We can’t believe how many bookings we’ve taken for 2011 – our Black Forest & Monte Carlo or Bust Tours are both full and we’ve guests on a reserve list. There’s very limited availability on our Picos and 4×4 Tours while our WW2 Sights and WSB at Magny Cours have plenty of spaces available. Our short breaks remain popular and there’s only one weekend left next summer when we’ve full availability – September 29 to October 1. Other dates are partially available. 24 October 2011… Earlier this month we finished our ‘on-road’ season seeing two world champions crowned at Magny Cours – Carlos Checca and Chas Davies. 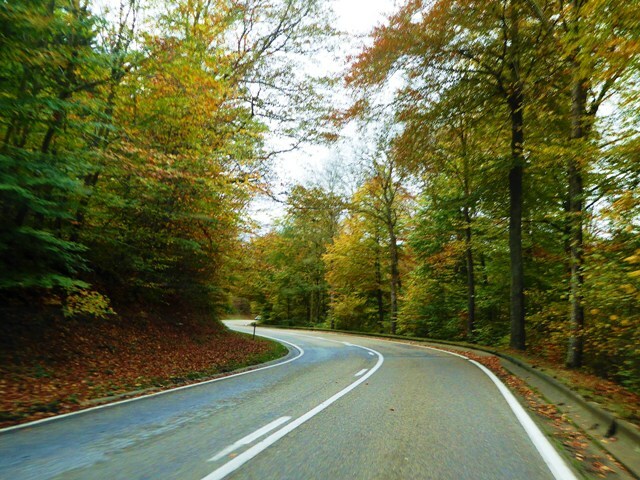 The weather was simply stunning and the roads stupendous. We’ve been researching our Monte Carlo or Bust Tour and have the routes / hotels etc for the way down, we’re off tomorrow to do the way back, hopefully changing the van in the process. 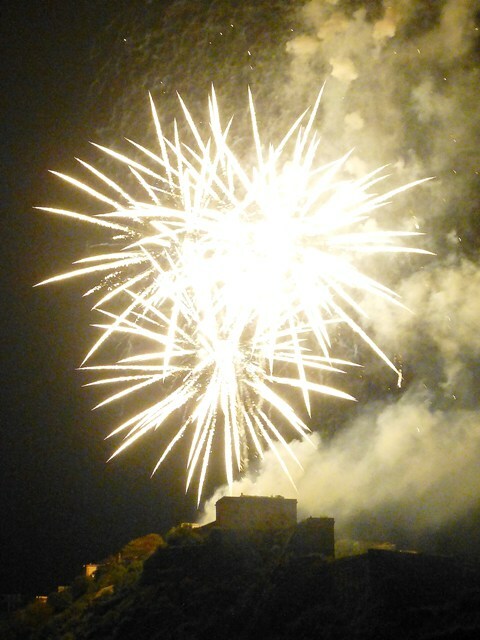 Our dates are filling up for 2012, we only have 5 weekends left in the summer, our Black Forest Tour has just 1 place left, the ‘Monte Tour’ is 50% full and we haven’t even completed the research! 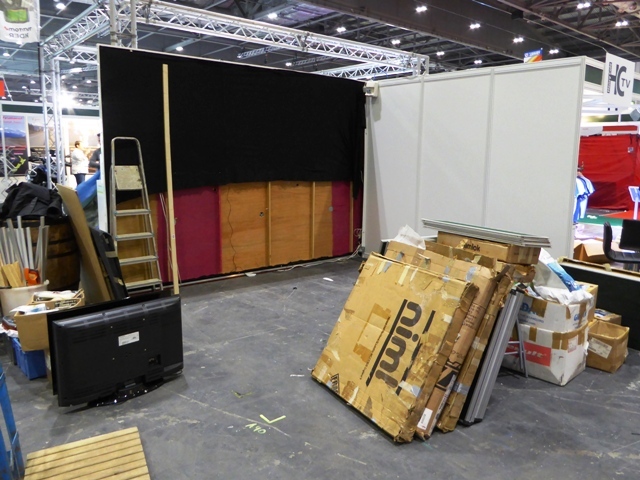 There won’t be much space left after the NEC show next month. 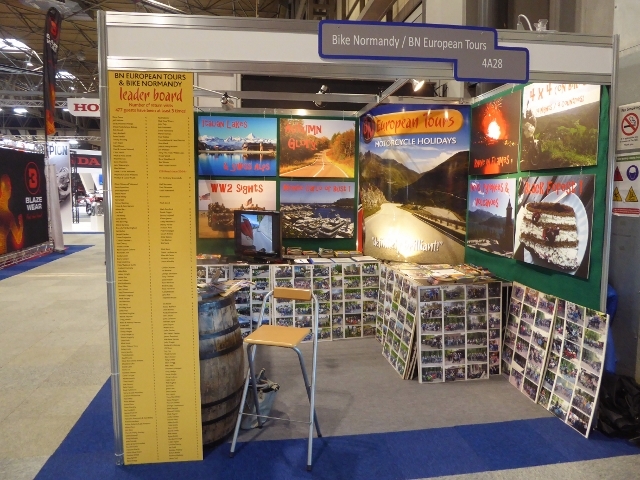 Come and see Bike Normandy on stand E10 in the Escape zone. 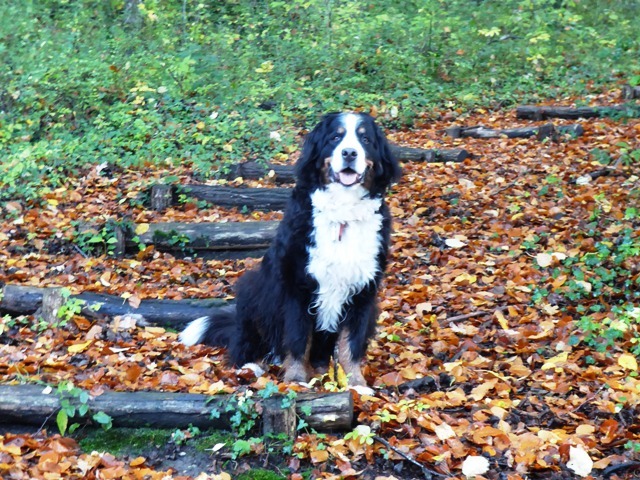 8 August 2011…The Black Forest Tour is now full. 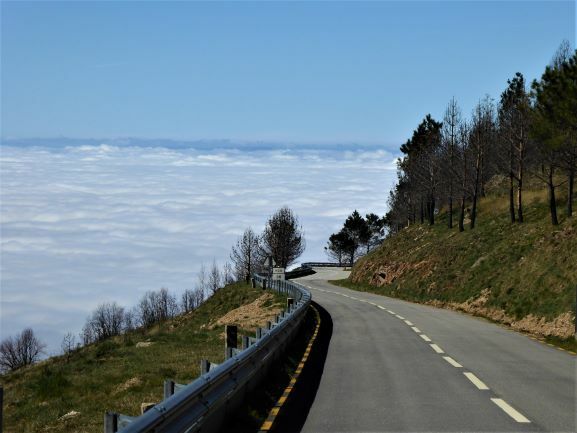 We’ve just returned from the Picos, Pyrenees & Volcanoes Tour – see the fab review & photos under Testimonials European Tours. 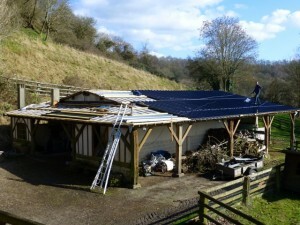 We’ll be at the NEC at the end of November 2011 – come & see us on Stand E10 in the “Escape” section. 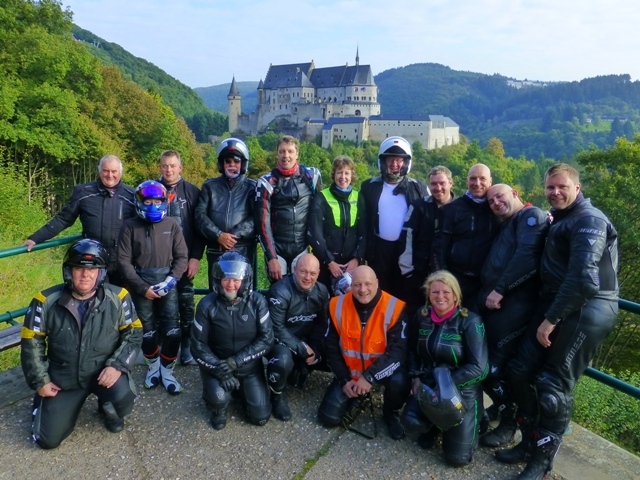 23 June 2011… Our Black Forest and Vosges Mountains Tour was full but we’ve had a couple of cancellations so there’s now 2 bike places available on this Tour. 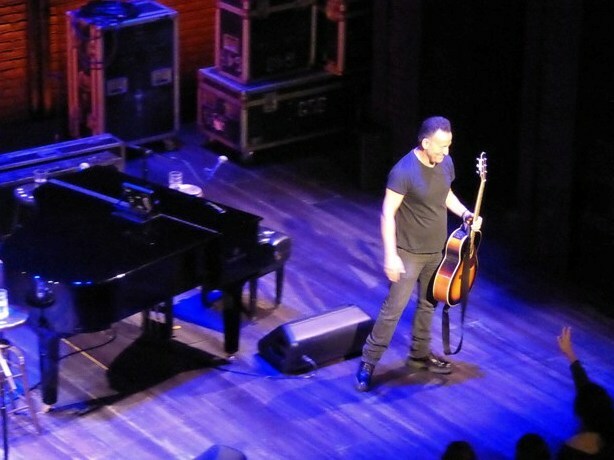 2 June 2011… Just got back from a very successful 4×4 Tour, the weather was excellent with just a couple of hours rain during the whole trip. 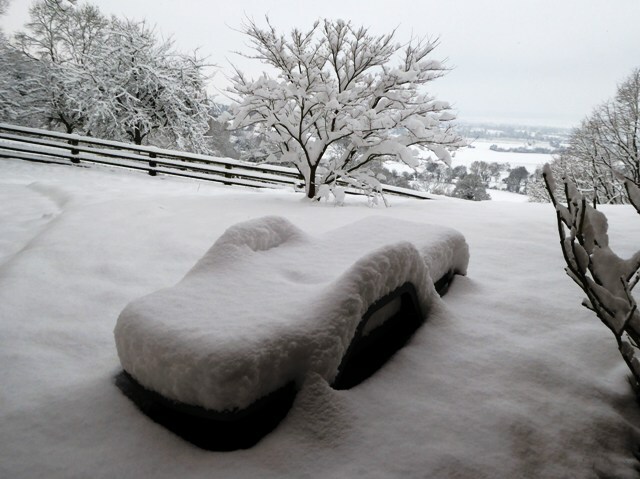 As one person put it “stay out of Luxembourg on Tuesday mornings”. There’s a new calendar under ‘Check Availability’ – you can now view dates for the next couple of years! 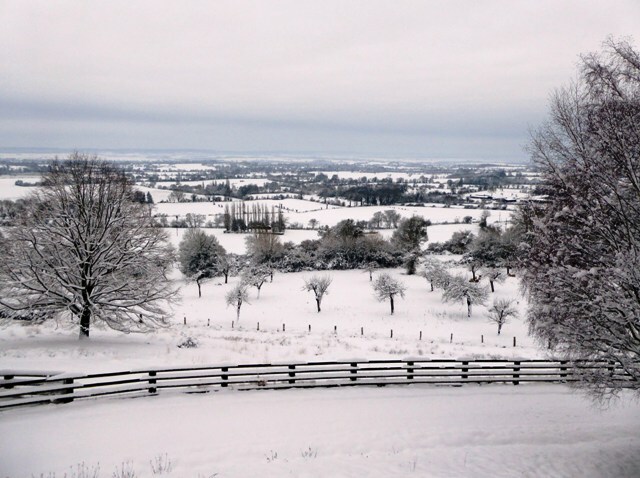 7 dates for short breaks have already been reserved for 2012. 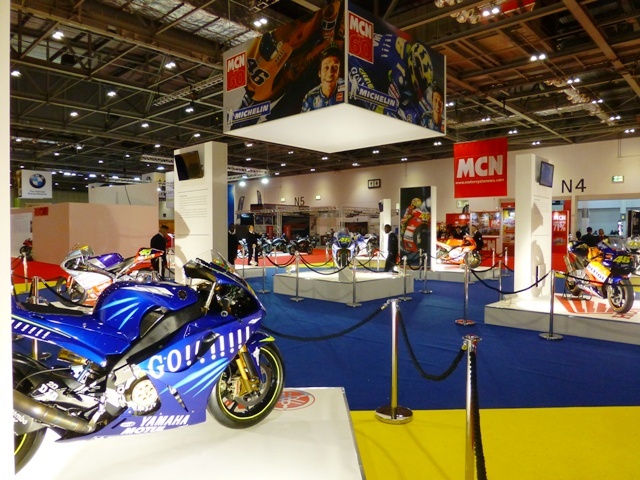 26 February 2011… The MCN Excel Show was good for us and we now have bookings through out the summer. 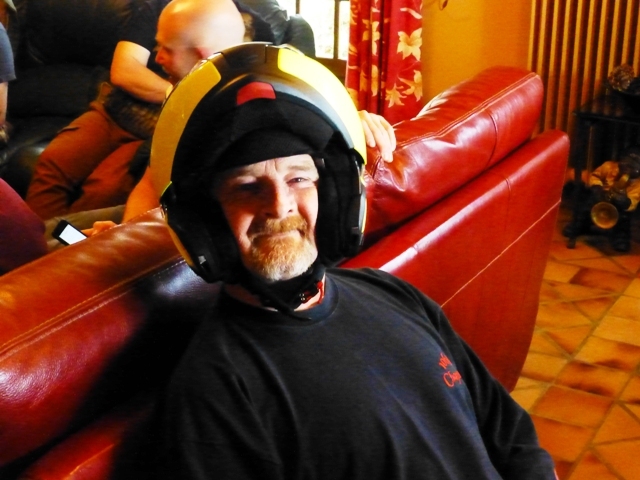 We’re just about to start the off road season, but John can’t ride as he’s waiting for an operation on his right knee (worn out cartlidge from his football days). Instead of him there will be another French guide closing the groups. 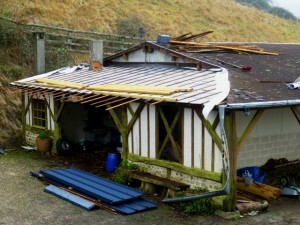 31 Jan 2011… We sent out our new newsletter over the weekend, we promise that it’ll be a regular occurance. It won’t just be about availability but will include snippets regarding living in France and the occasional competetion. 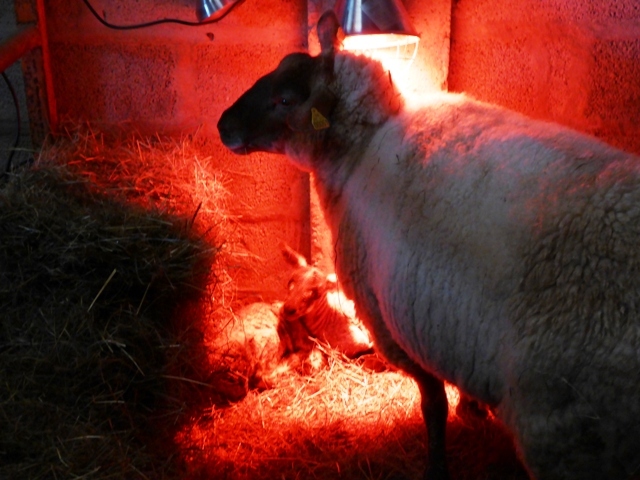 Currently it’s freezing over here, despite this we’ve got 4 lambs. 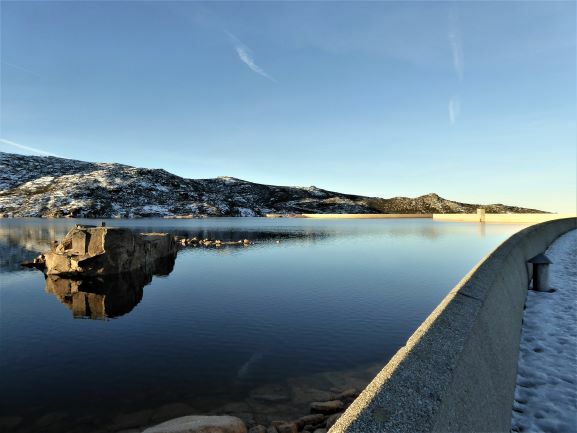 Three of our European Tours – 4×4, Picos, Pyrenees & Volcanoes and the Black Forest Tour are now full and we even have guests on a waiting list ! 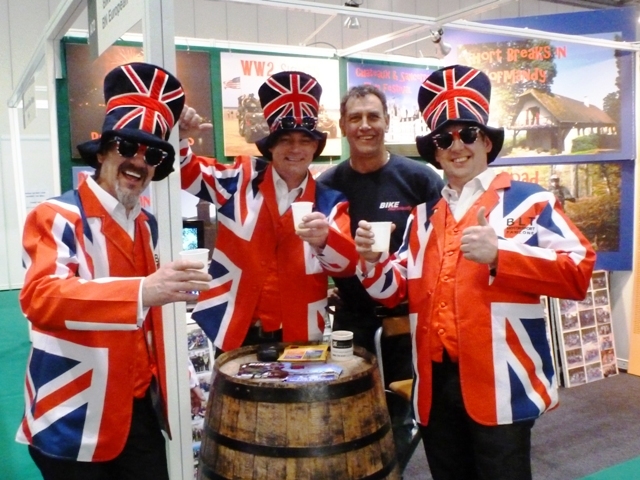 14 Jan 2011…..The NEC Show was much better than the last few years with all of the major manufacturers there, the buzz was certainly back. We did well and were surprised when virtually all of our guests from the summer’s Chateaux & Sancerre Wine Festival tour turned up on mass. 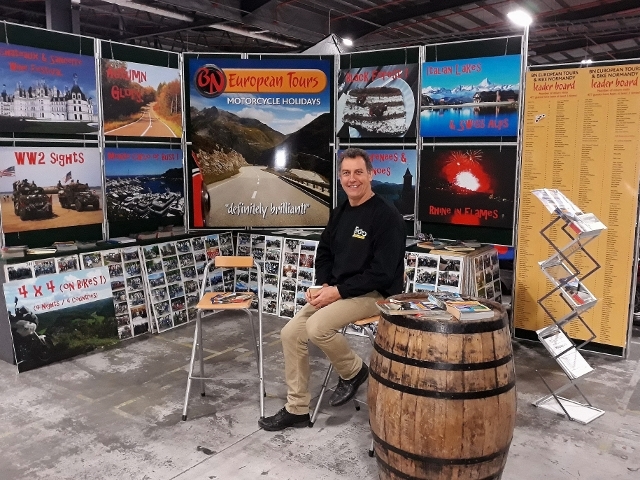 We’ll be on stand N103 at the forthcoming MCN Excel Motorcycle Show 3 to 6 Feb.
Our 2011 European tours are already getting booked up, our 4×4 Tour is already full and our Picos, Pyrenees & Volcanoes Tour has just one bike place left. 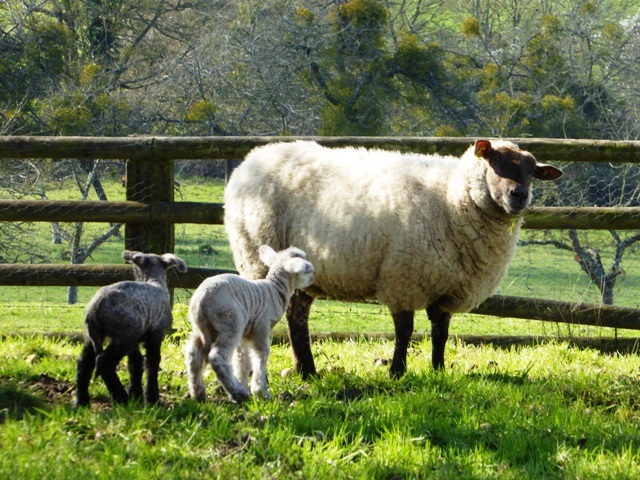 We’ve only got three summer weekends with full availabilty on our short breaks – please see the ‘check availability’ page of this website for more details. All of our off-road trips are full this Spring.